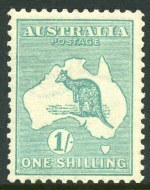 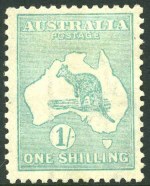 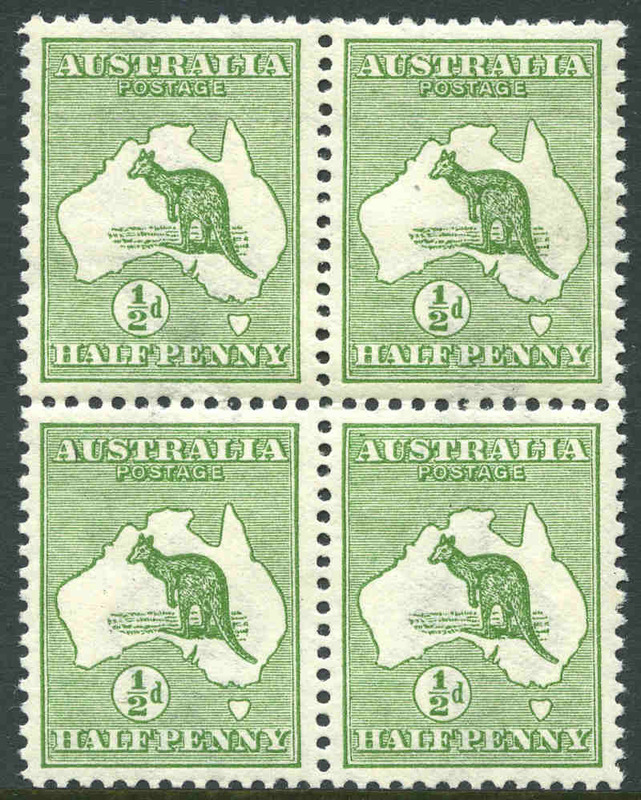 1913 ½d Green normal and perforated large and small OS 1st Wmk Kangaroo blocks of 4 MUH and well centered. (3 blocks). 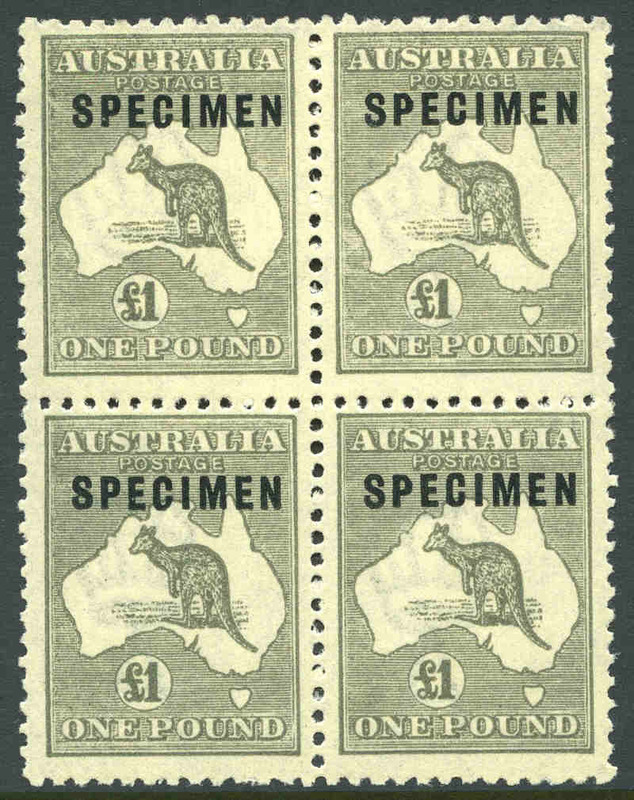 Lovely fresh quality. 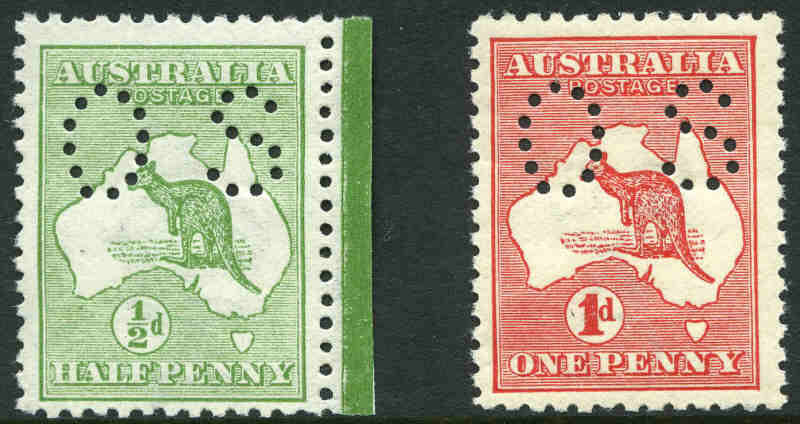 1913 ½d Green, 1d Red Die IIA and 3d Olive Die I 1st Wmk Kangaroo's perforated small OS MLH. 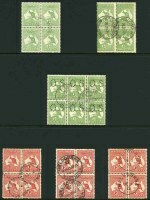 3d with short perf. 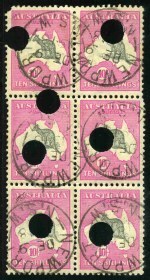 Mixed centering. 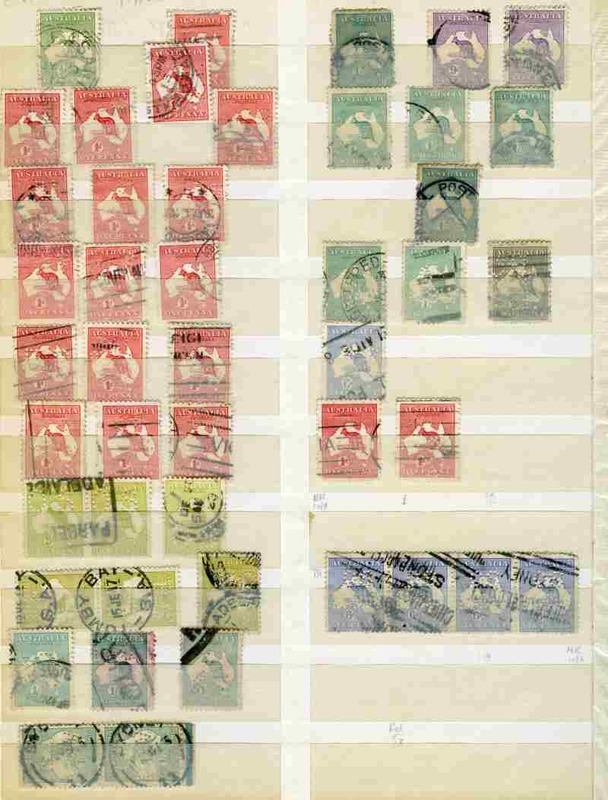 Accumulation of many hundreds of used 1d Red Kangaroo issues in packets and Posthorn stockbook including numerous varieties from the nine plates used. 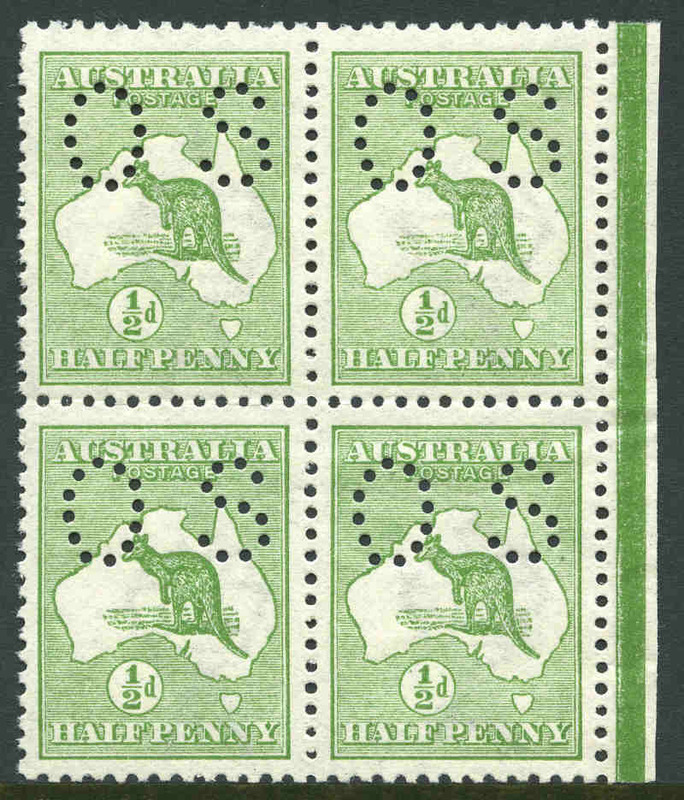 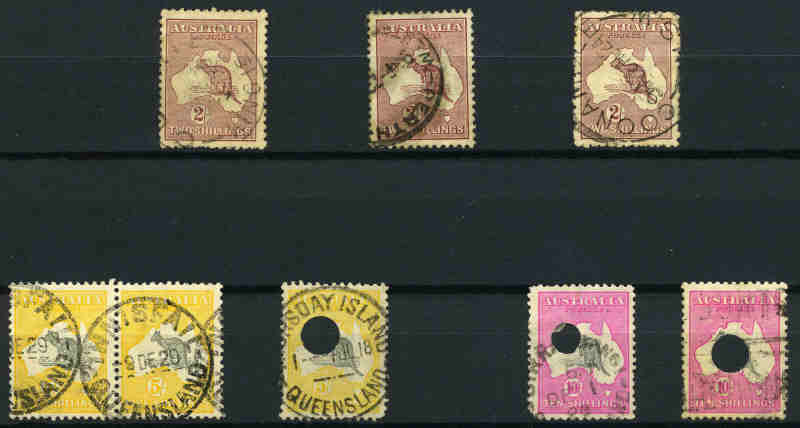 Noted 'Extra Island' - two Tasmanias (3, one perforated large OS), Cut throat perforated small OS, Cracked electro - State II (creased) and many more. 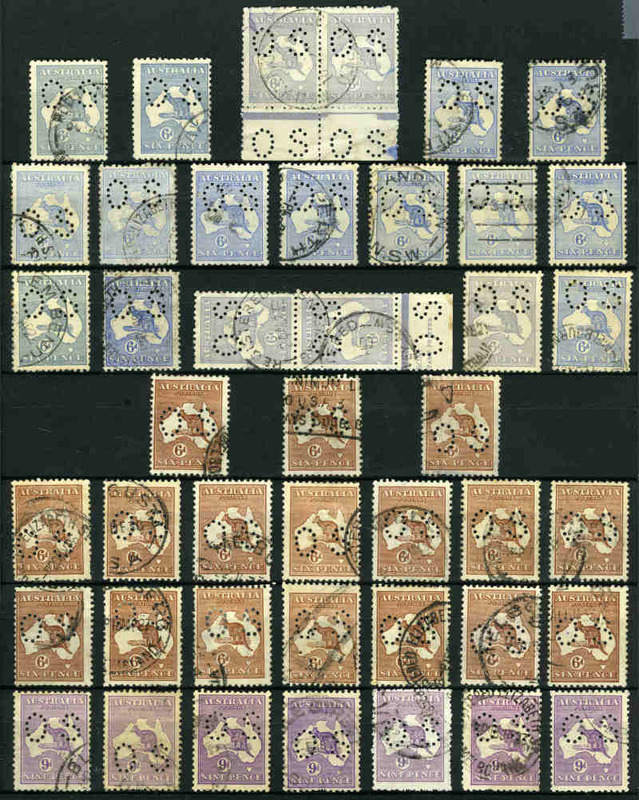 Ideal lot for the specialist variety collector. 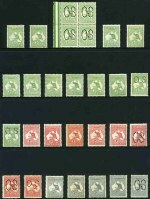 Usual variable condition. 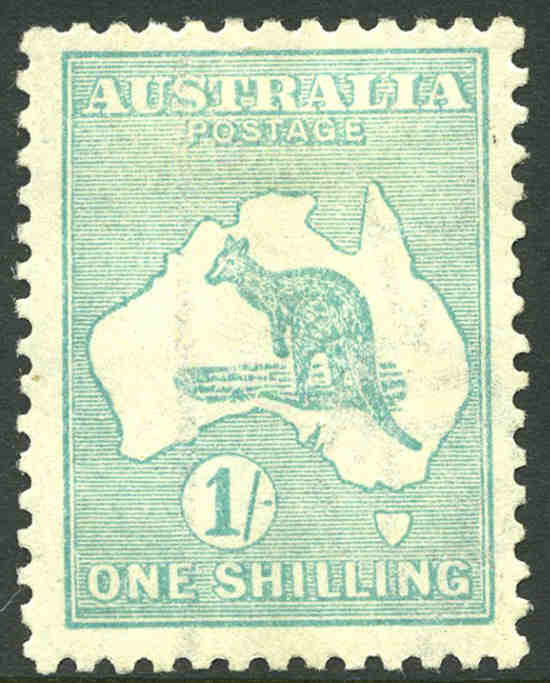 1913 3d Olive Die I 1st Wmk Kangaroo MUH and well centered marginal copy. 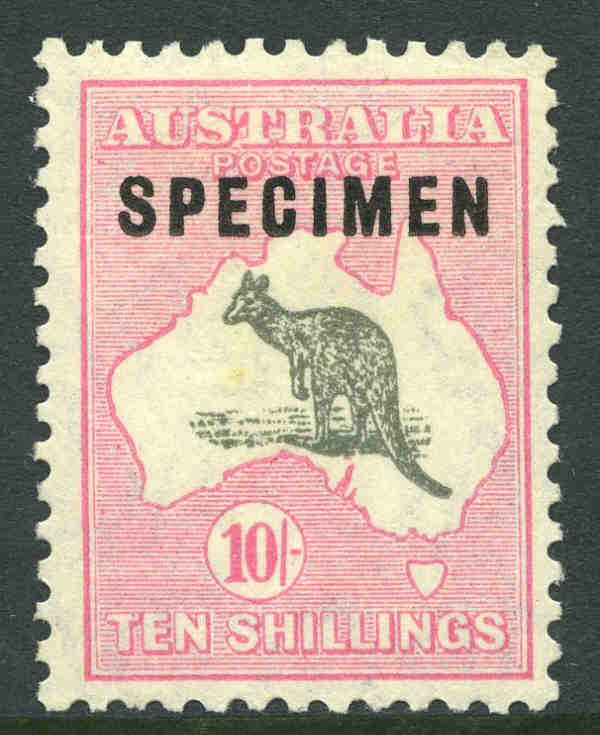 Superb. 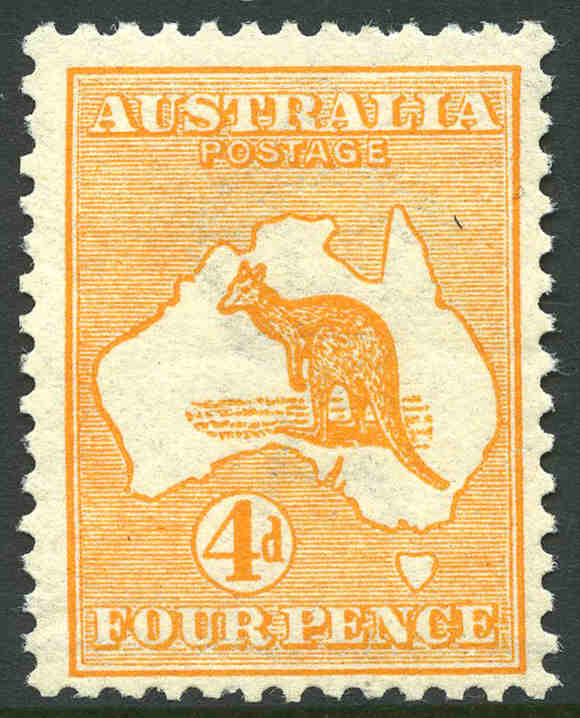 1913 4d Orange 1st Wmk Kangaroo MUH and centered to lower right. 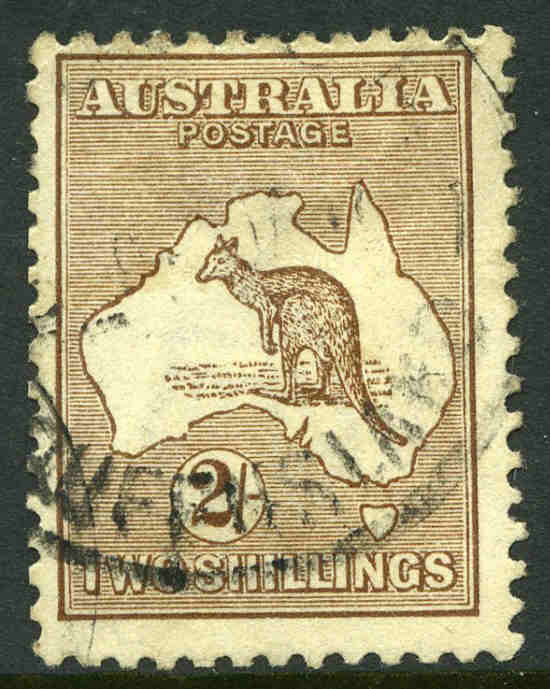 1913 2/- Brown 1st Wmk Kangaroo MVLH and reasonably well centered. 1913 5/- Grey and Yellow 1st Wmk Kangaroo regummed MLH copy, with small repaired tear and a few short perfs. 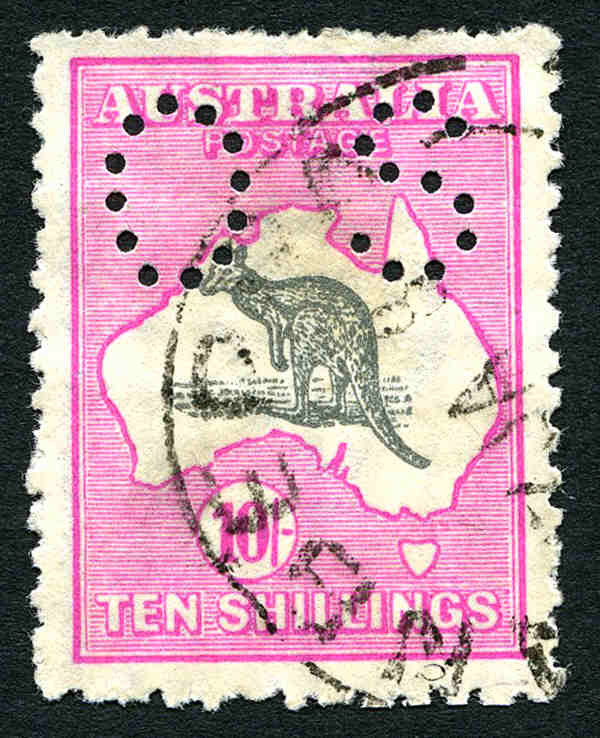 1913 10/- Grey and Pink 1st Wmk Kangaroo MVLH and centered to upper right. 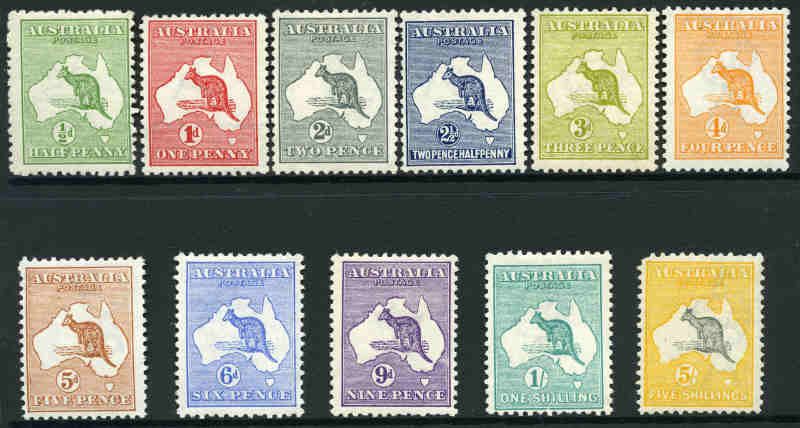 1915-23 2d Grey Die I, 2½d Indigo, 3d Olive Die I, 6d Blue Die II, 6d Brown, 9d Violet Die II and Die IIB and 1/- Emerald Die IIB 3rd Wmk Kangaroos perforated OS, fine postally used blocks of 4. 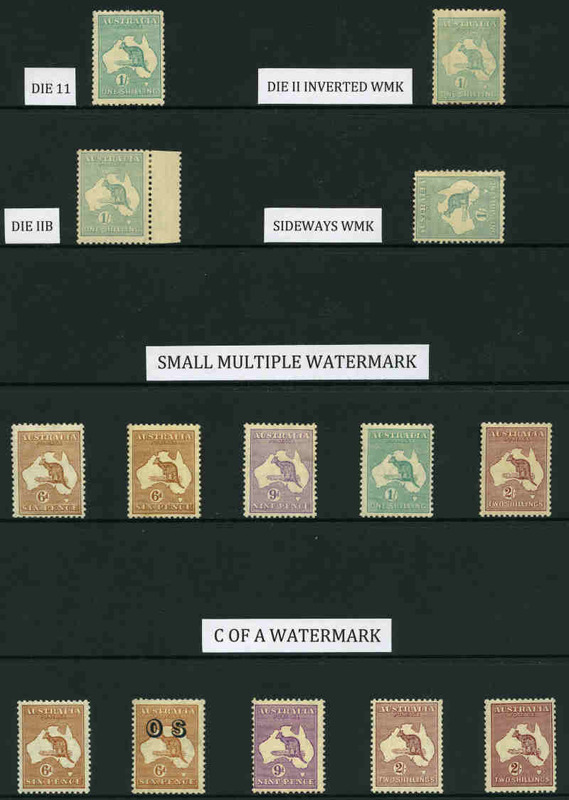 2d with Retouched left frame and shading N.W. 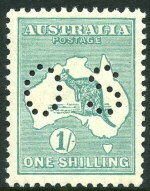 of map variety and 1/- with GPO Melbourne CTO cancellation. 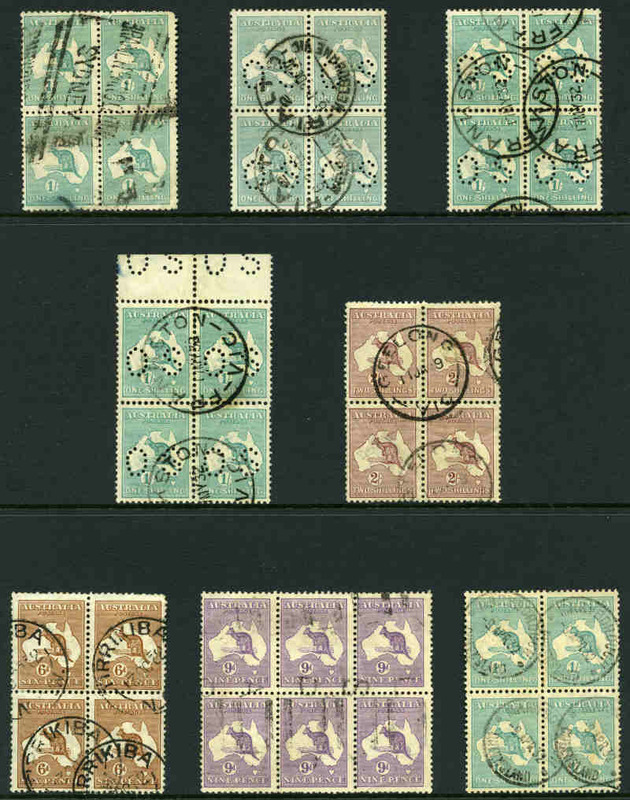 3d creased on top left unit. 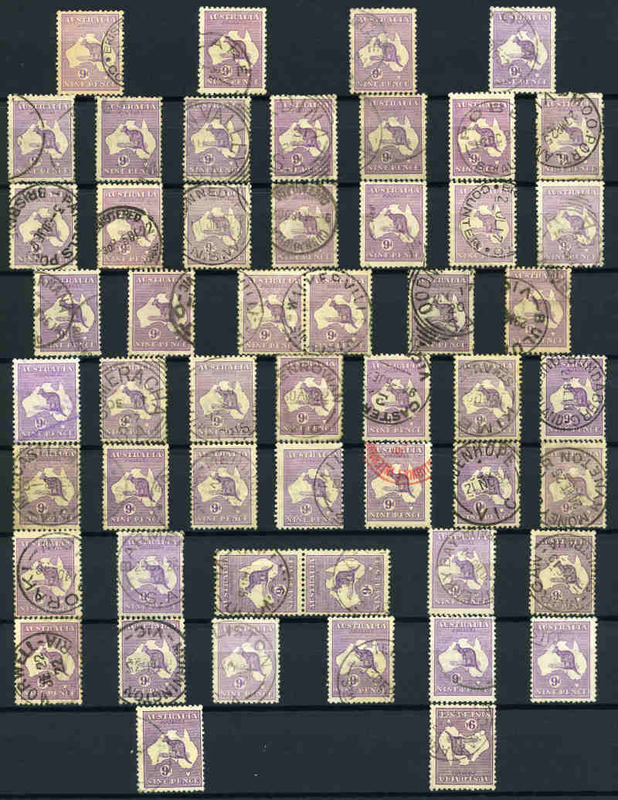 Odd minor fault, but still attractive multiples. 1915-17 2½d Blue, 3d Olive Die 1 and 9d Violet Die II 3rd Wmk Kangaroo's MUH and reasonably well centered. 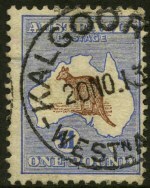 1915 6d Ultramarine Substituted Cliche Die IIA 3rd Wmk Kangaroo good used and reasonably well centered. Rare. 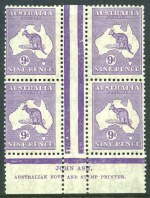 ACSC 19ea. 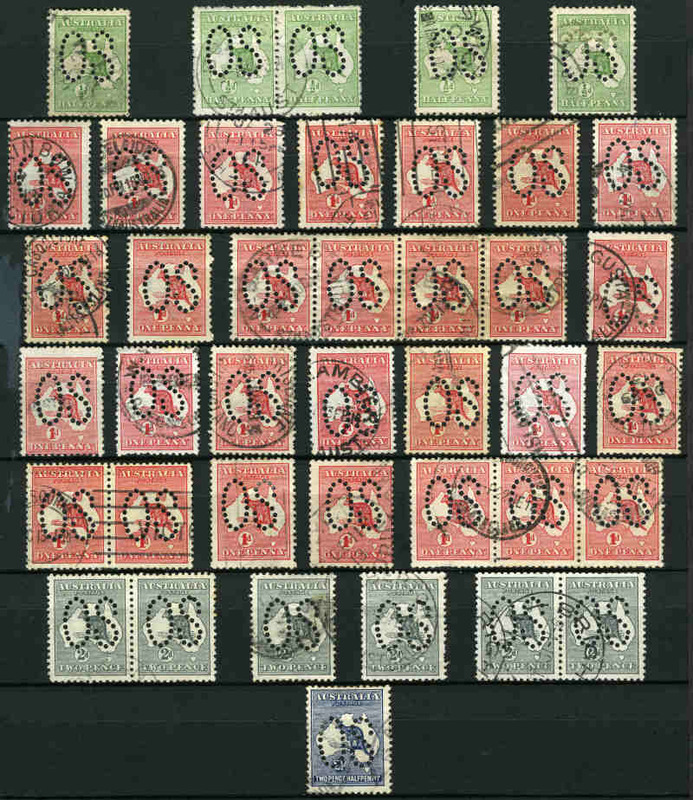 1917-24 6d Brown, 9d Die IIB, 1/- Die IIB, 2/- Maroon, 5/- and 10/- 3rd Wmk all perf OS except 6d, plus 1929 9d (2, one perf OS), 1/- perf OS and 5/- (2, one perf OS) Small Mult Wmk and 1932 6d O/P OS (2), 5/- C of A Wmk Kangaroos all CTO with gum. 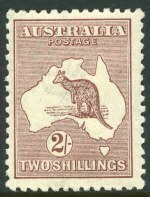 Also 1932-34 10/- and £2 C of A Wmk Kangaroos O/P Specimen Type D MLH and 1914 6d Claret Kooka CTO. 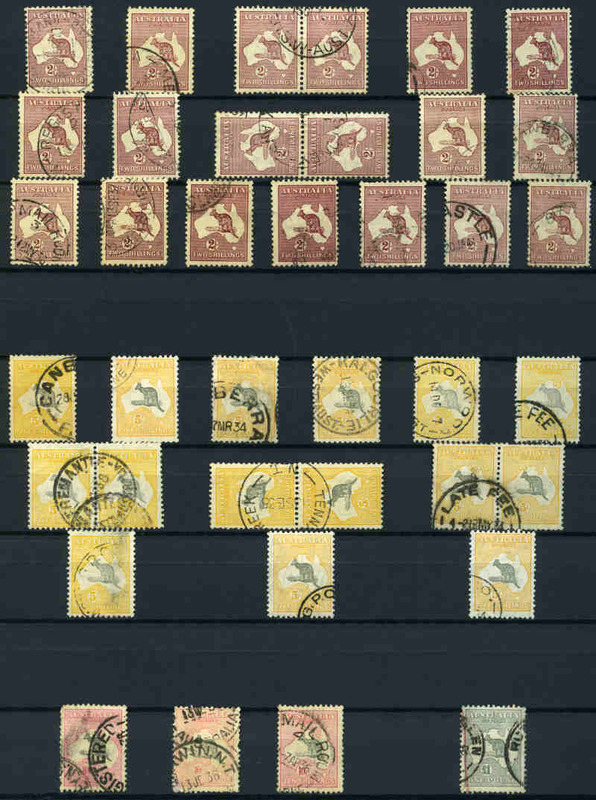 9d Small Mult Wmk without gum. 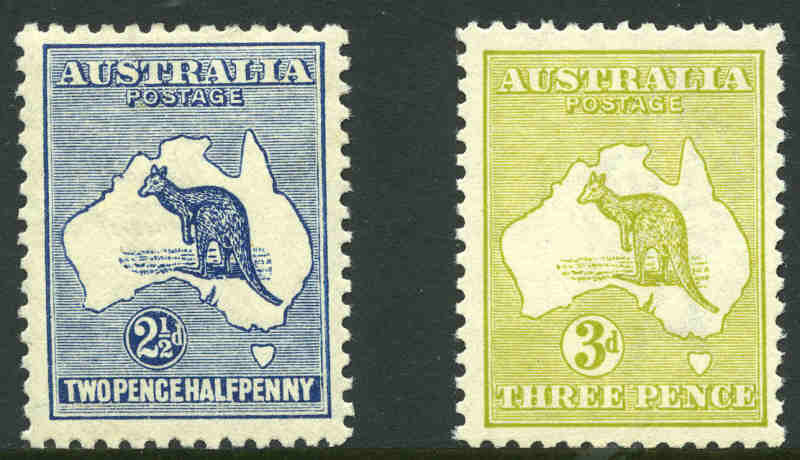 Odd perf fault and mixed centering. 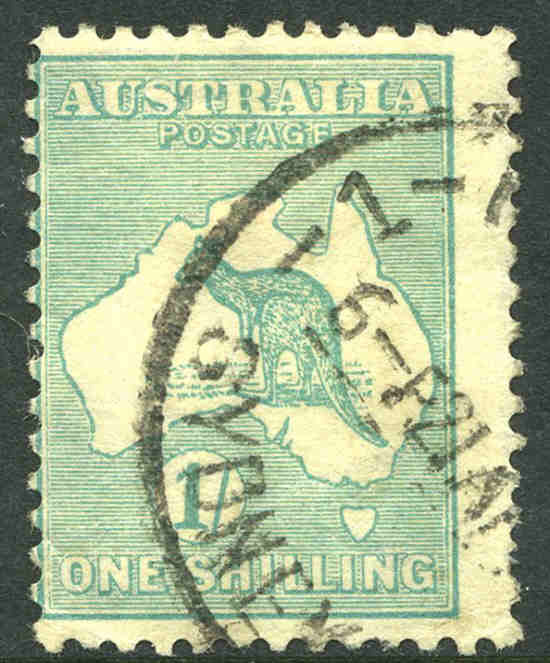 1916 1/- Emerald Die II 3rd Wmk Kangaroo with Inverted Watermark MLH and reasonably well centered. 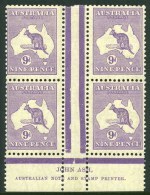 ACSC 32a. 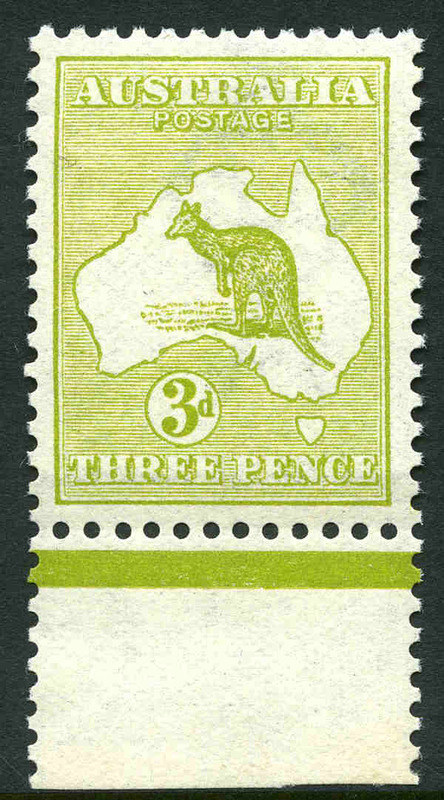 1920 1/- Emerald Die IIB 3rd Wmk Kangaroo with "Sideways Watermark" MUH and centered to base. 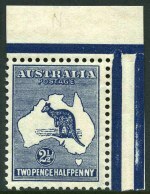 2 blunt perfs. 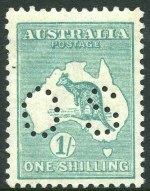 1920 1/- Emerald Die IIB 3rd Wmk Kangaroo perforated OS MUH with few short perfs, centered to base. 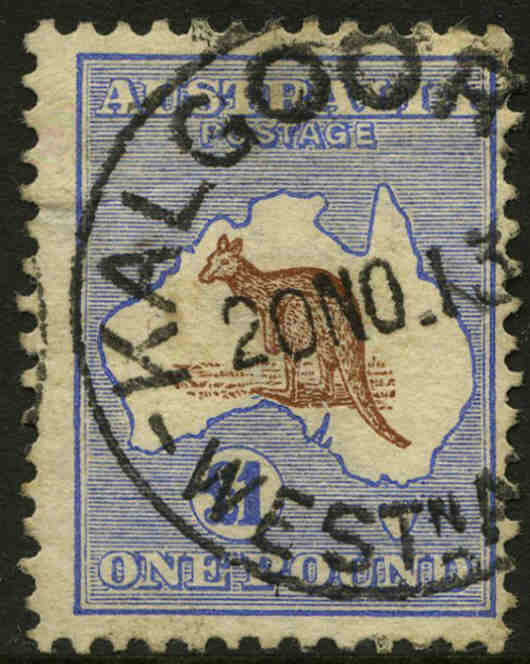 1916 2/- Brown 3rd Wmk Kangaroo with "Inverted Watermark" fine used and centered high with one shortish perf. 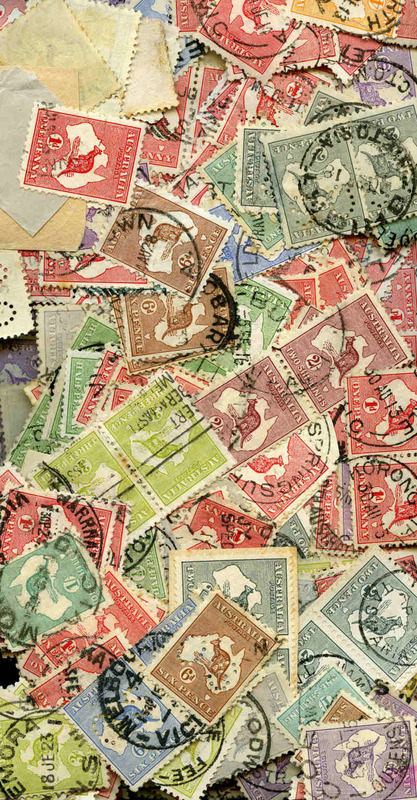 Scarce. 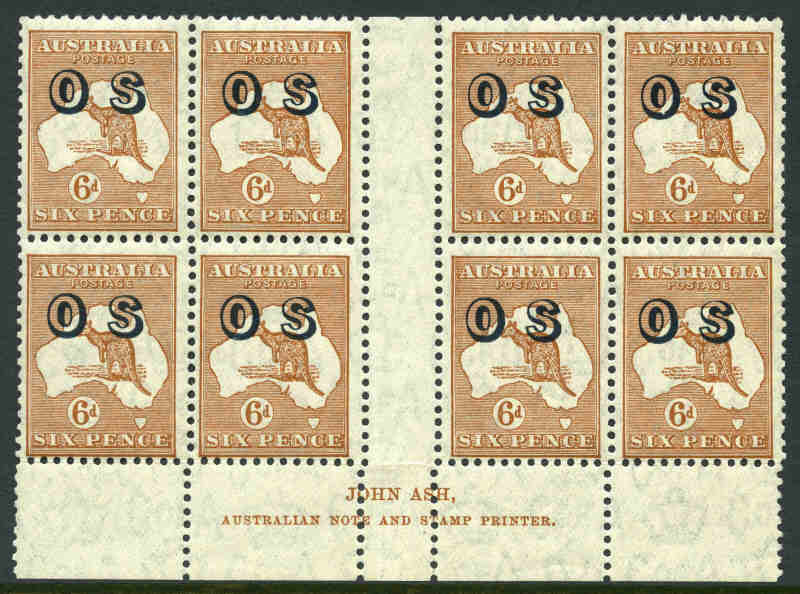 ACSC 37a. 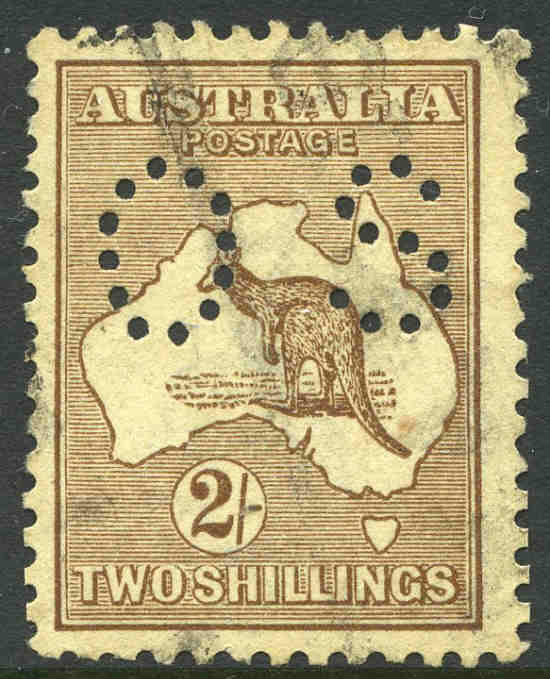 1916 2/- Brown 3rd Wmk Kangaroo perforated OS MUH and reasonably centered, with very faint diagonal bend. 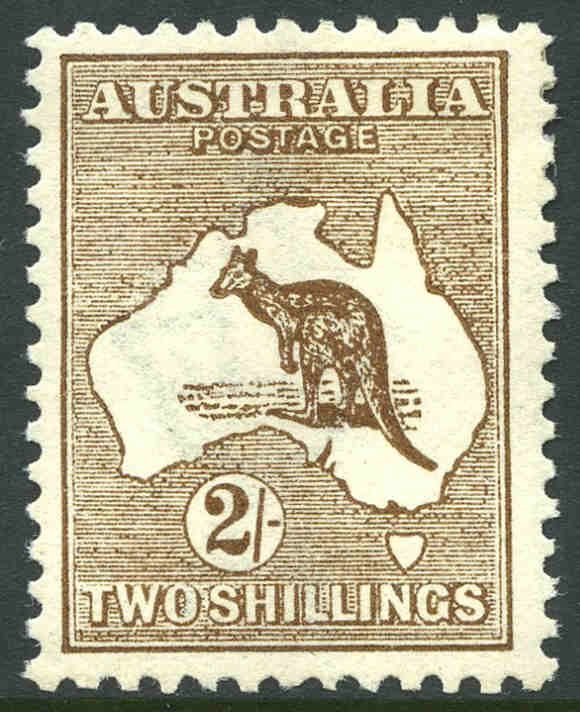 1916 2/- Brown 3rd Wmk Kangaroo perforated OS with "Inverted Watermark" fine used and reasonably well centered. 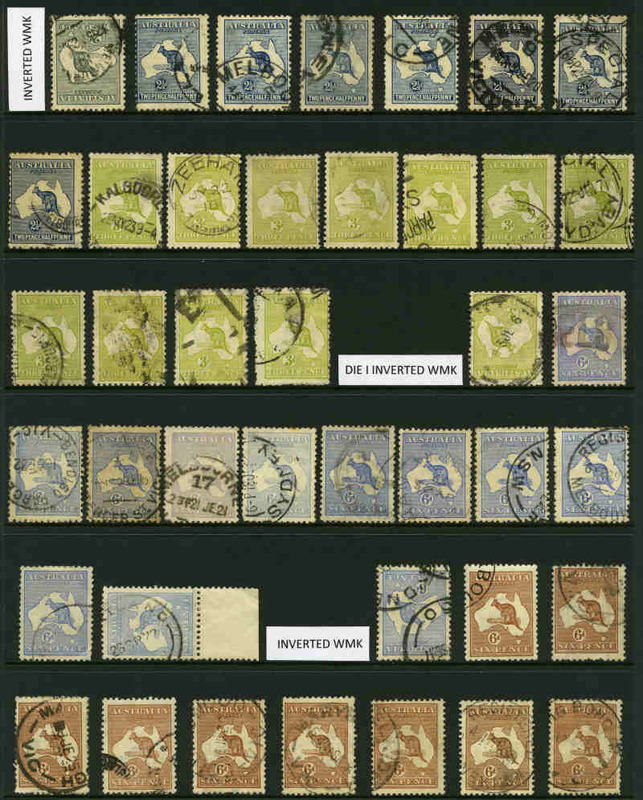 Few blunt perfs at lower left, hardly detract. 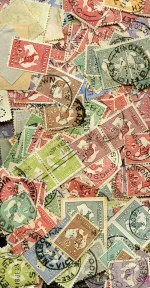 Scarce. 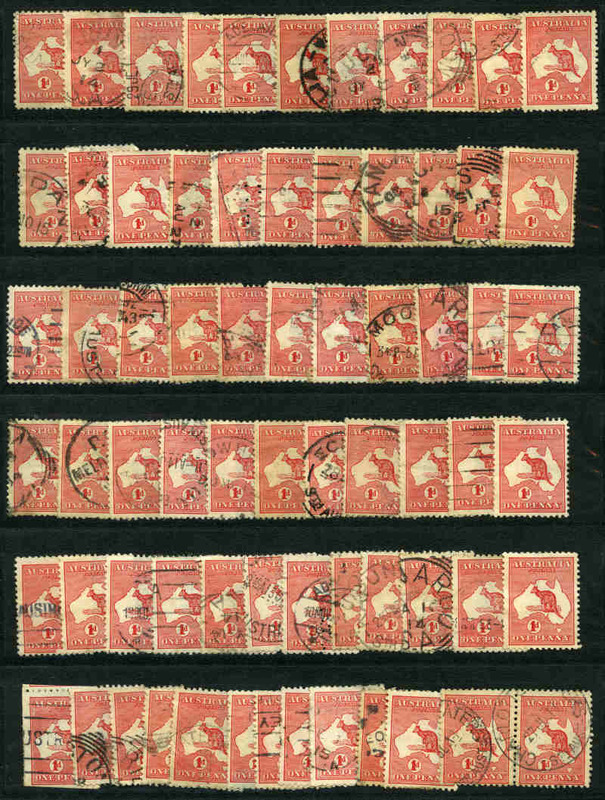 ACSC 37a. 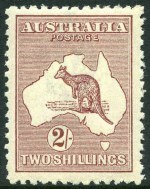 1924 2/- Maroon 3rd Wmk Kangaroo MUH and reasonably well centered. 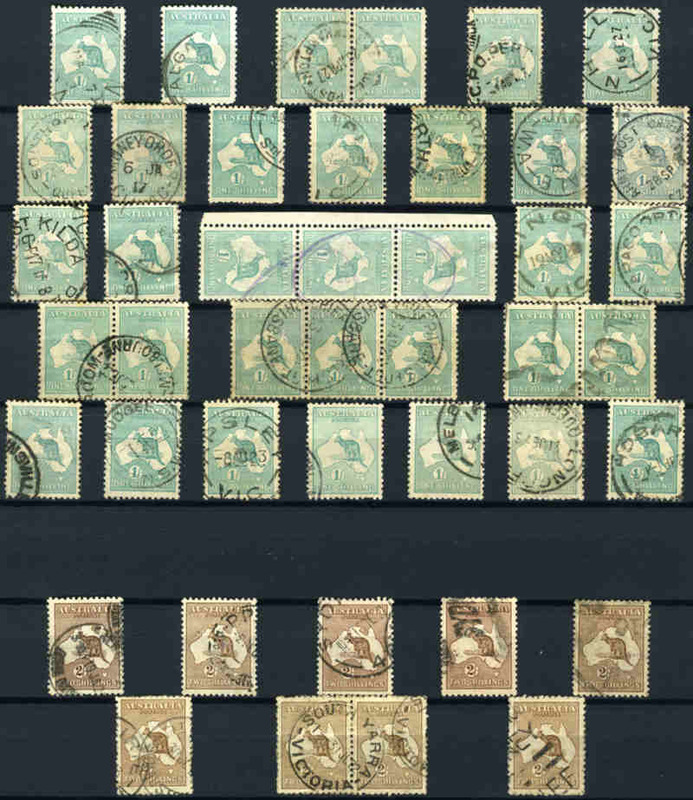 Few blunt perfs at lower left. 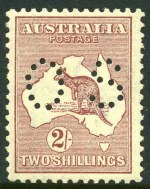 1924 2/- Maroon 3rd Wmk Kangaroo MVLH and well centered. 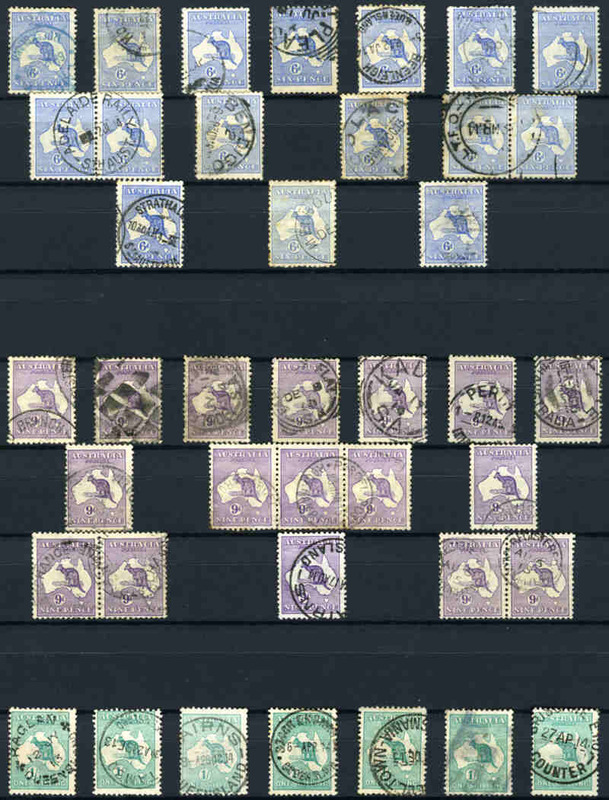 Superb. 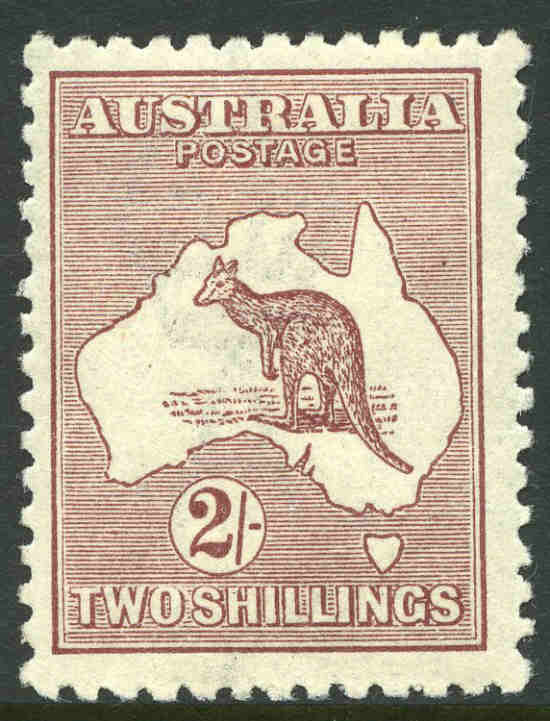 1924 2/- Maroon 3rd Wmk Kangaroo perforated OS MUH and reasonably centered. 1918 5/- Grey and Deep Yellow 3rd Wmk Kangaroo perforated OS MLH and well centered. 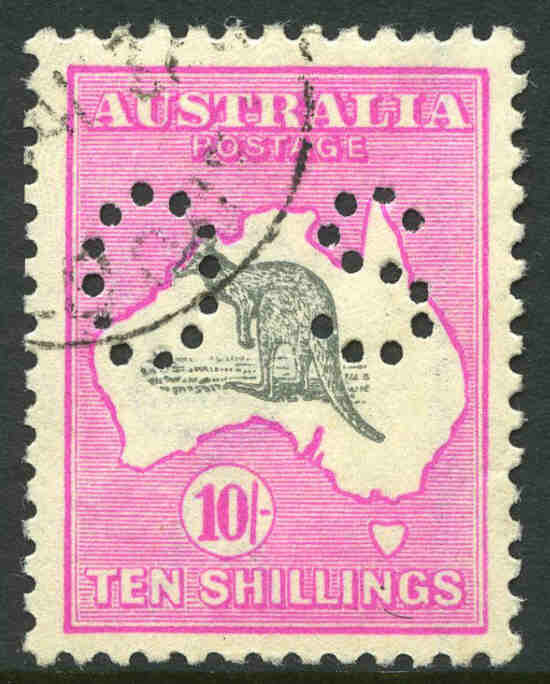 1917-18 5/- Grey and Pale Yellow and 10/- Grey and Pale Aniline Pink 3rd Wmk Kangaroo's perforated OS, CTO with gum and well centered. 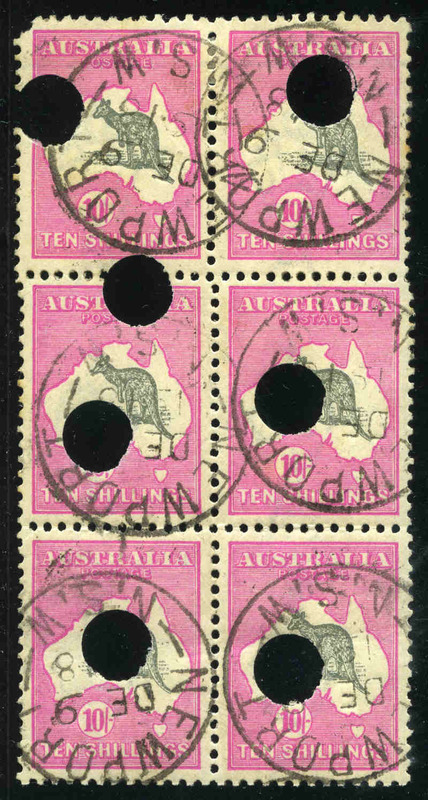 1917 10/- Grey and Pink 3rd Wmk Kangaroo block of 6 with telegraph punctures fine used, cancelled with neat C.D.S cancellations of Newport NSW. 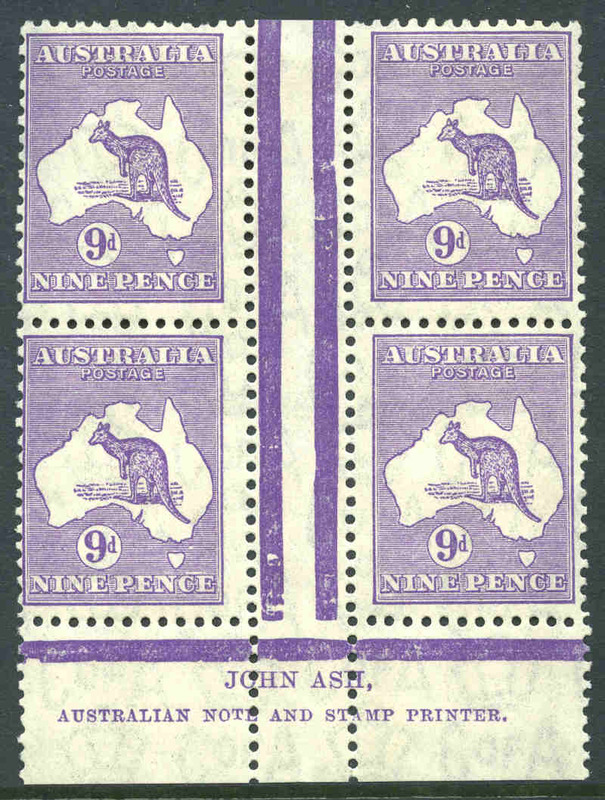 Top left unit with missing corner and lower units lightly creased. 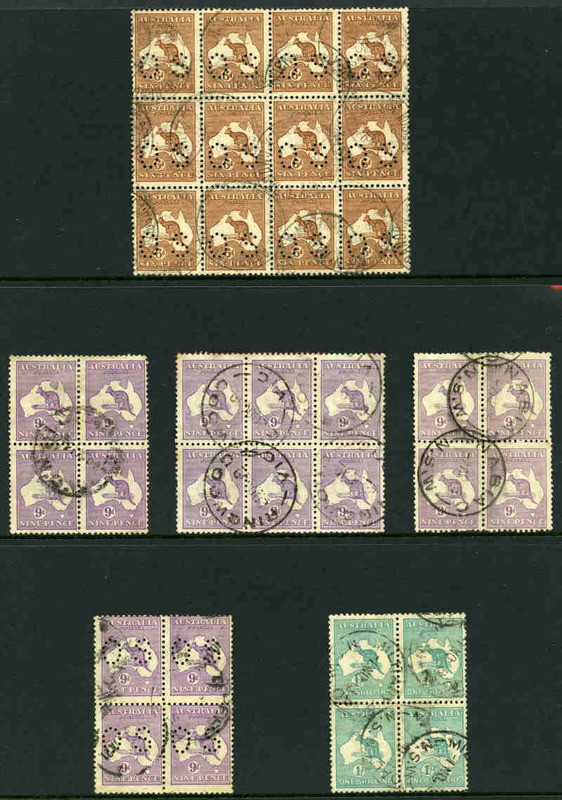 Attractive and rare multiple. 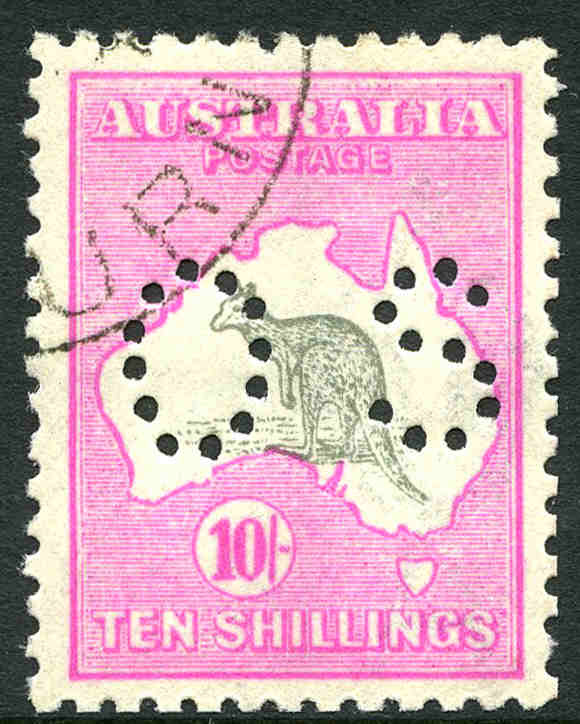 1917 10/- Grey and Deep Aniline Pink 3rd Wmk Kangaroo perforated OS, CTO without gum and well centered. 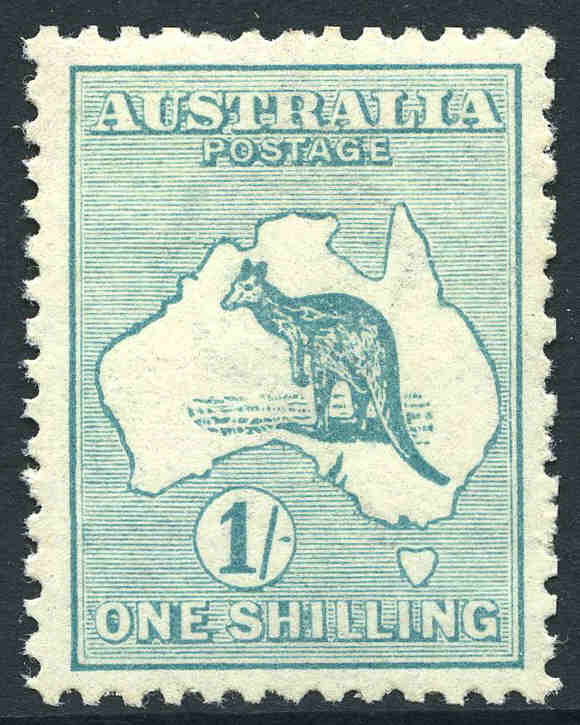 Superb. 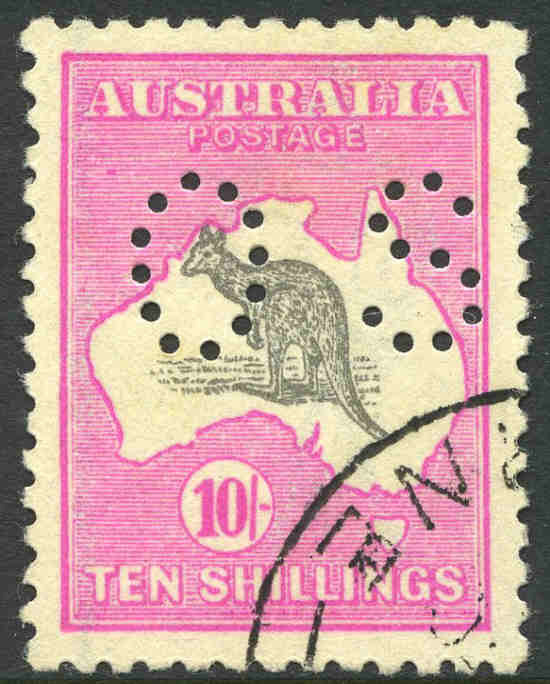 1917 10/- Grey and Deep Aniline Pink 3rd Wmk Kangaroo perforated OS, CTO with gum (lightly hinged) and well centered, with kangaroo misplaced upwards 1.5mm. 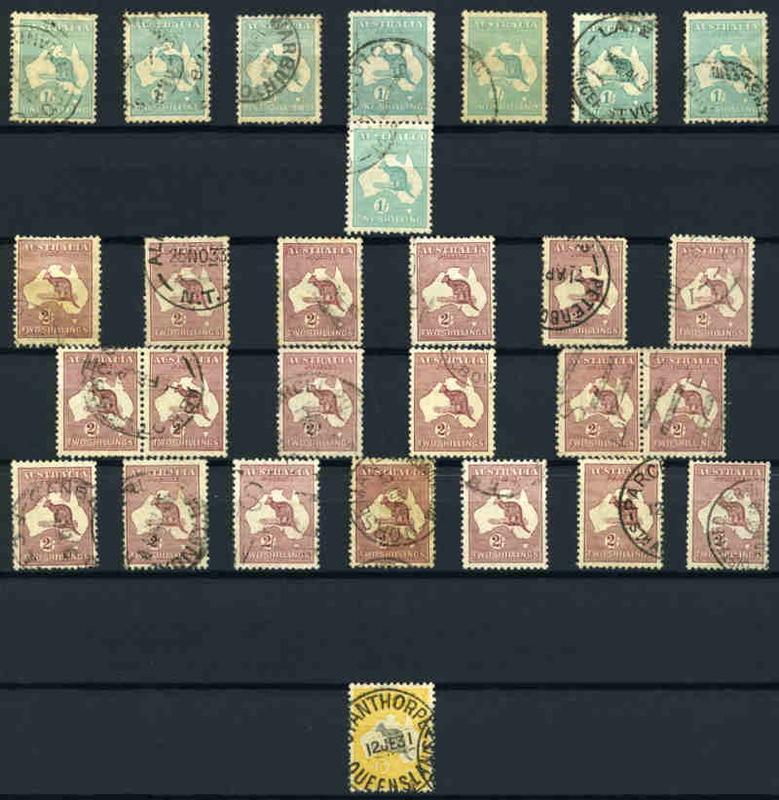 Superb. 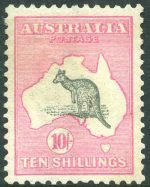 1917 10/- Grey and Deep Aniline Pink 3rd Wmk Kangaroo with inverted watermark, perf OS fine commercially used with neat Canberra CDS postmark. 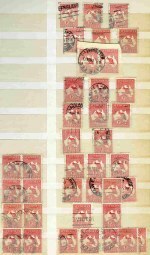 Rough perfs at top. 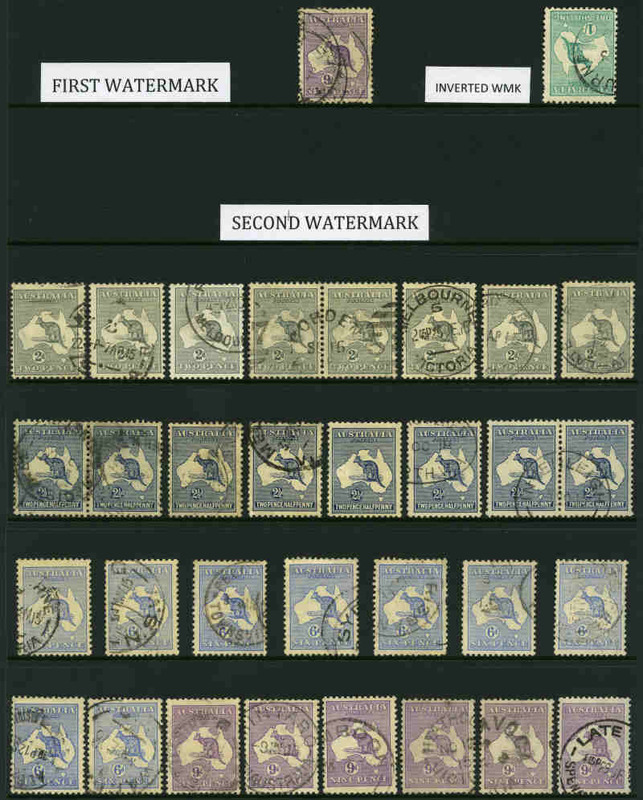 ACSC does not list the inverted watermark perf OS, and we have not been able to find a copy previously offered for sale, so believe this to be a new discovery. 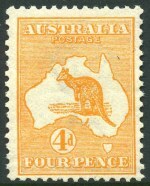 ACSC 48a(perf OS). 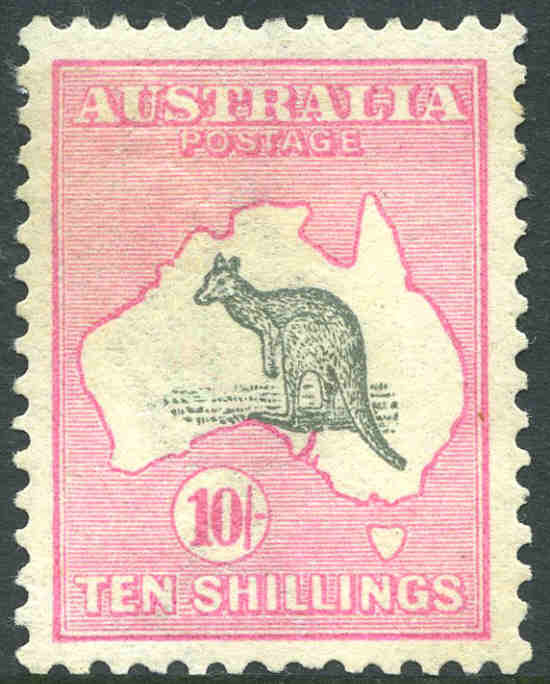 1917 10/- Grey and Pink 3rd Wmk and 1929 5/- Grey and Yellow Small Mult Wmk Kangaroos perforated OS CTO, plus 1932-35 C of A Wmk Kangaroo set O/P Specimen Type D MVLH. 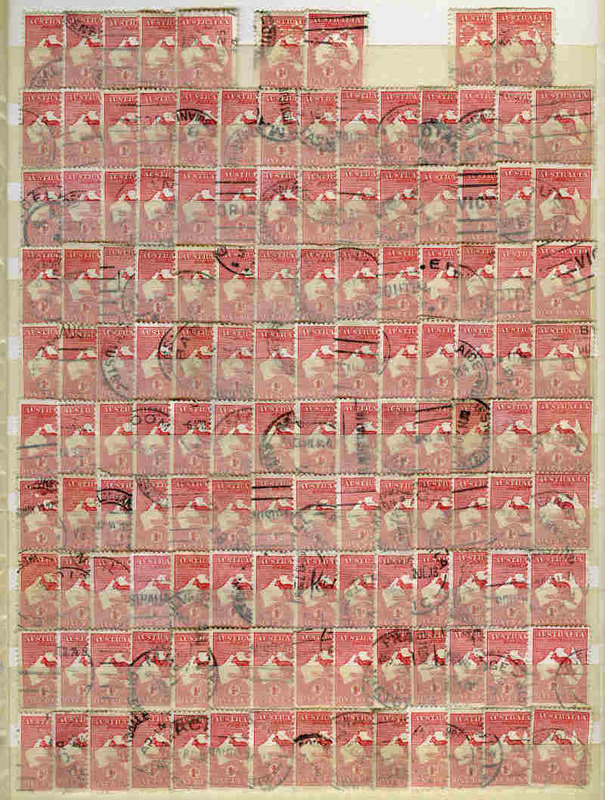 Odd blunt perf and mixed centering. 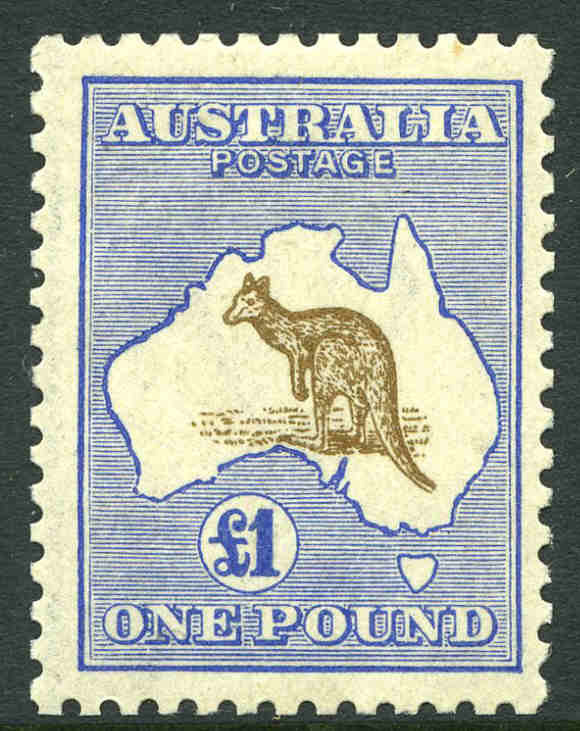 1916 £1 Chocolate and Dull Blue 3rd Wmk Kangaroo GU with repaired top right corner perf, faint diagonal crease and tiny thin. 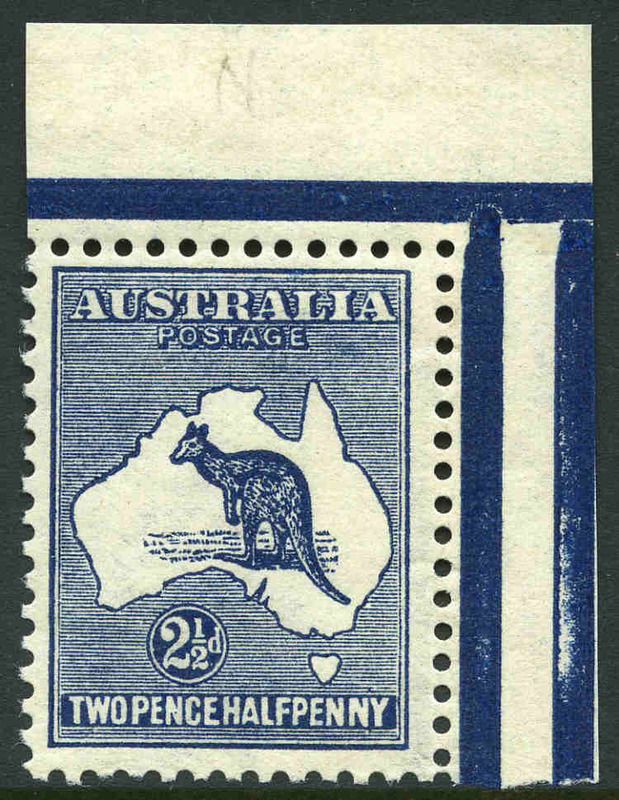 Presentable copy. 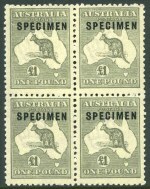 1924 £1 Grey 3rd Wmk Kangaroo O/P Specimen Type C and C1a variant (Damaged "C") block of 4, MVLH on 3 units and lower left unit MUH. 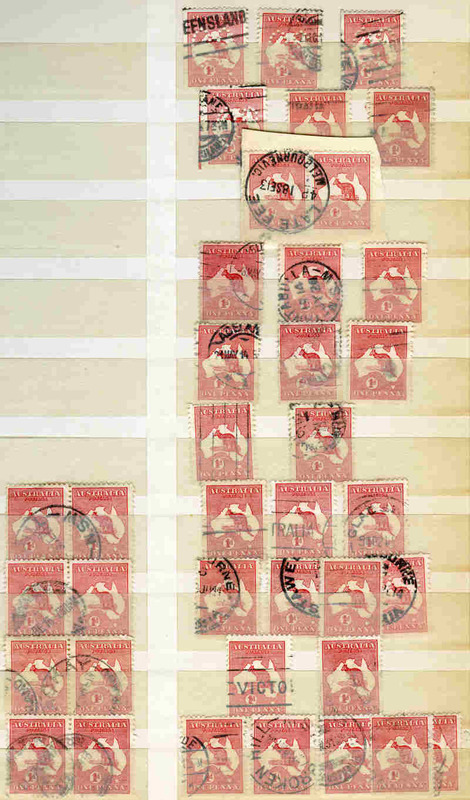 The left pair Type C1a variant and the right pair Type C. Centered high. 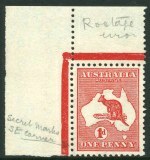 A very rare block,with only one block of eight and four blocks of four are recorded. 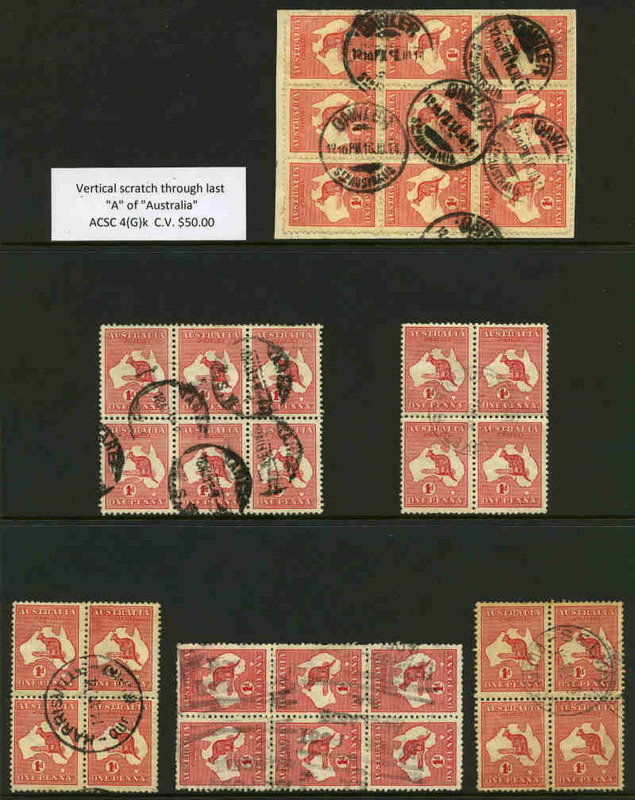 ACSC 53 xa and xd. 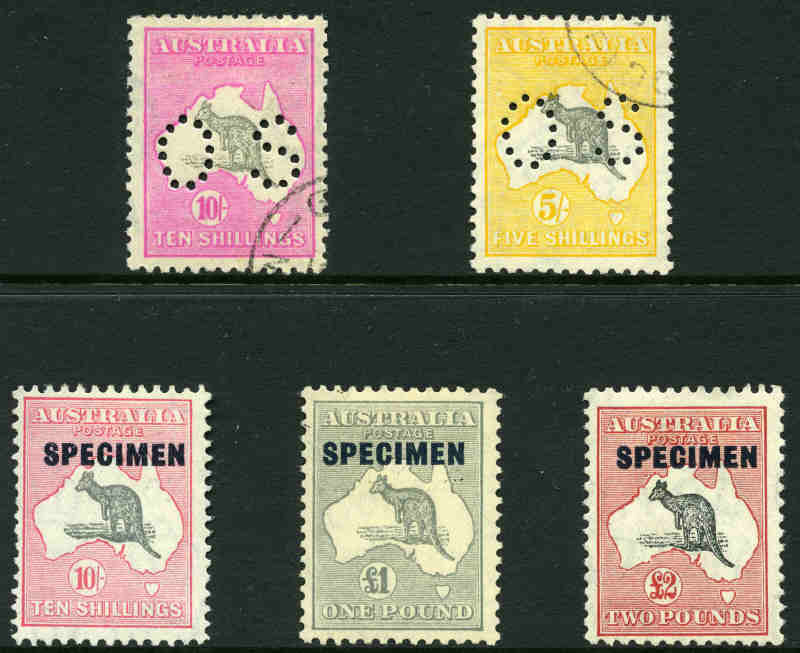 1917-24 10/- Grey and Pink, £1 Grey (2) and £2 Black and Rose O/P Specimen Type C and 1924 £1 Grey O/P Specimen Type D 3rd Wmk Kangaroo's and 1932-35 C of A Wmk Kangaroo set O/P Specimen Type D MLH. 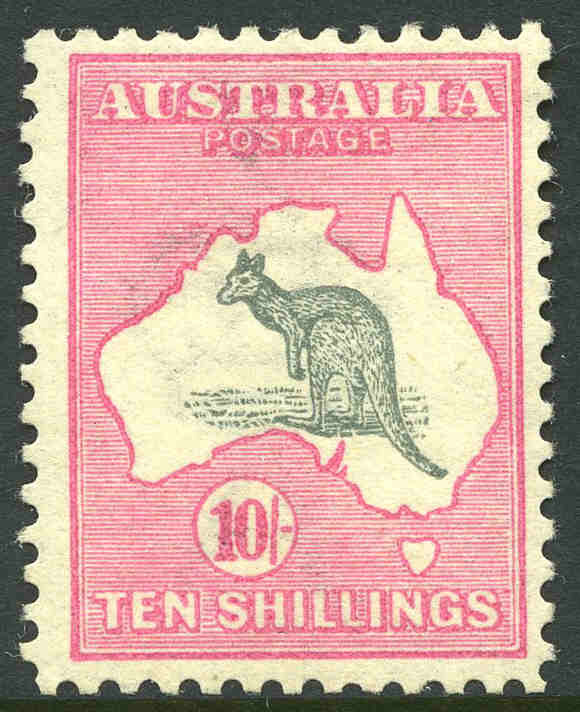 The rare 10/- Type C with White flaw before "Postage" variety, but unfortunately has missing top left corner perfs and the £1 Grey Type D 3rd Wmk with crease. 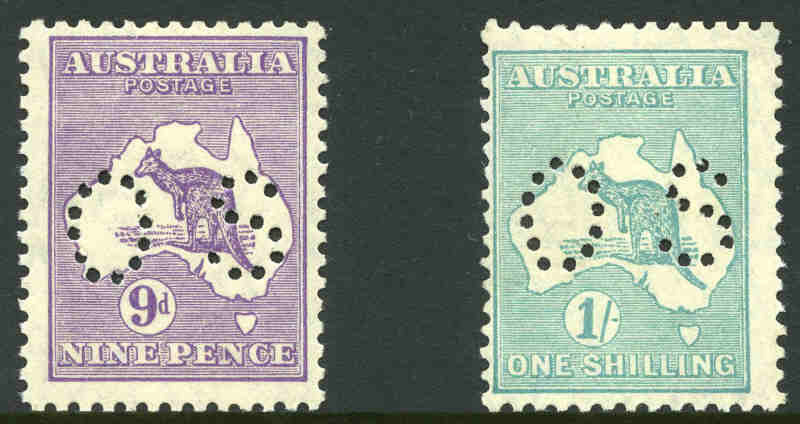 Mixed centering. 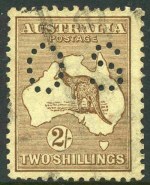 1929 6d Chestnut Small Multiple Wmk Kangaroo Ash imprint (N over A) pair MUH and reasonably well centered. ACSC 22za. 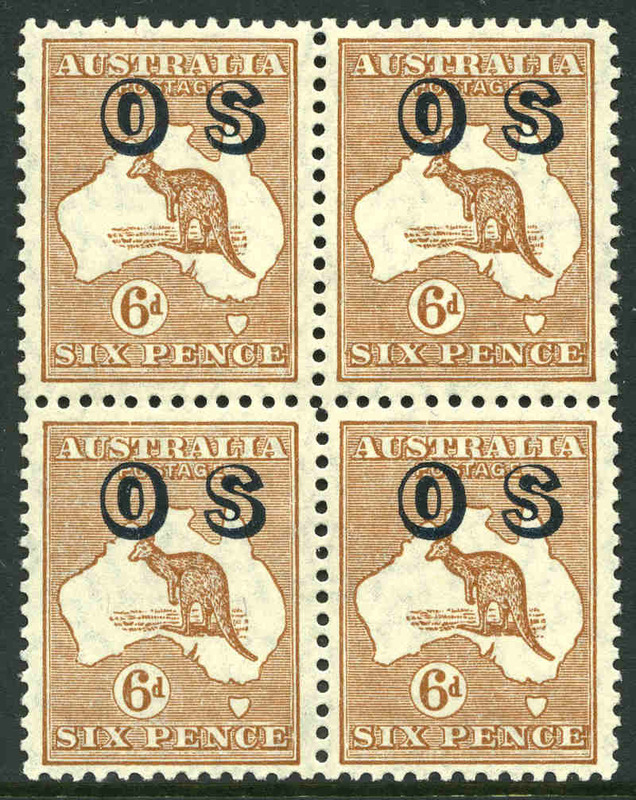 1932 6d Chestnut Small Multiple Wmk Kangaroo O/P OS block of 4, lightly hinged on top units and lower units MUH. 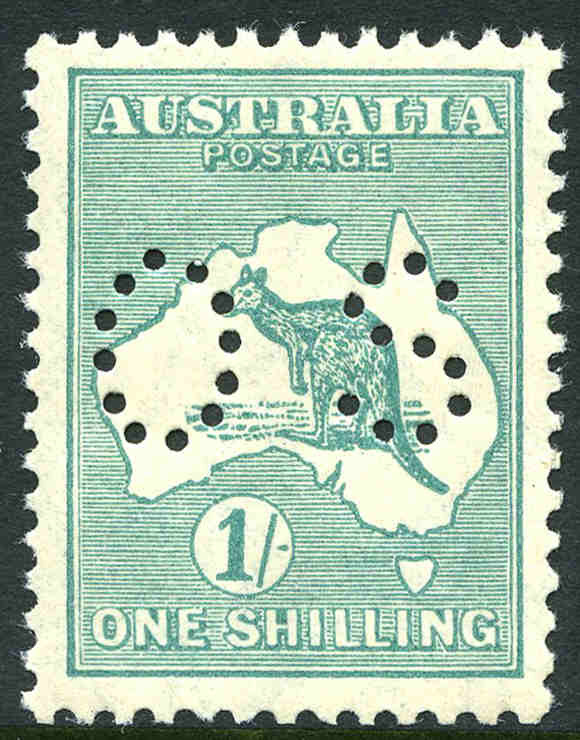 Reasonably centered. 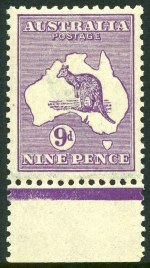 1929 9d Violet Small Multiple Wmk Kangaroo Plate 4 Ash imprint pair MUH, with evenly toned gum. 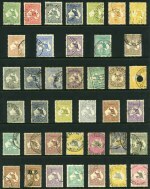 ACSC 28z. 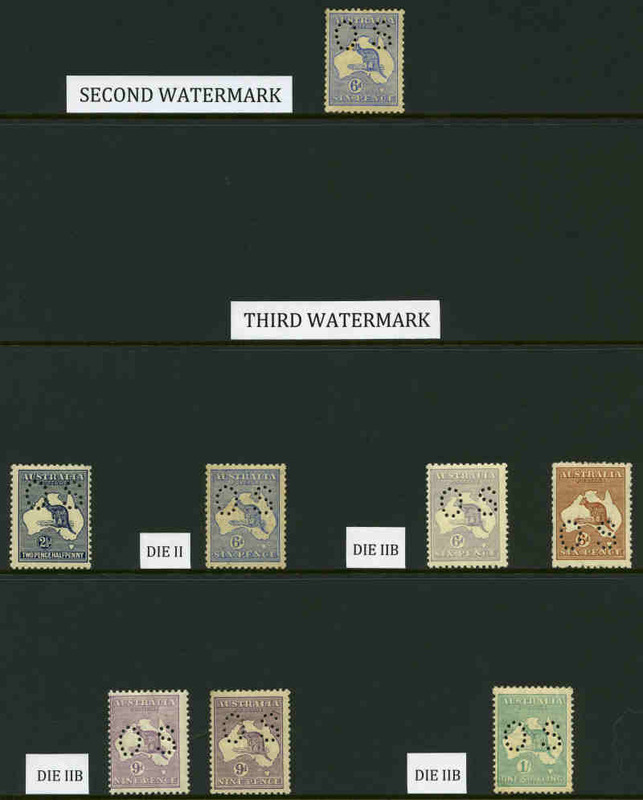 [The ACSC doesn't distinguish between the Plate 3 & Plate 4 imprints. 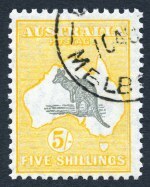 On the Plate 4 imprint there is a white nick towards the base of the left-central Jubilee Line]. 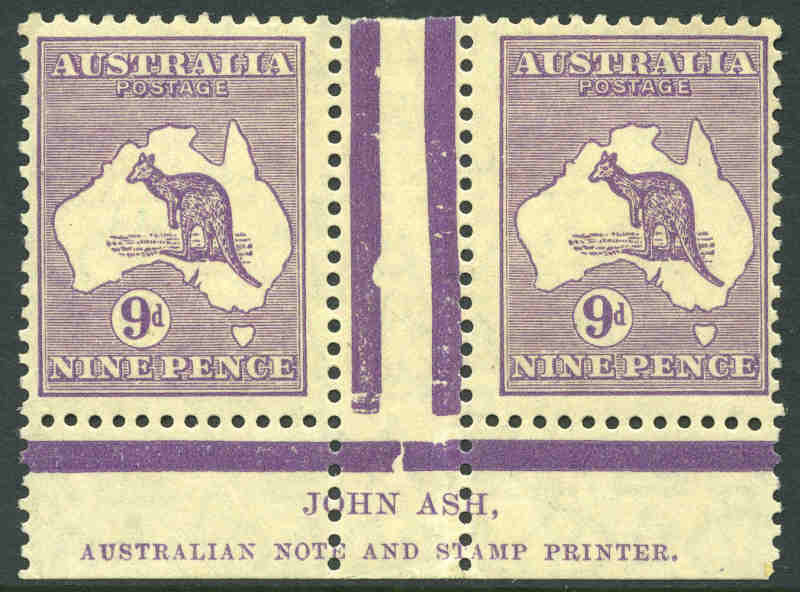 1929 9d Violet Small Multiple Wmk Kangaroo Plate 4 Ash imprint block of 4, very lightly hinged on top units and lower units MUH. 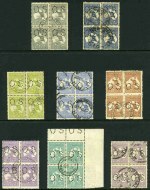 ACSC 28z. 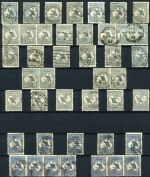 Catalogue Value $500.00. 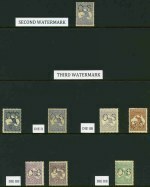 [The ACSC doesn't distinguish between the Plate 3 & Plate 4 imprints. 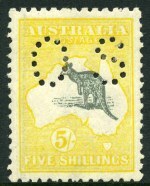 On the Plate 4 imprint there is a white nick towards the base of the left-central Jubilee Line]. 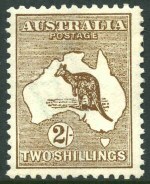 1929 9d, 1/-, 2/- and 5/- Small Multiple Wmk Kangaroo's MVLH and well centered. 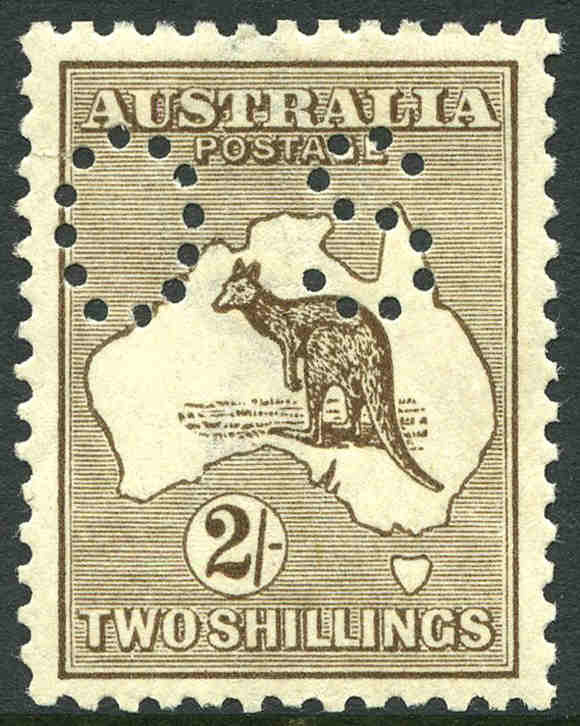 1/- value MUH corner copy and centered to base. 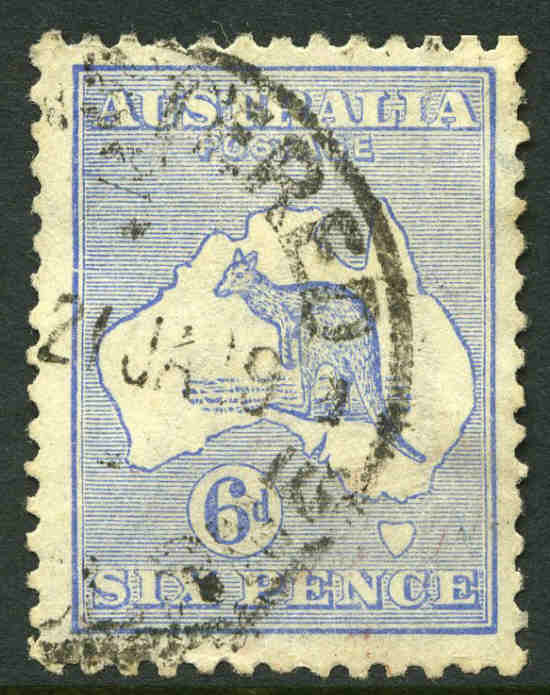 5/- exceptionally well centered premium copy with barely visible hinge trace. 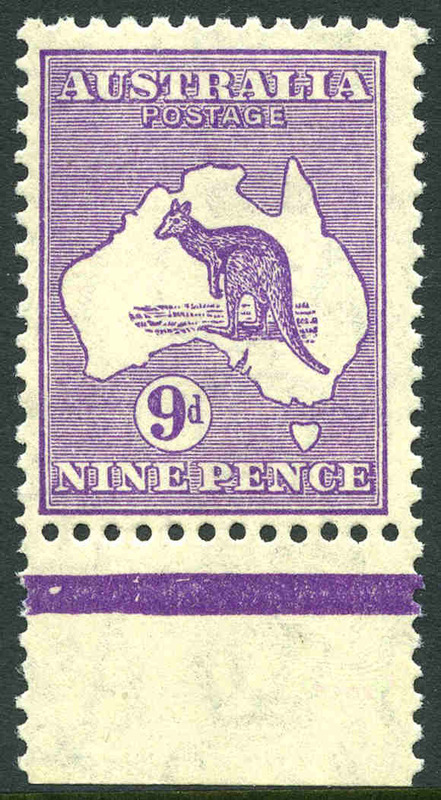 1929 9d Violet and 1/- Emerald Small Multiple Wmk Kangaroo's perforated OS, MUH and off centre. 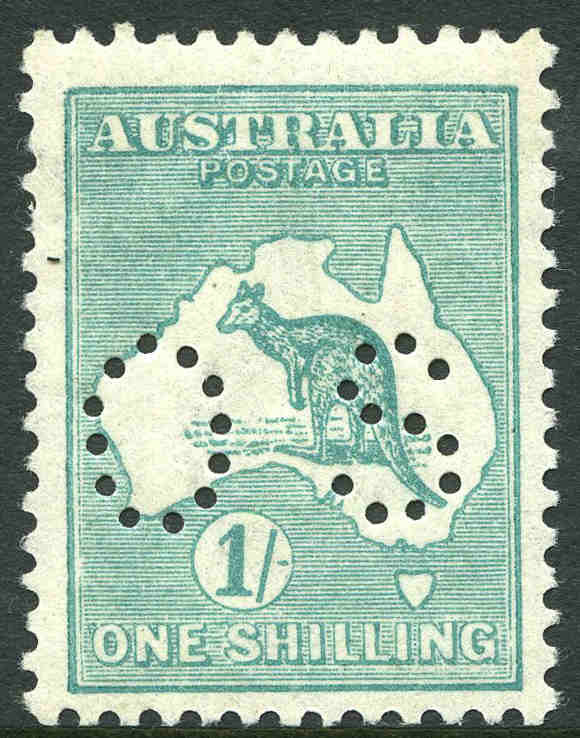 1929 1/- Emerald Small Multiple Wmk Kangaroo perforated OS, MUH and well centered. 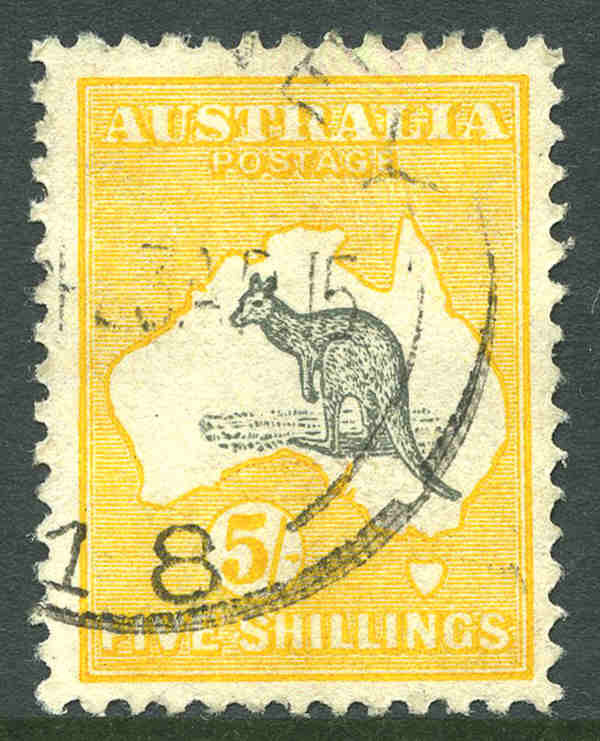 1929 5/- Grey and Yellow Small Multiple Wmk Kangaroo with GPO Melbourne CTO cancellation, unhinged with gum and reasonably centered. 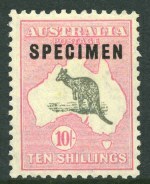 1929 10/- Grey and Pink Small Multiple Wmk Kangaroo O/P Specimen Type C MVLH and reasonably centered. 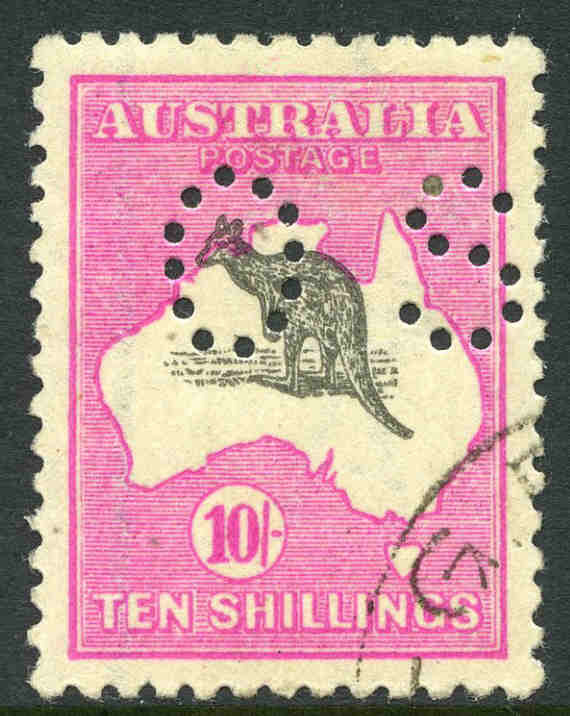 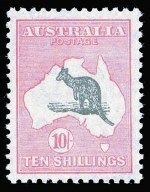 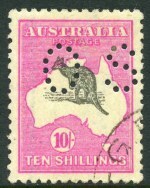 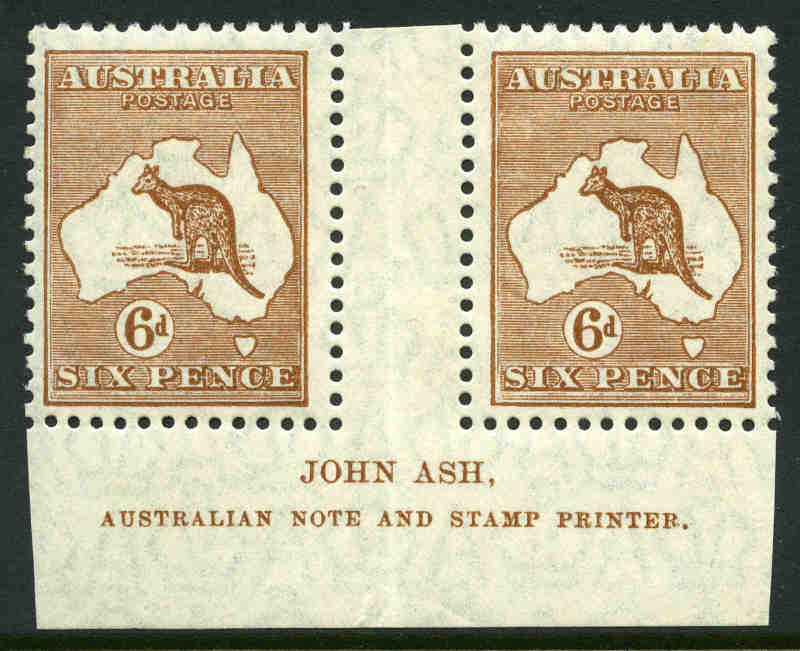 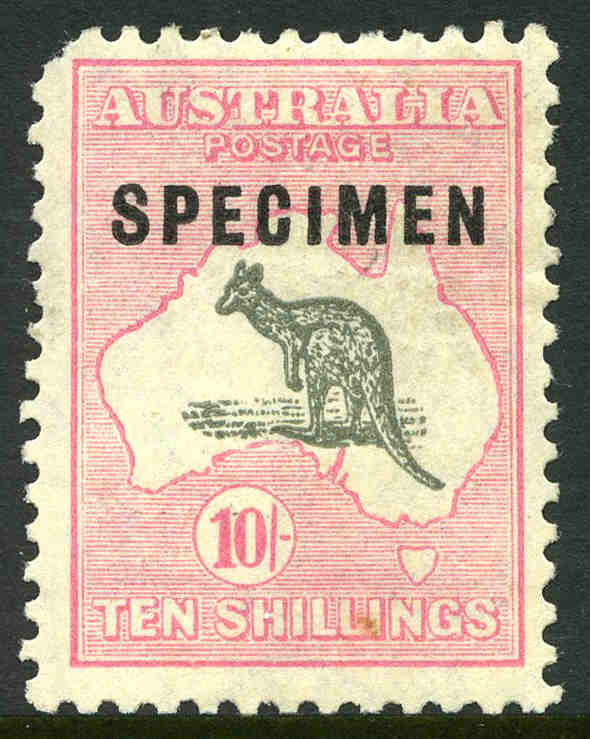 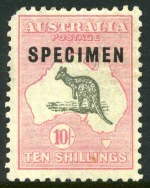 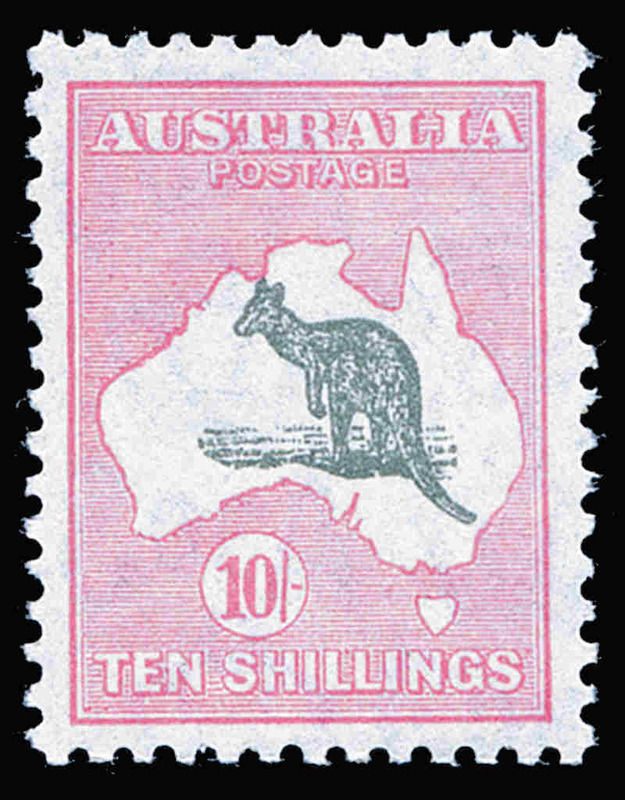 1929 10/- Grey and Pink Small Multiple Wmk Kangaroo with unlisted variety, "Missing shading in Bight", O/P Specimen Type C MLH. 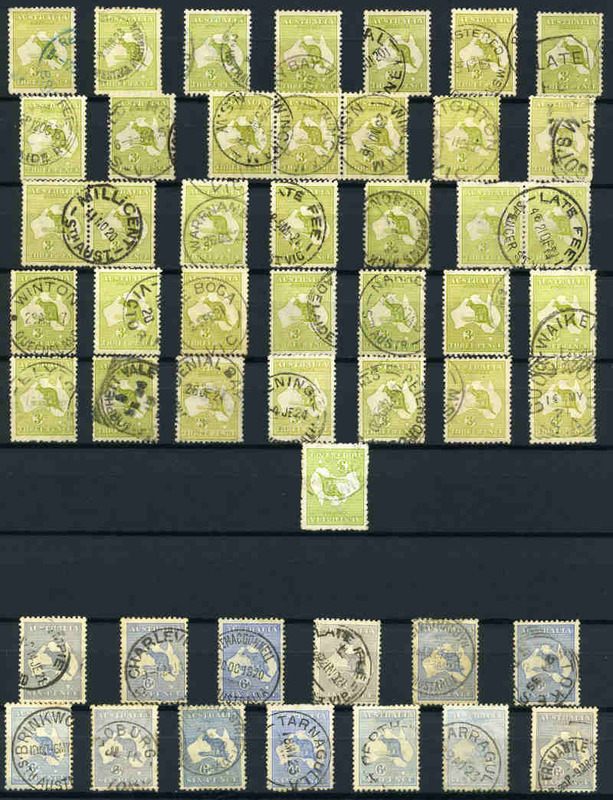 Missing top left corner. 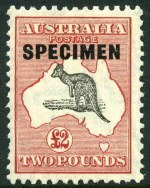 1930 £2 Grey and Rose-Crimson Small Multiple Wmk Kangaroo O/P Specimen MUH and well centered, with a few shortish perfs. 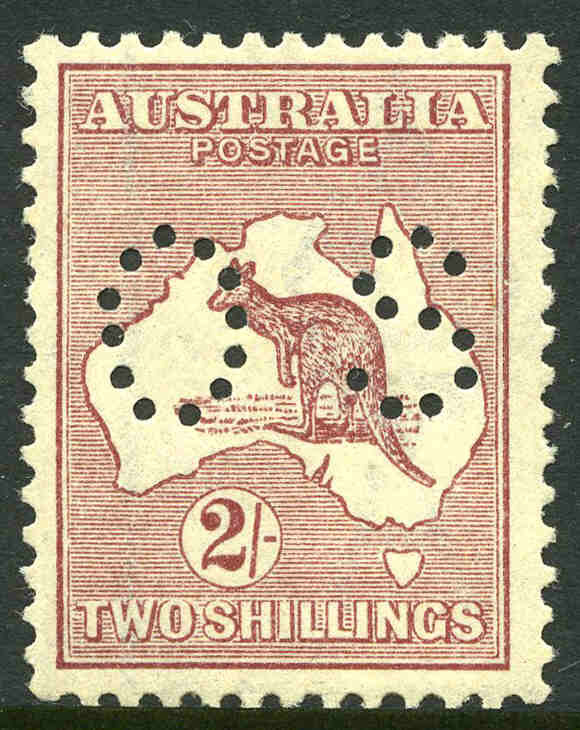 1932 6d Chestnut C of A Wmk Kangaroo O/P OS Plate 3 Ash imprint block of 8 MUH with White hairline from value circle to map variety. 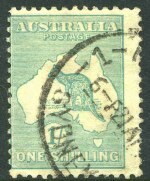 Centered to base. 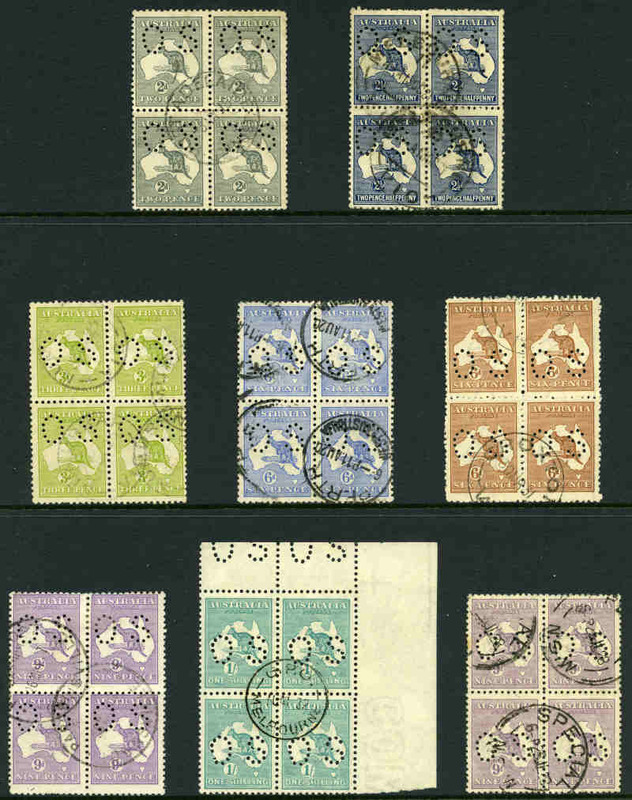 ACSC 23(OS)z. 1932 9d Violet C of A Wmk Kangaroo MUH marginal copy centered to lower left. 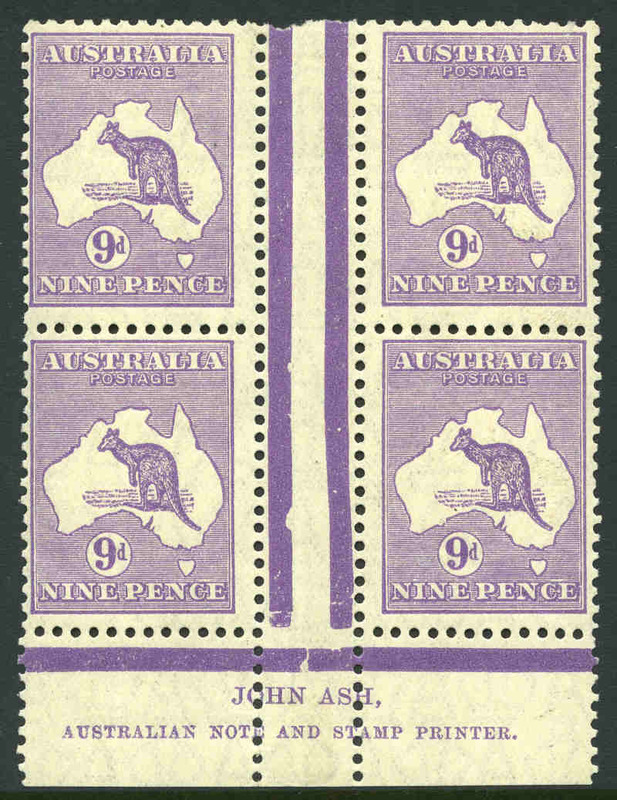 1932 9d Violet C of A Wmk Kangaroo Plate 1 first state Ash imprint block of 4, lightly hinged on top left unit and lower units MUH. ACSC 29z. 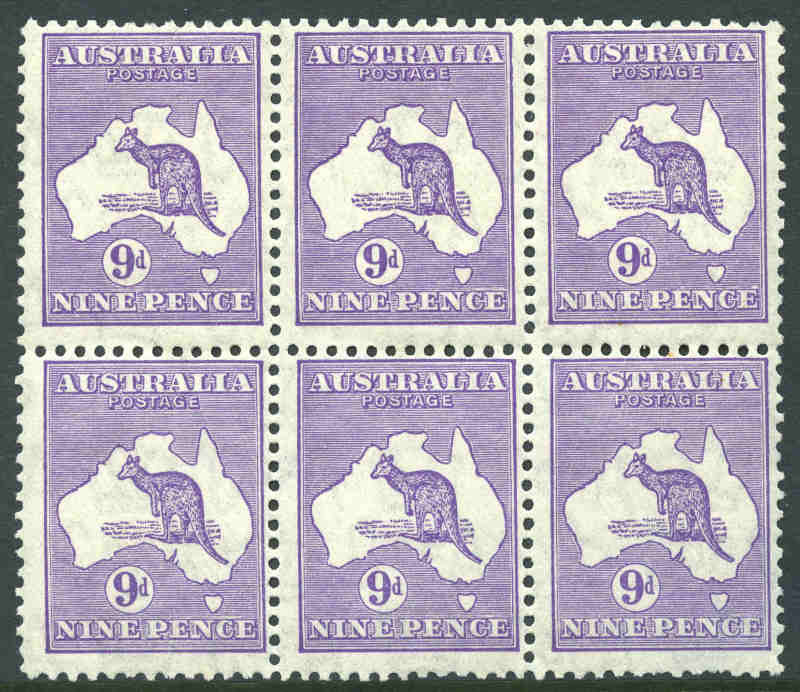 1932 9d Violet C of A Wmk Kangaroo block of 6, lightly hinged on 3 units and remaining units MUH. 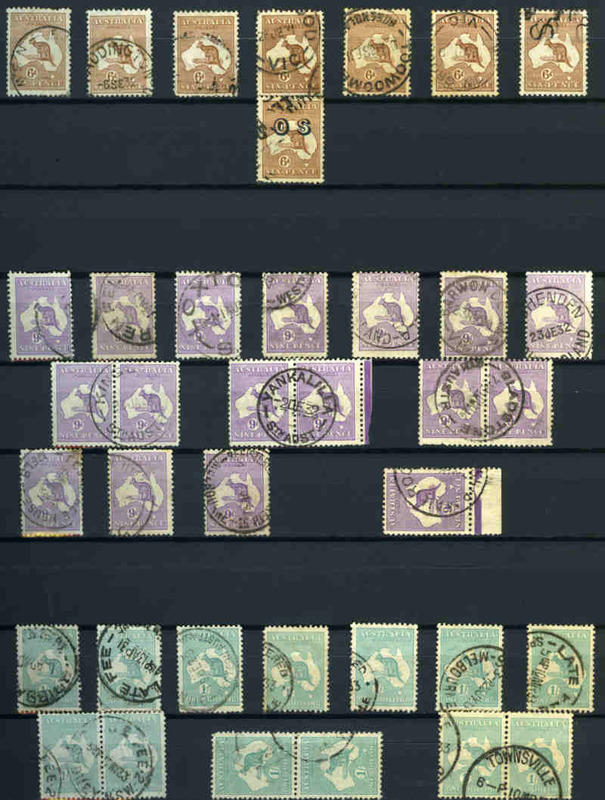 Centered high and lower right (MUH) unit with few short perfs. 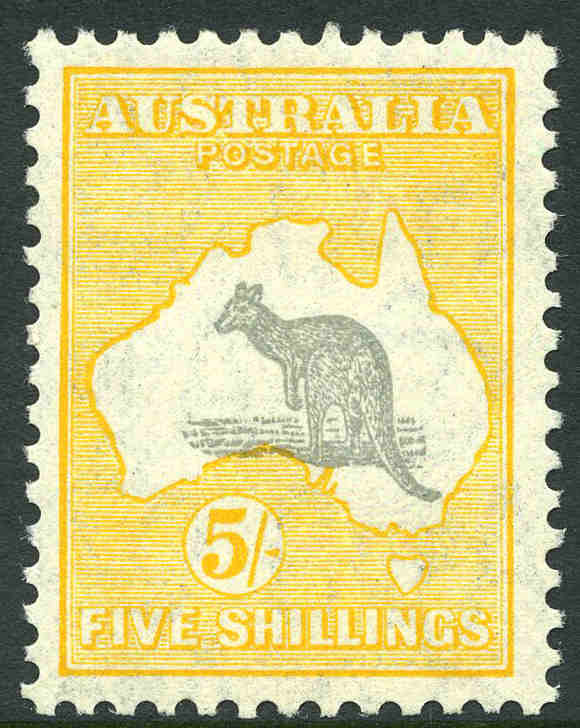 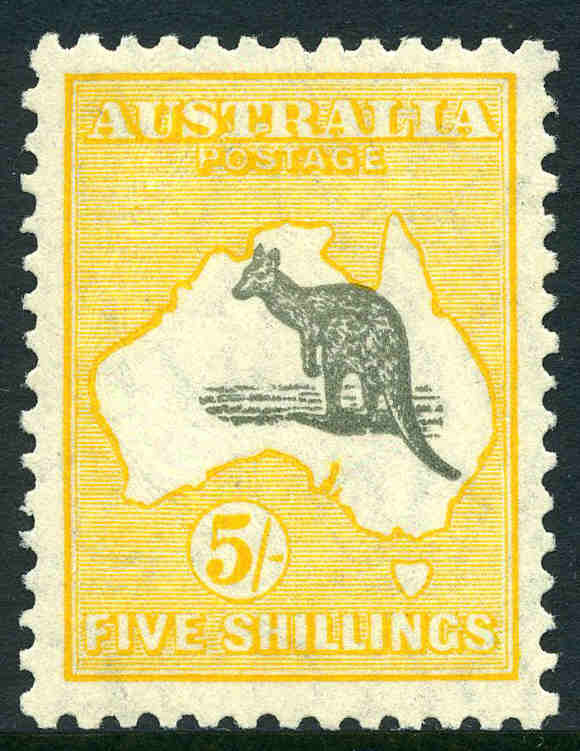 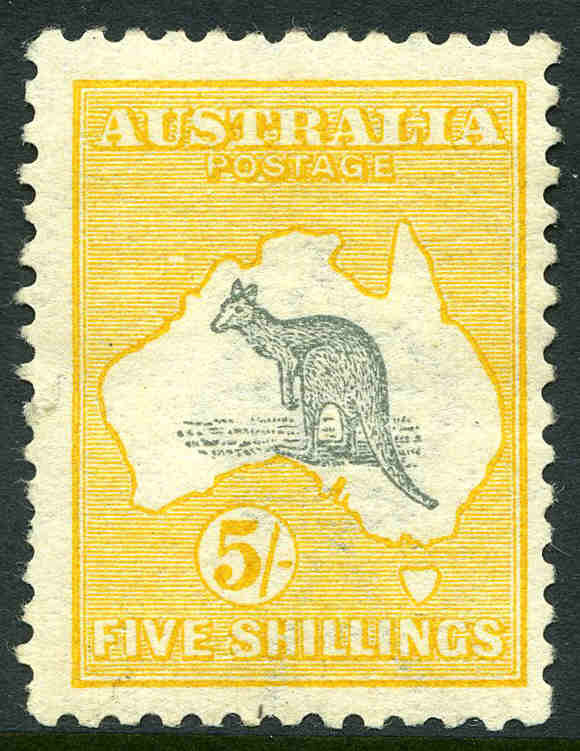 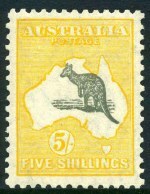 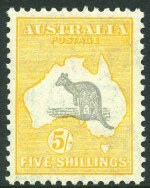 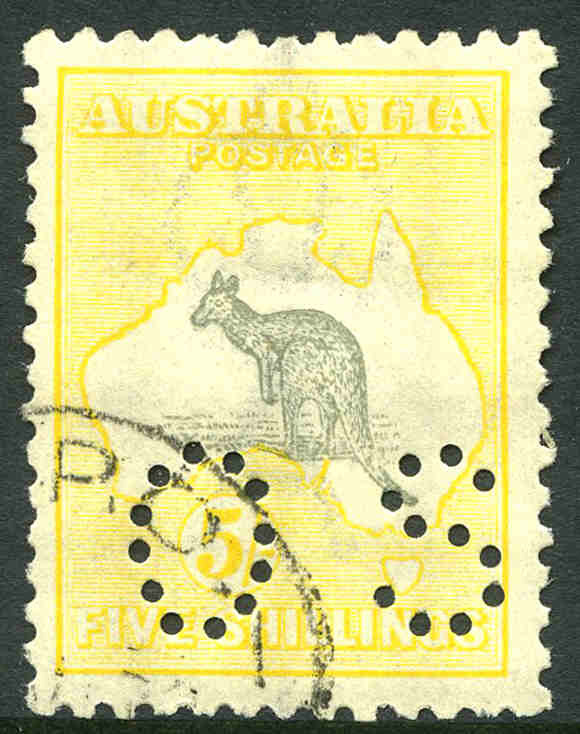 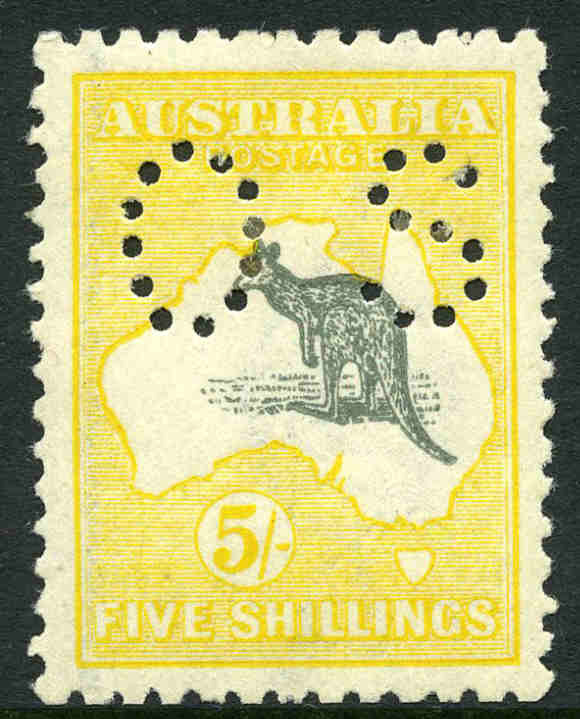 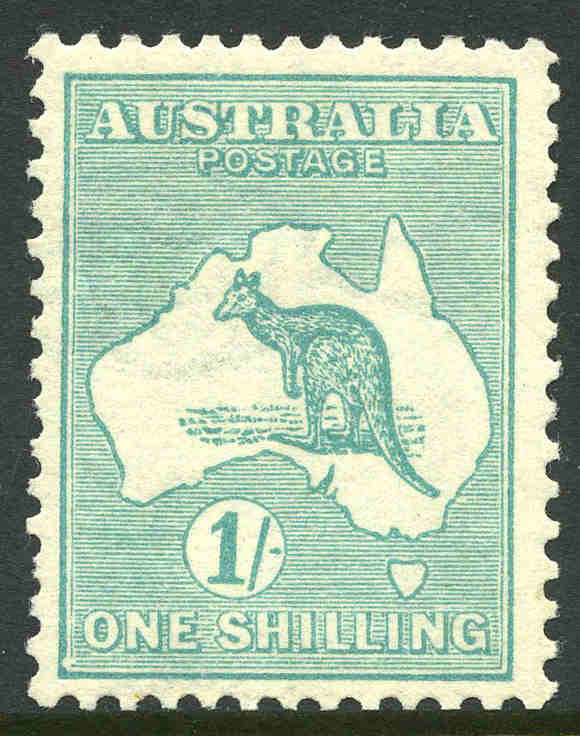 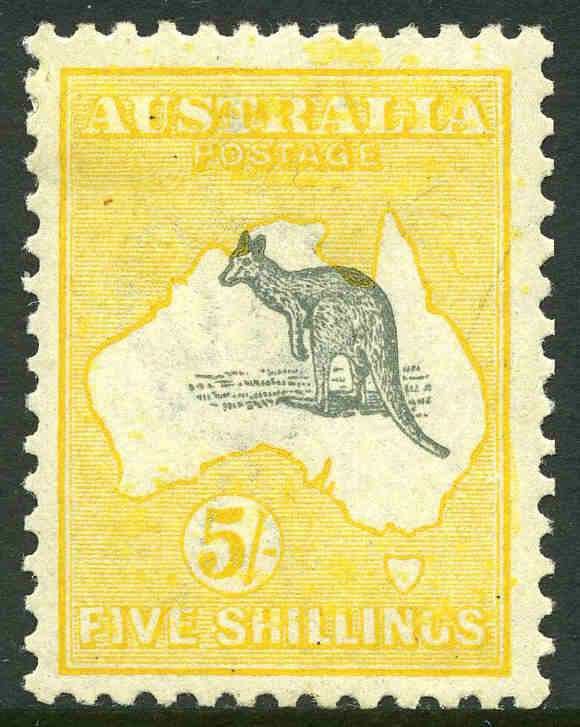 1932 5/- Grey and Yellow-Buff C of A Wmk Kangaroo MUH and reasonably centered. 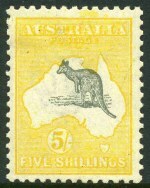 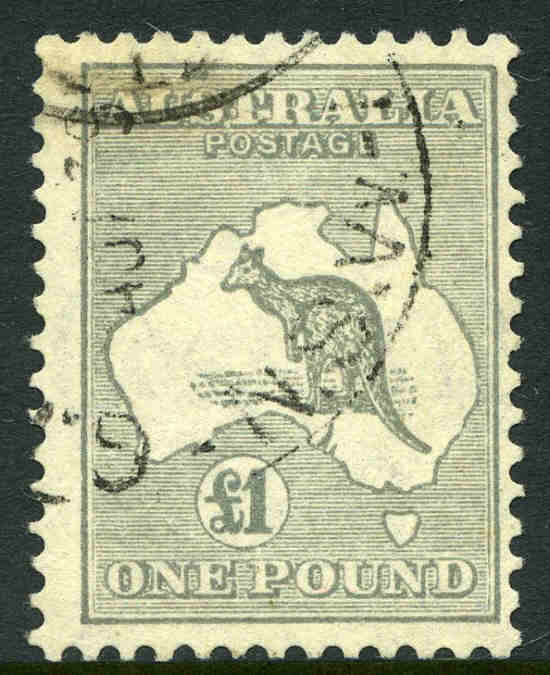 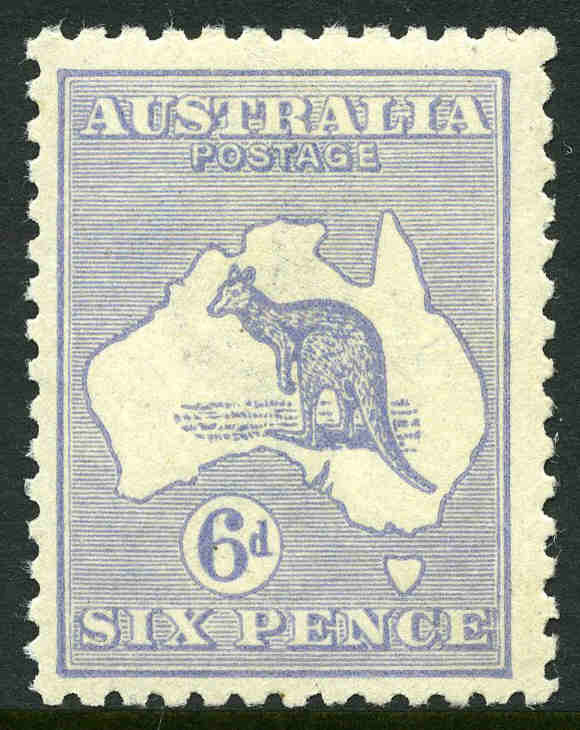 1932 5/- Grey and Yellow C of A Wmk Kangaroo MVLH and exceptionally well centered. 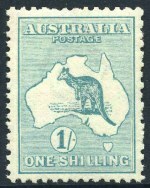 Premium copy. 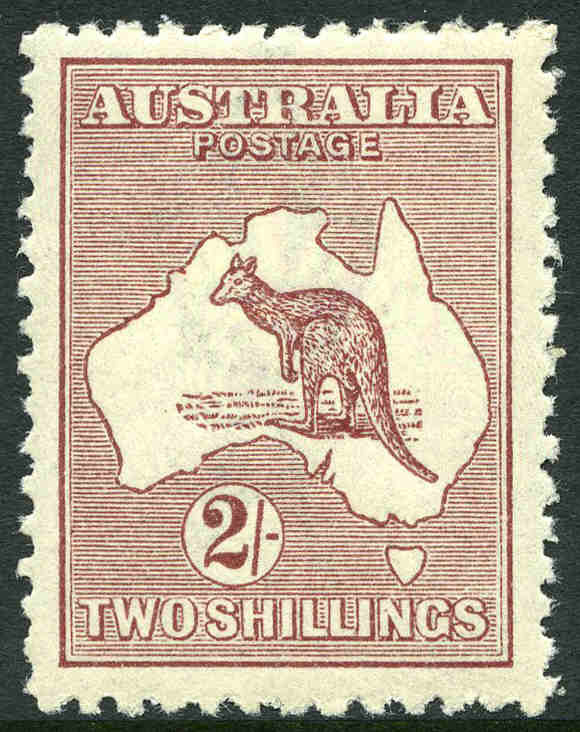 1932 10/- Grey-Black and Rose-Crimson C of A Wmk Kangaroo MUH marginal copy, centered to base. 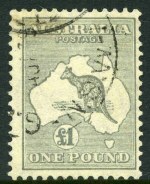 1935 £1 Grey C of A Wmk Kangaroo FU and centered to right. 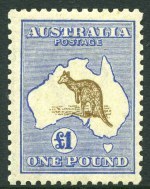 1935 £1 Grey C of A Wmk Kangaroo GU, with a few short perfs. 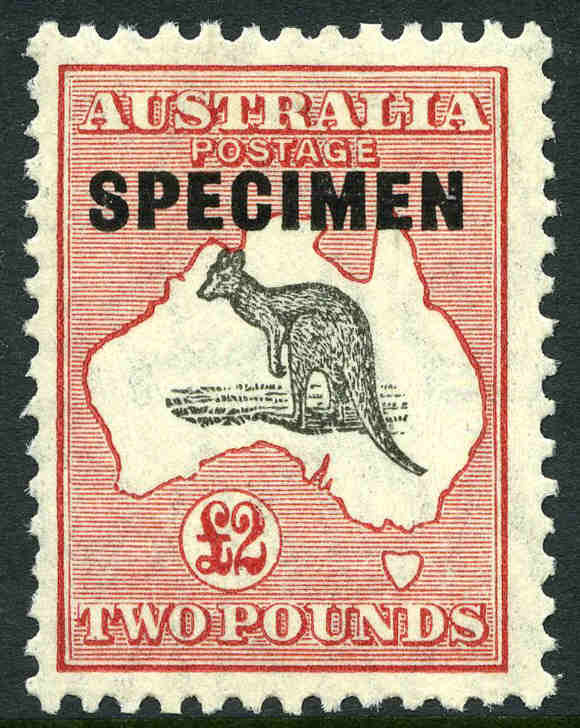 1932-35 C of A Wmk Kangaroo set O/P Specimen Type D MLH, plus 1913 1d Red Die 1st Wmk Kangaroo MUH top left corner copy with "Rostage" variety. 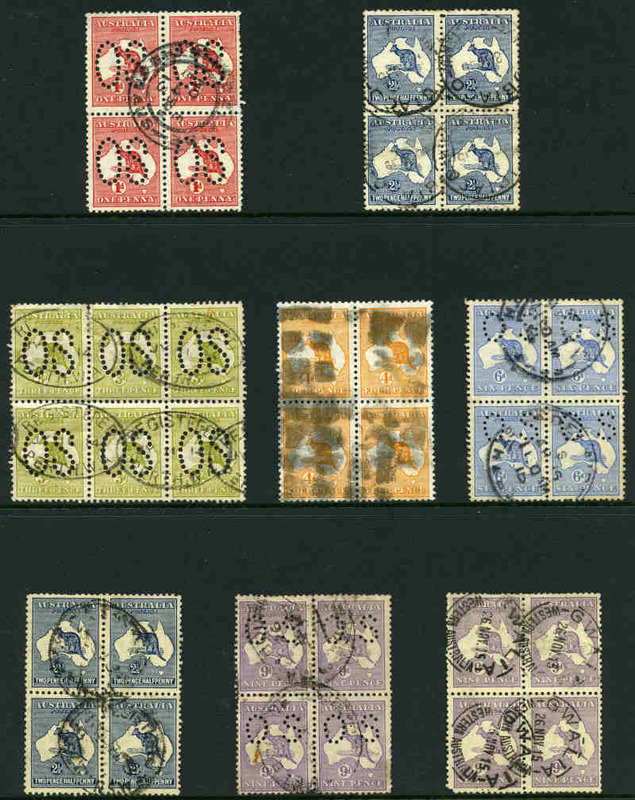 Mixed centering. 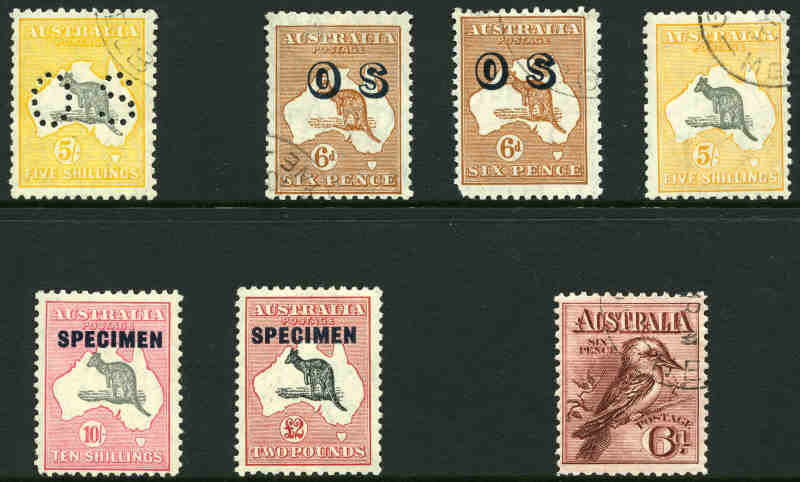 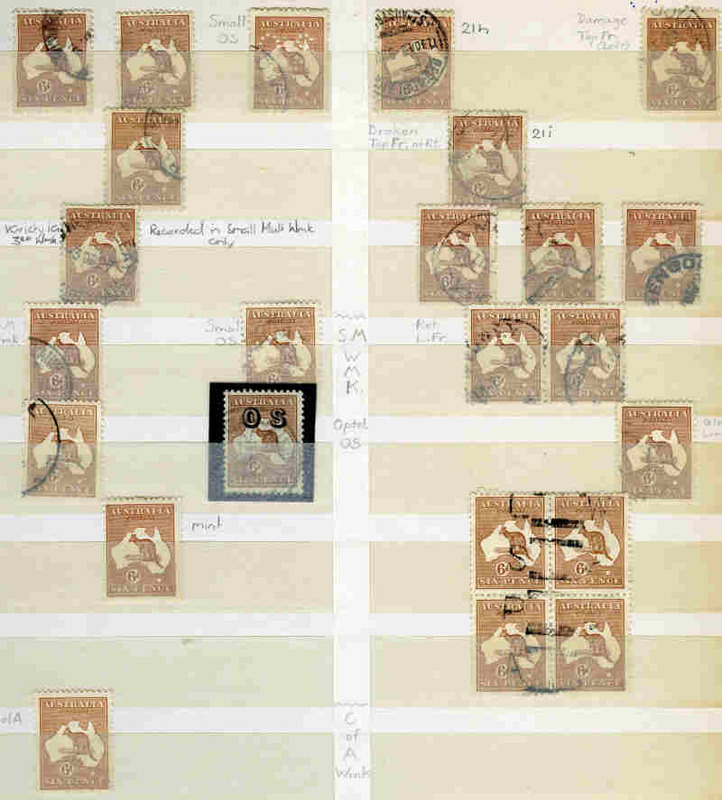 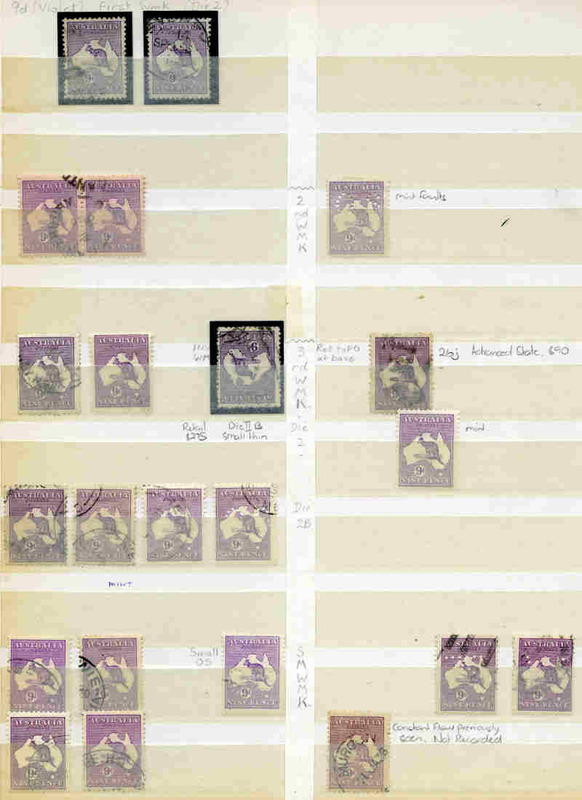 Selection of 129 mint Kangaroo issues comprising 1913 ½d (16), 1d (8), 2d (5), 2½d (2), 3d (3), 4d (4, one perf small OS), 5d (2) and 6d (2) 1st Wmk, 1915-23 2d (2), 2½d (2), 3d (8), 6d Blue (3), 6d Brown (8, inc Mullett imprint pair), 9d (8, inc block of 4 with Broken shading lines below "Postage" variety), 1/- (2), 2/- Brown and 2/- Maroon 3rd Wmk, 1929-32 6d (3), 6d O/P OS, 9d (2), 1/- (3) and £2 O/P Specimen (mint no gum) Small Mult Wmk and 1932-45 6d (6), 6d O/P OS (3), 9d (3), 2/- (19) and 10/- (4), £1 (2) and £2 (3) O/P Specimen Type D C of A Wmk. 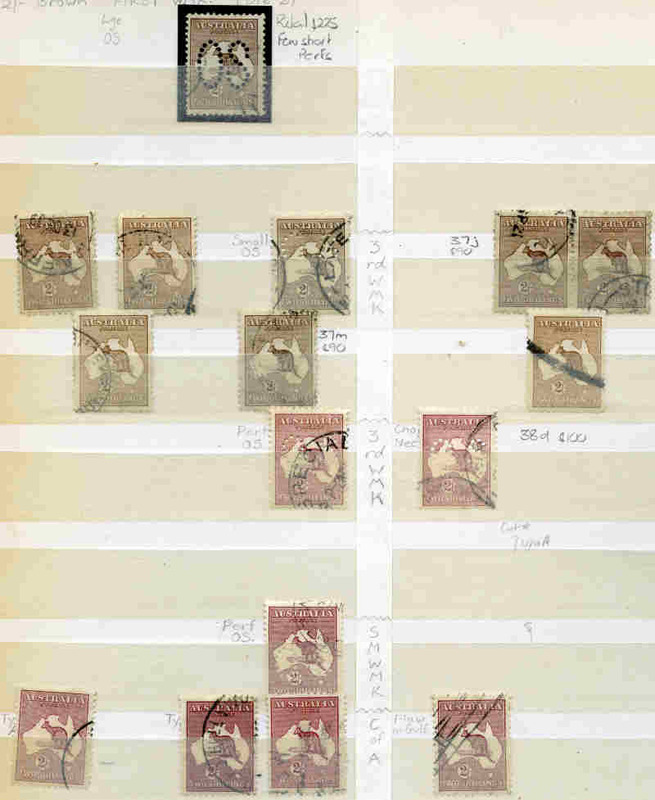 Some faults, but many in fine MLH condition with mixed centering. 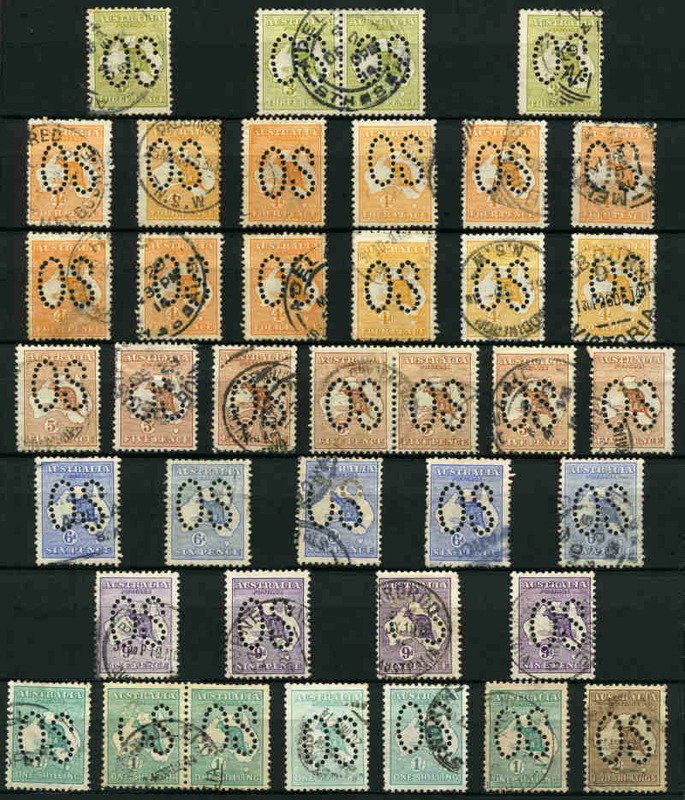 Several MUH and perforated OS, with odd variety. 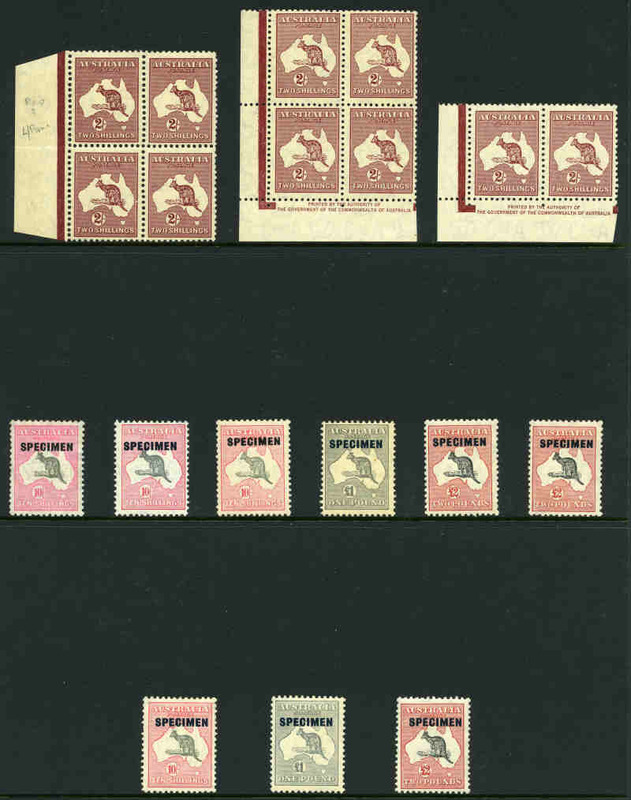 High retail value. 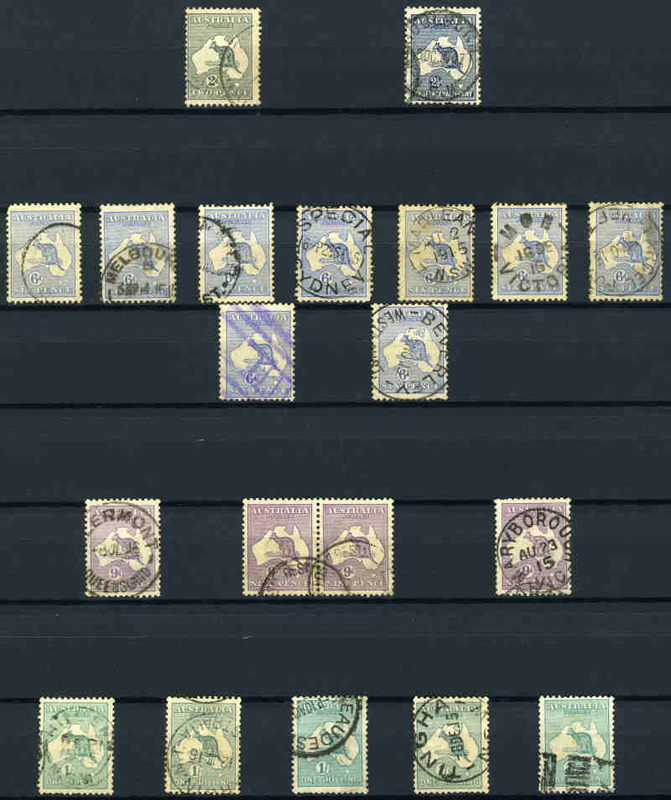 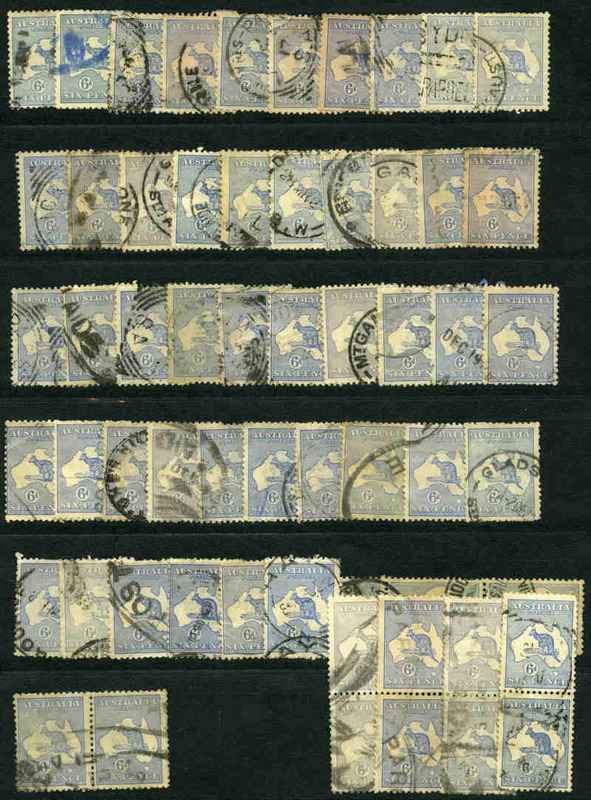 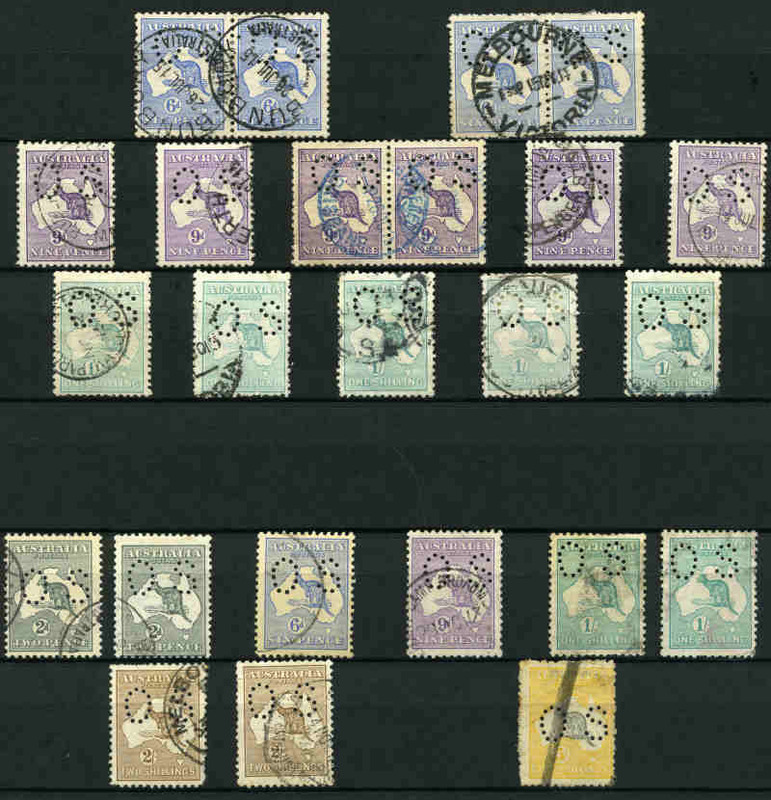 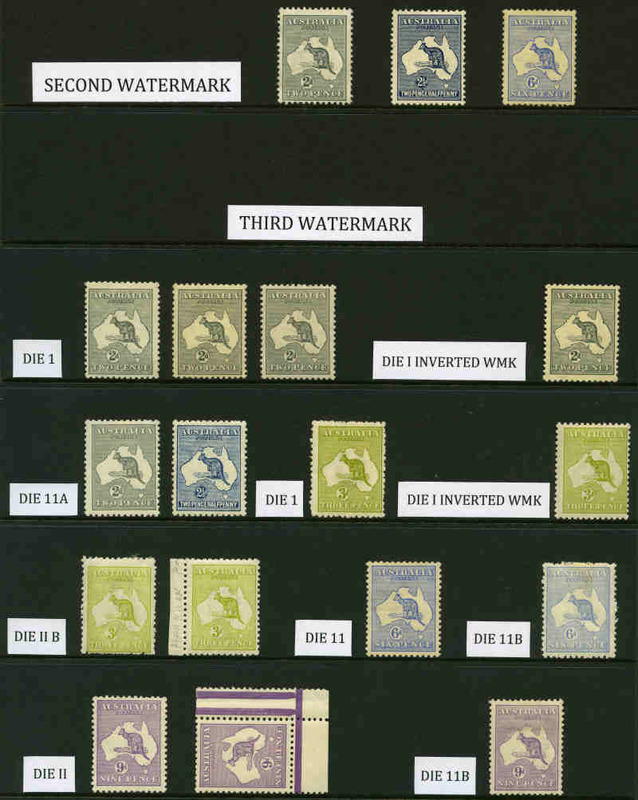 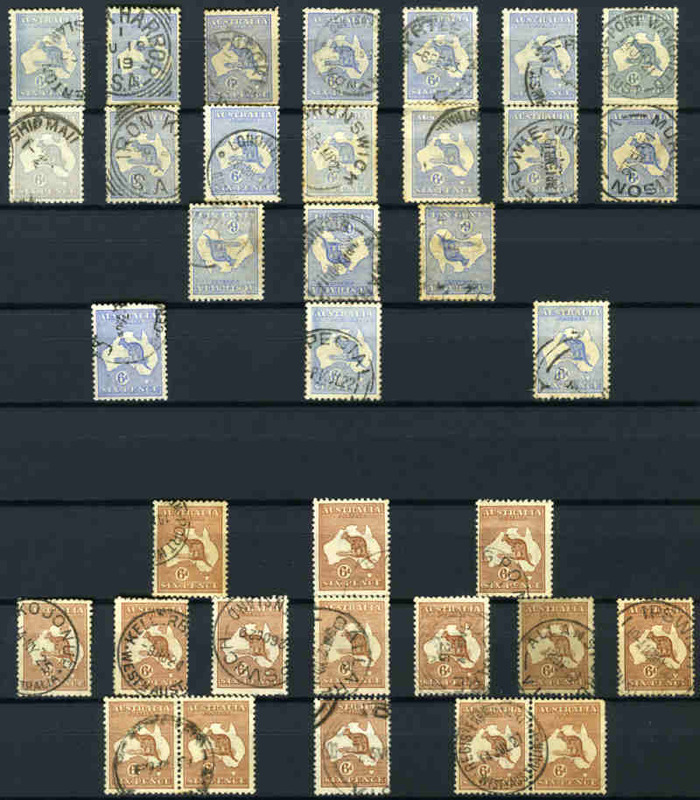 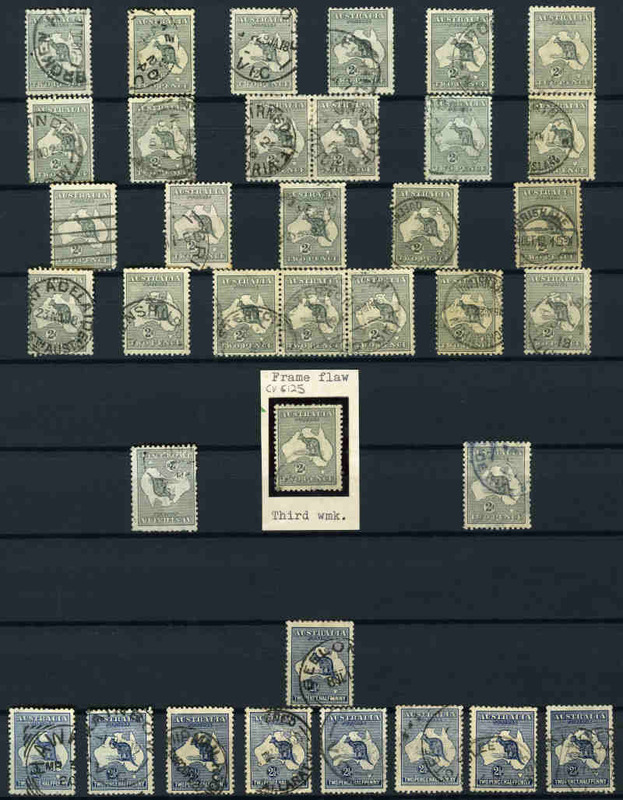 Selection of 52 mint Kangaroo issues comprising 1915 2d Grey, 2½d Indigo, and 6d Ultramarine 2nd Wmk, 1915-23 2d Grey Die I (4, one with Inverted Wmk) and Die II, 2½d Blue, 3d Olive Die I (2, one with Inverted Wmk) and Die IIB (2), 6d Blue Die II and Die IIB, 9d Die II (2) and Die IIB and 1/- Emerald Die II (2, one with Inverted Wmk) and Die IIB (2, one with Sideways Wmk) 3rd Wmk, 1929 6d Chestnut (2), 9d Violet, 1/- Emerald and 2/- Maroon Small Mult Wmk and 1932-45 6d Chestnut (2, one O/P OS), 9d Violet, 2/- Maroon Die II Plate 1 and 2 imprint blocks of 4 and Redrawn Die imprint block of 4 (3), plus single of each Die C of A Wmk. 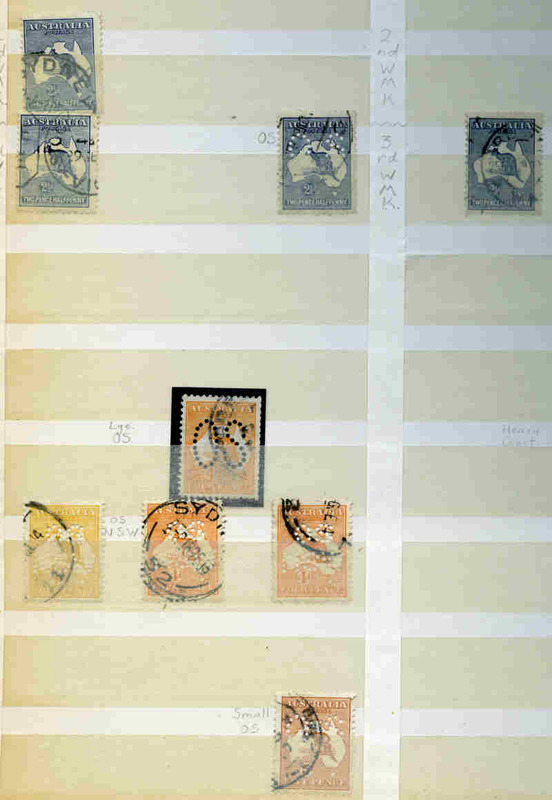 Mainly presentable MLH copies with odd fault and short perf. 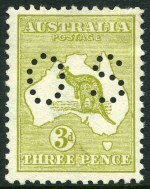 Variable centering. 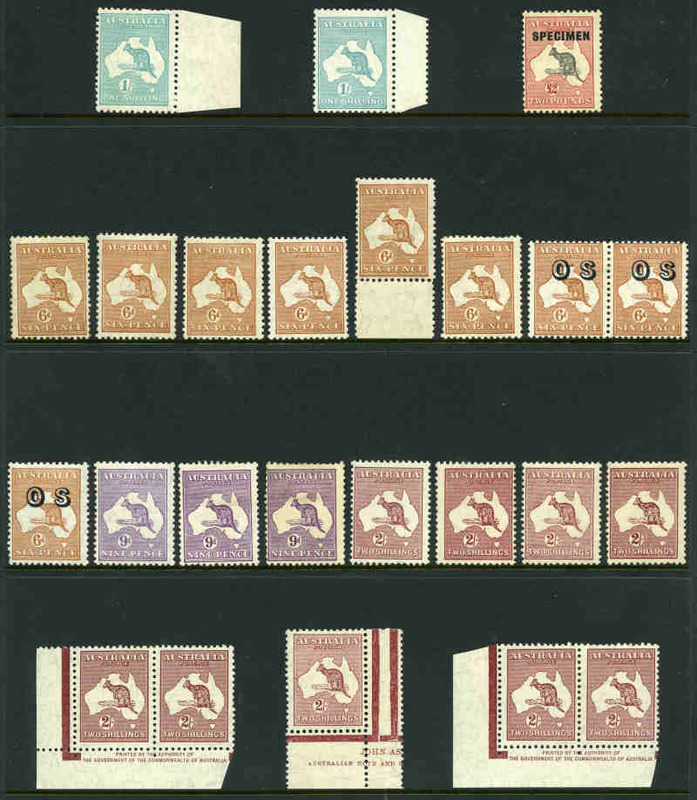 High retail value. 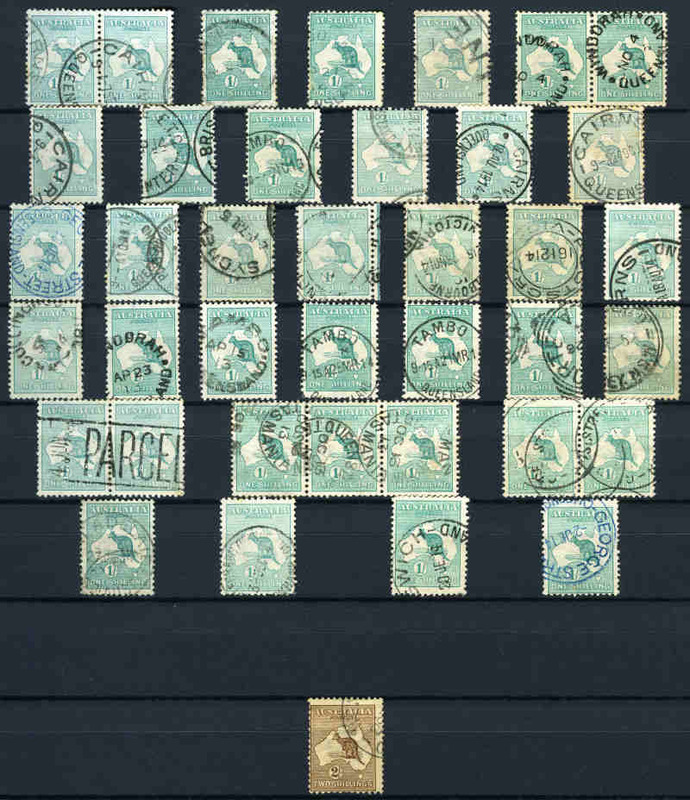 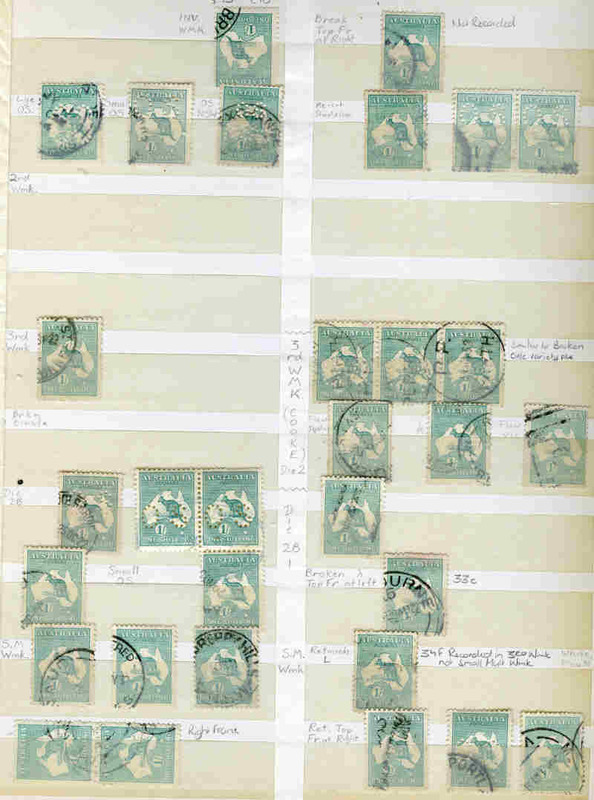 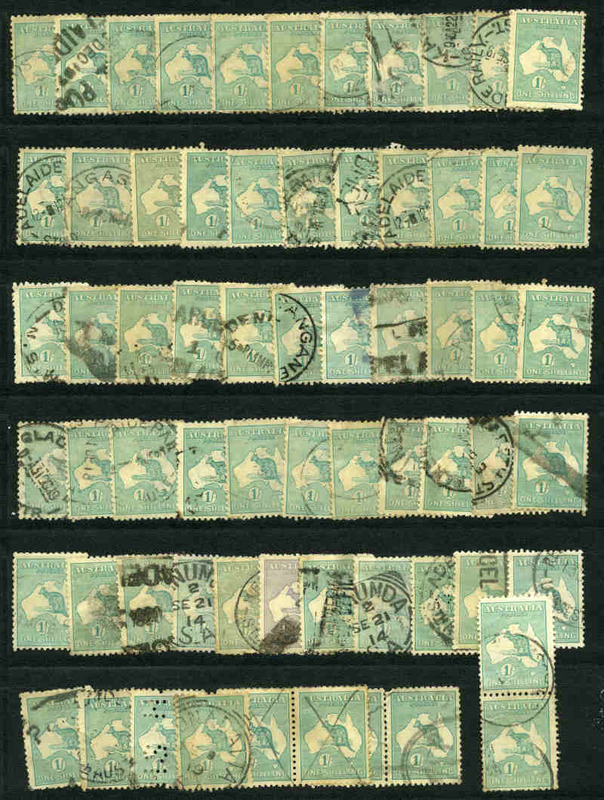 Selection of 15 mint Kangaroo issues perforated OS, comprising 1915 6d Ultramarine 2nd Wmk, 1915-23 2½d Blue, 6d Blue Die II and Die IIB, 6d Chestnut, 9d Die IIB (2) and 1/- Emerald Die IIB 3rd Wmk and 1929 6d Chestnut Plate 4 imprint block of 4, plus single and 1/- Emerald (2) Small Mult Wmk. 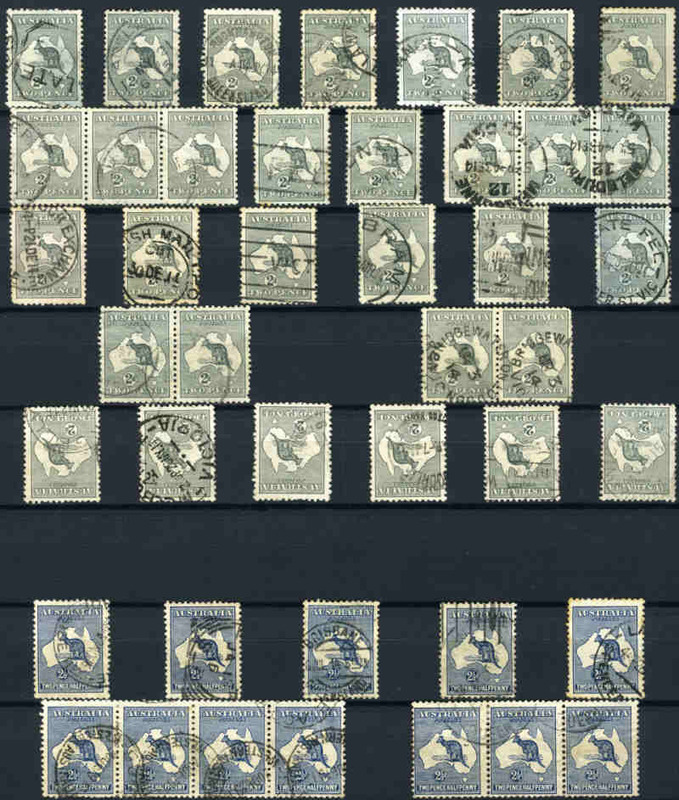 Mainly MLH with few faults and short perfs. 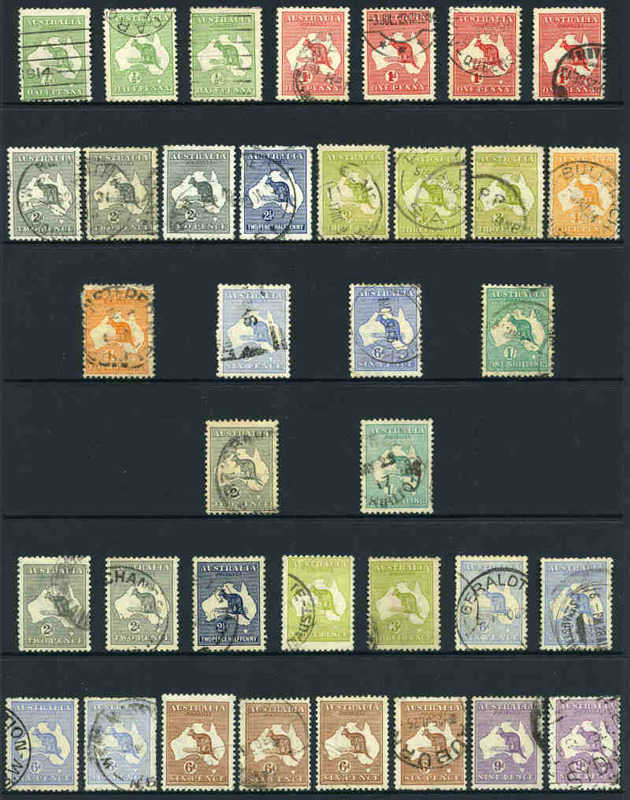 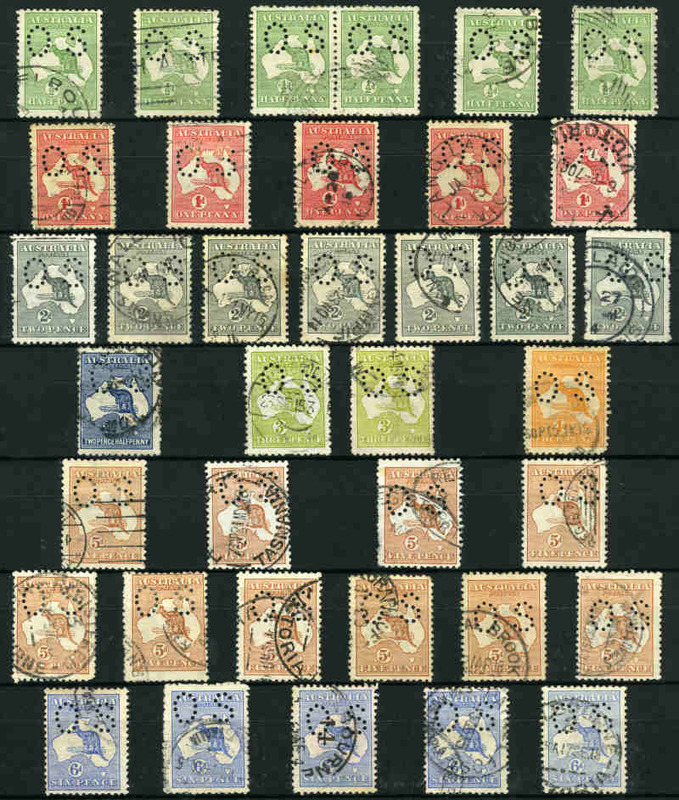 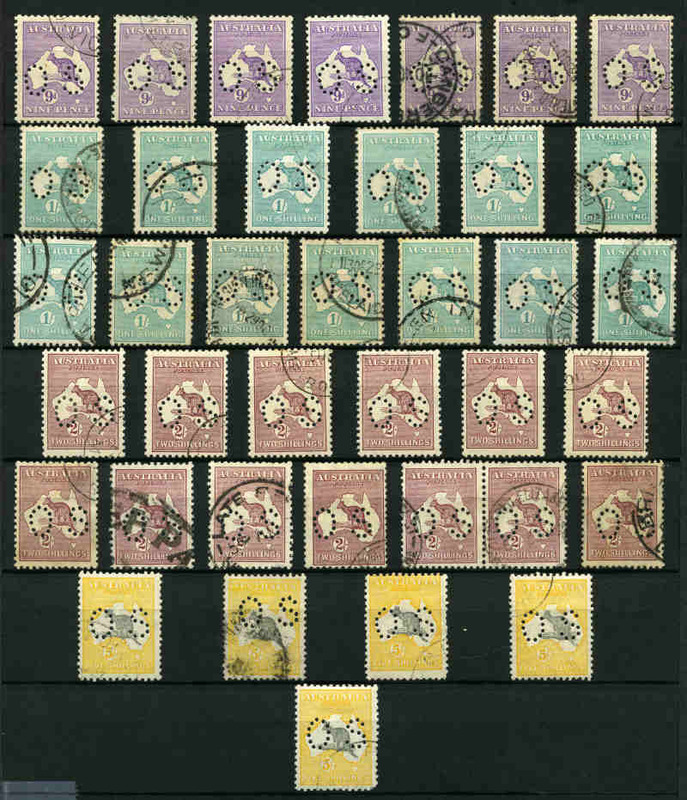 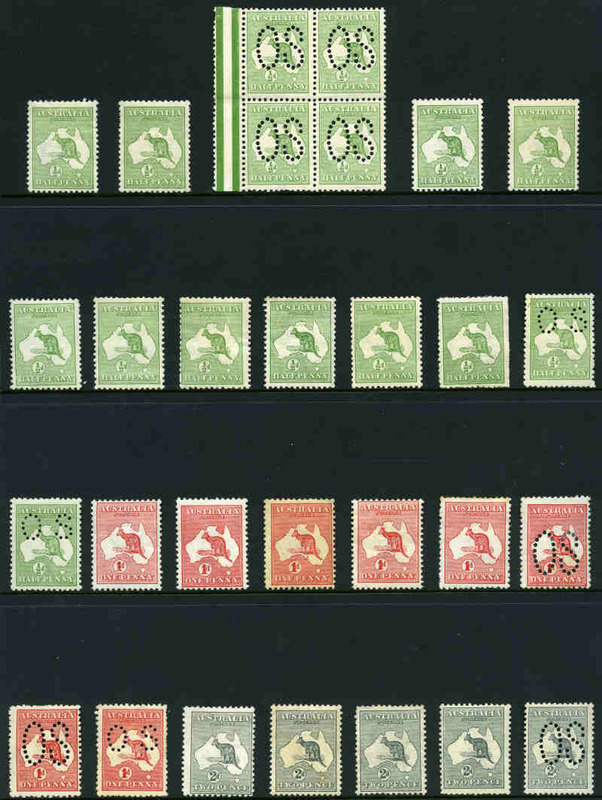 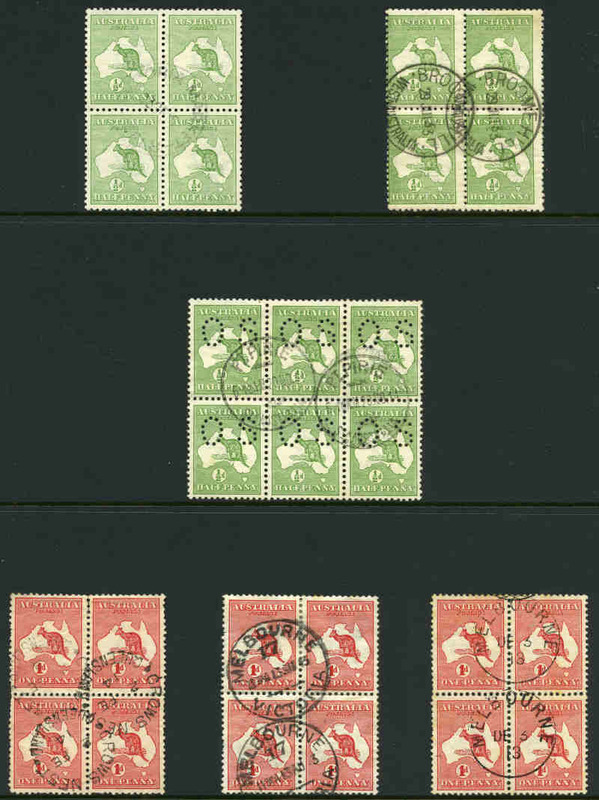 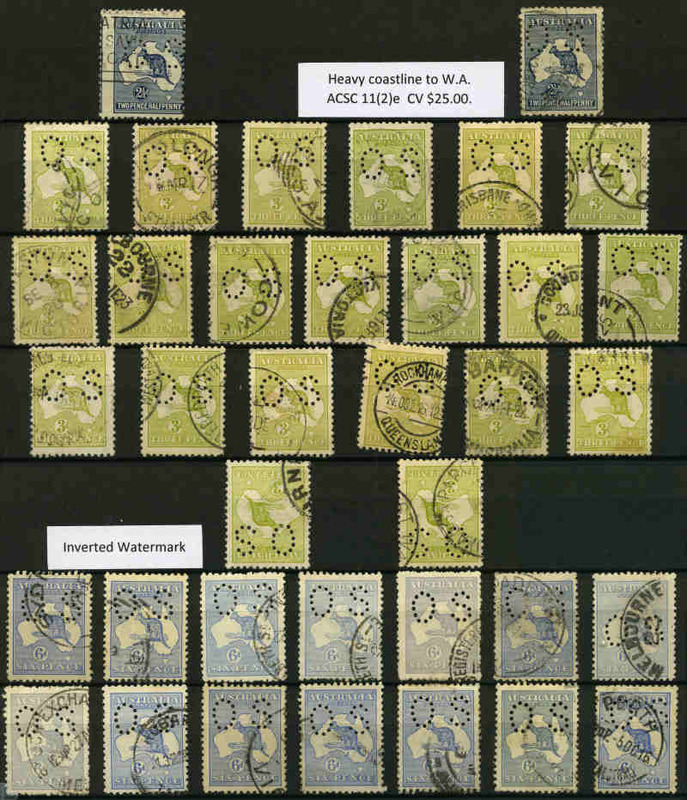 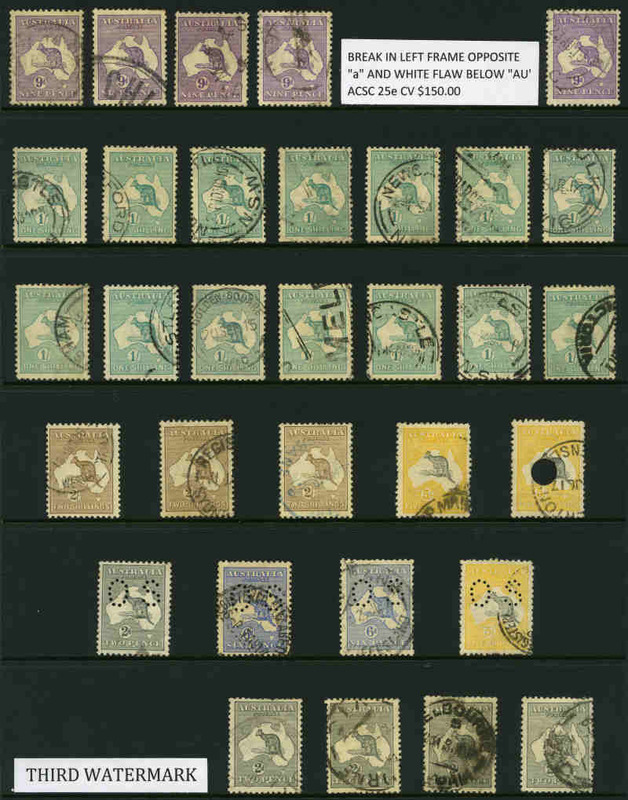 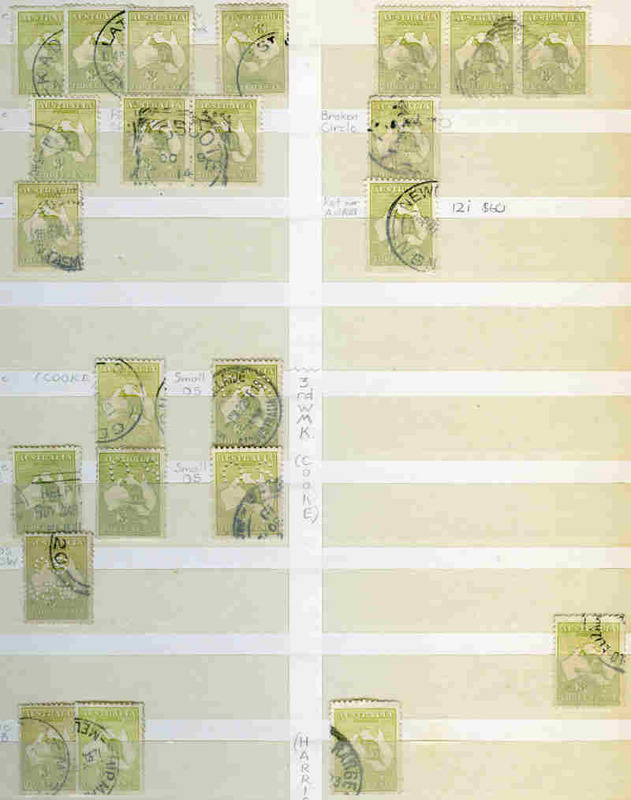 Selection of 57 postally used Kangaroo issues in blocks, mainly blocks of 4 or 6 including 1913 ½d Green (3), 1d Red (10, inc Die IIA block of 9 with vertical scratch through last "A" of "Australia" variety), 2½d Indigo, 3d Olive, 4d Orange and 6d Blue 1st Wmk, 1915 2½d Indigo and 9d Violet (2) 2nd Wmk, 1915-23 2d Grey, 3d Olive (4, one perforated OS NSW), 6d Blue (5, one with "Inverted Wmk"), 6d Brown (6, inc block of 12), 9d Violet (4), 1/- Emerald (5), and 2/- Maroon, 1929 6d Brown, 9d Violet and 1/- Emerald (3) Small Mult Wmk and 1932-45 9d (2) and 2/- Maroon (4) C of A Wmk. 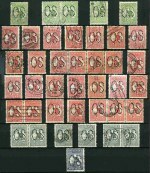 Mainly good used and several blocks perforated OS. 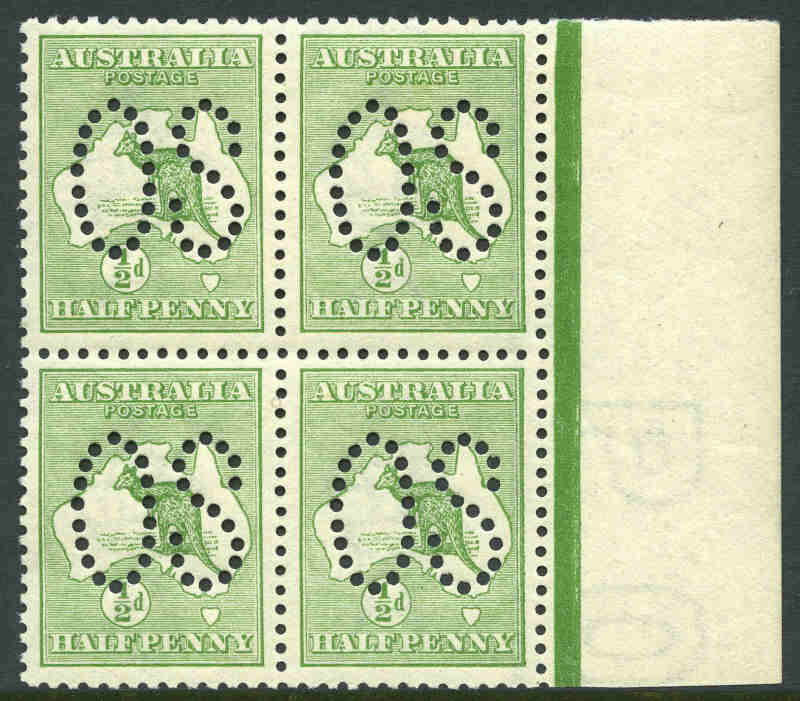 Usual variable condition with some short perfs, creasing and odd tear, but still attractive multiples. 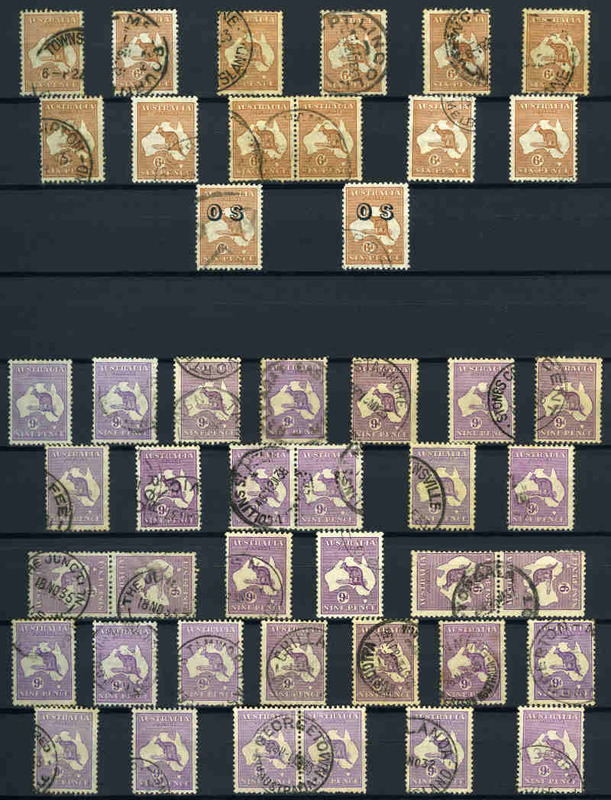 265 stamps. 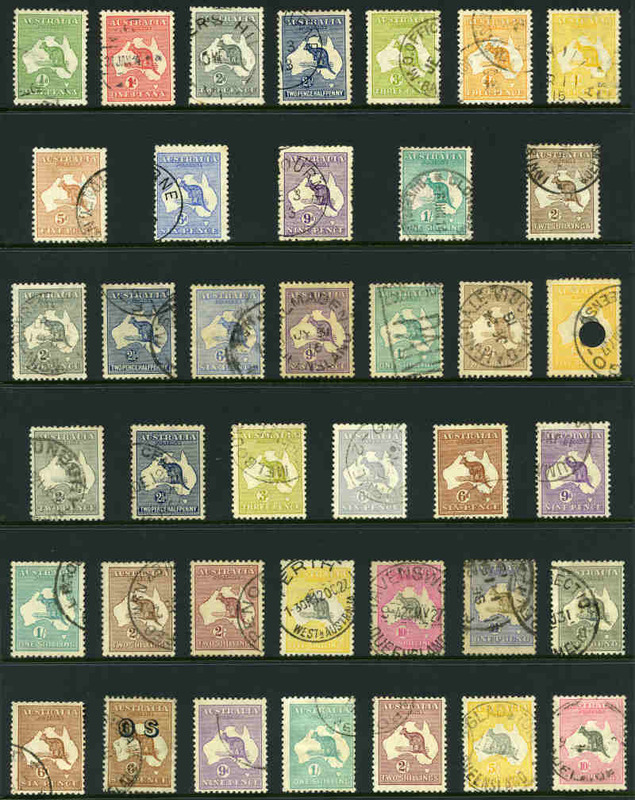 Collection of 48 different used Kangaroo issues including 1913 1st Wmk set to 2/- value, 1915 2nd Wmk set (5/- with telegraph puncture), 1915-24 3rd Wmk set to £1 Brown and Blue including £1 Grey with repaired telegraph puncture, 1929-32 Small Multiple Wmk set to 10/- value and 1932-45 C of A Wmk set including both OS overprint issues. 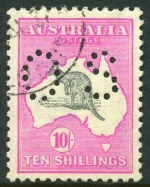 Generally good to fine used condition, with odd minor fault. 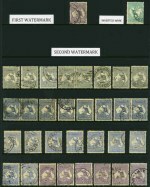 High retail value. 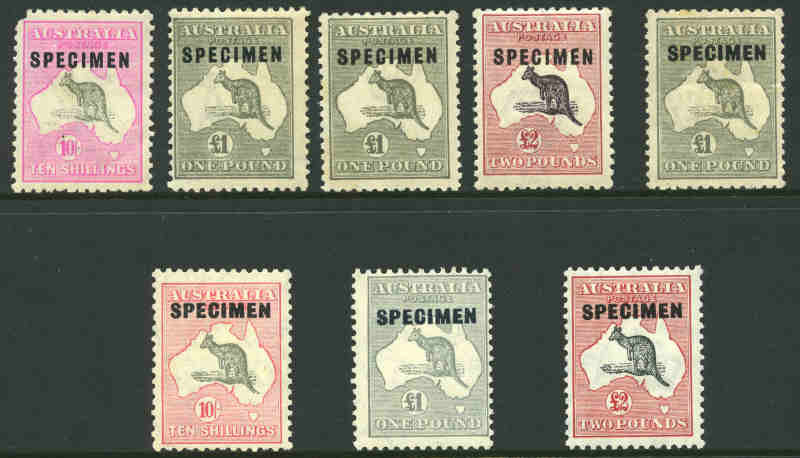 Selection of 73 used Kangaroo issues including few CTO with gum and some light duplication. 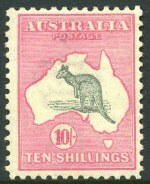 Noted 1932 10/- Grey and Pink 3rd Wmk (2). 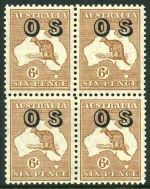 Usual varying condition. 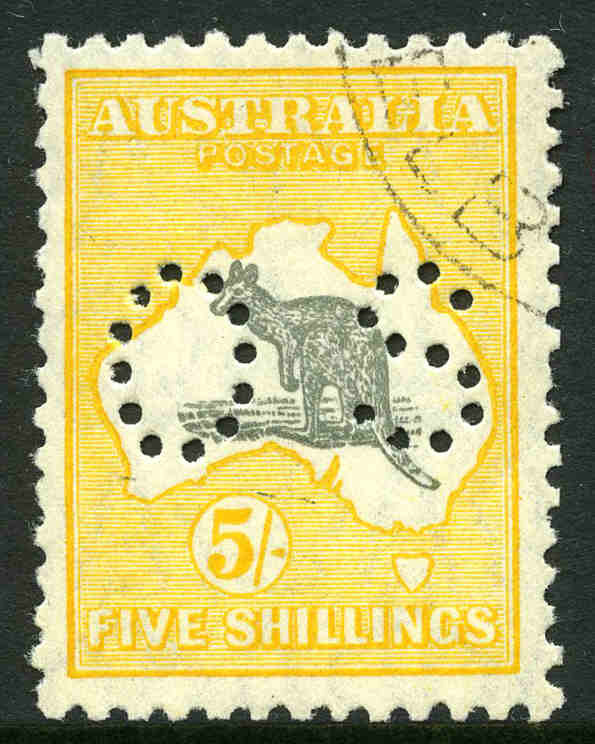 1913 ½d (43), 1d (131), 2d (31), 2½d (12), 3d (12), 4d (17), 5d (7), 6d (16), 9d (17), 1/- (45) and 2/- 1st Wmk, 1915 2d, 2½d, 6d (9), 9d (4) and 1/- (5) 2nd Wmk, 1915-24 2d (27), 2½d (9), 3d (36), 6d Blue (33), 6d Chestnut (15), 9d (52), 1/- (34), 2/- Brown (9), 2/- Maroon (3), 5/- (3) and 10/- (2, both with telegraph puncture) 3rd Wmk, 1929-32 6d (7), 6d O/P OS, 9d (17), 1/- (21), 2/- (19) and 5/- Small Mult Wmk and 1932-45 6d (12), 6d O/P OS (2), 9d (32), 2/- (19), 5/- (15), 10/- (3) and £1 C of A Wmk Kangaroo's used including a range of multiples in pairs and strips with several varieties. 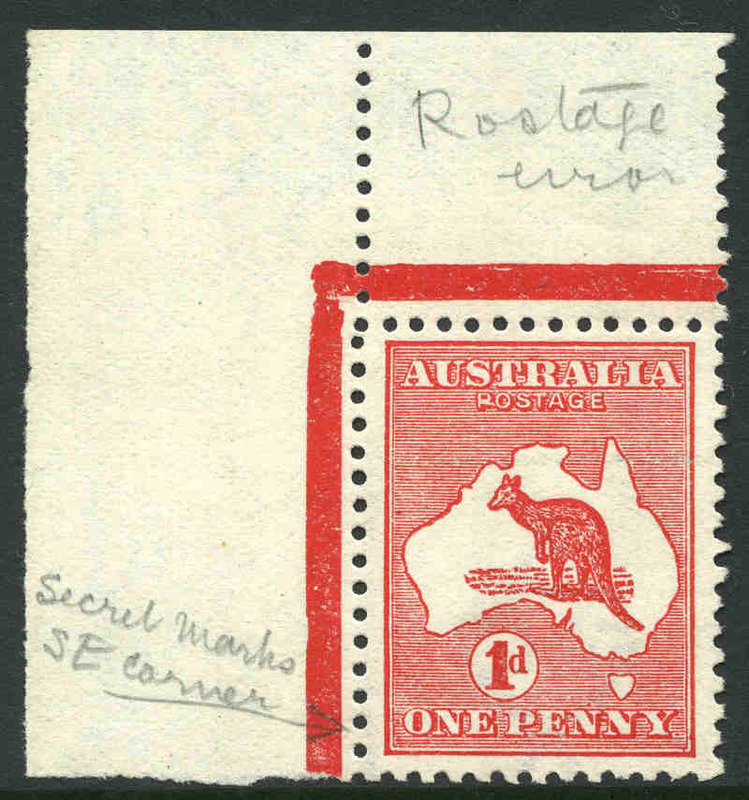 Usual variable condition, but well worth inspecting. 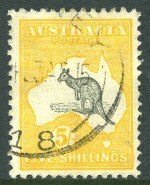 Accumulation of hundreds of used Kangaroo issues with numerous duplicates in small stockbook. 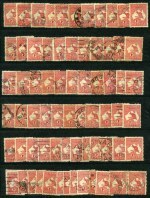 Usual variable condition. 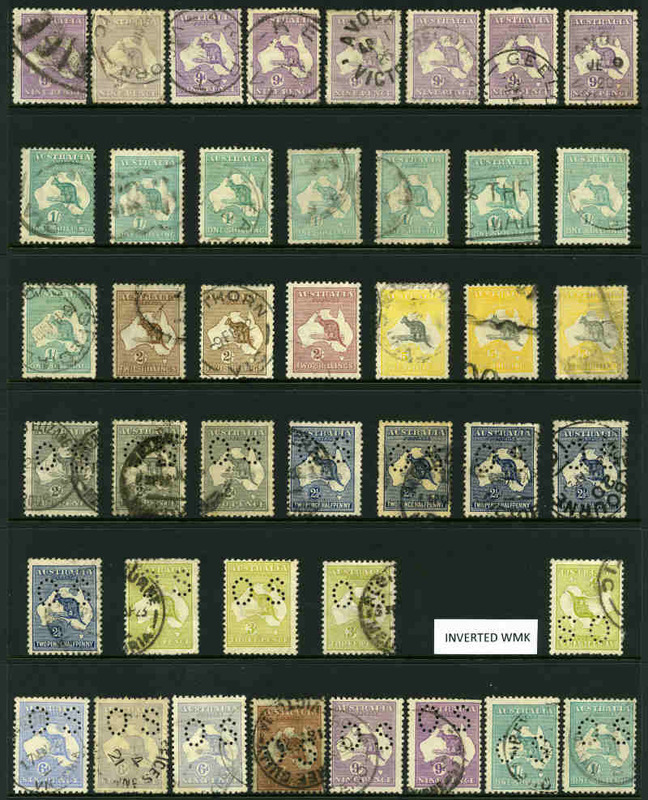 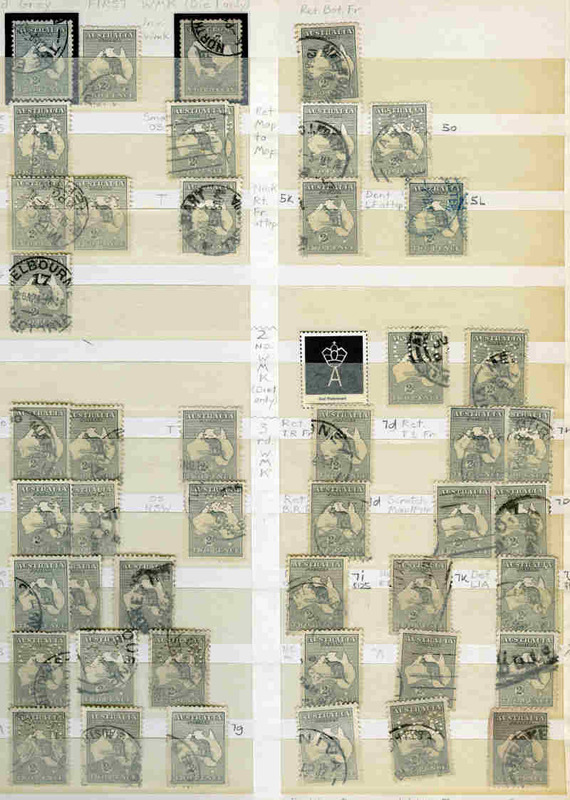 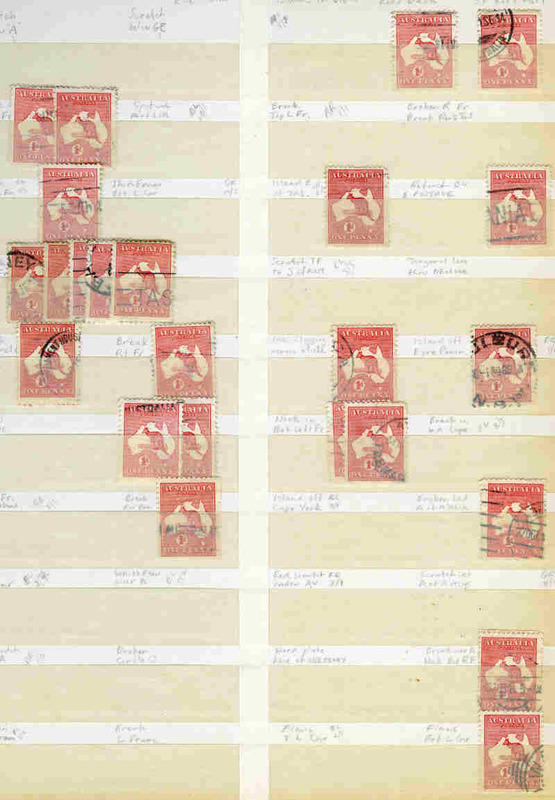 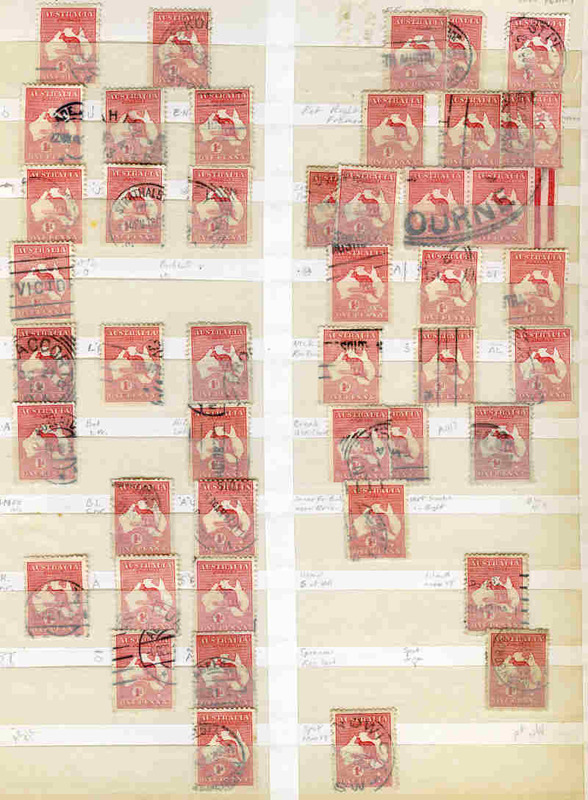 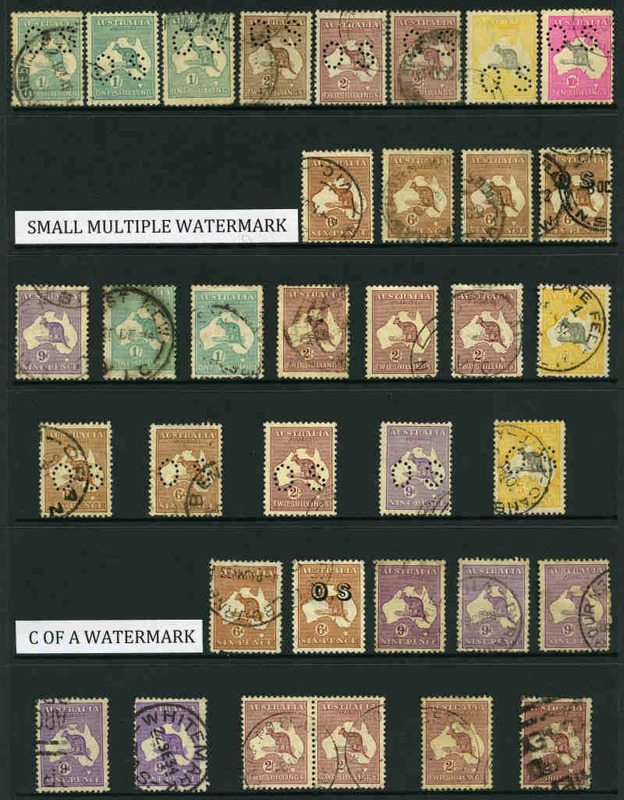 Accumulation of hundreds of used Kangaroo issues to 5/- value with all watermarks represented including many perforated OS issues and a handy range of varieties, in Lighthouse stockbook. 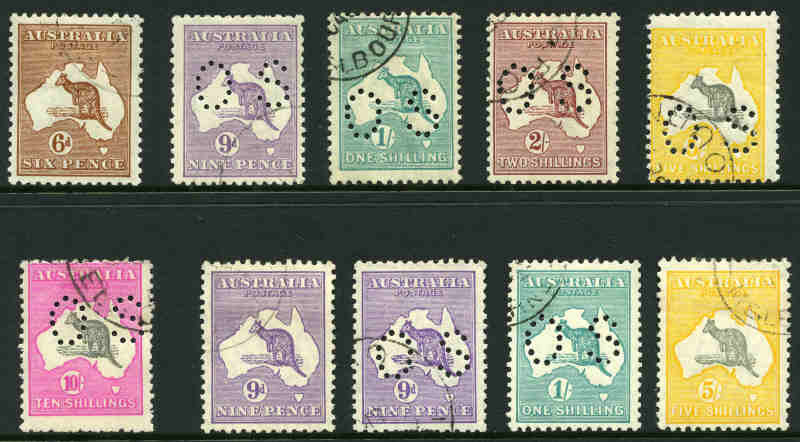 Noted 1/- Blue-Green Inverted Wmk (CTO) and 1913 2/- Brown Perf Large OS 1st Wmk, 6d Blue Die II and 9d Violet Die IIB Inverted Wmk, 2/- Brown Flaw on "S" of "Australia" and Break in left frame near top and 2/- Maroon Perf OS Chopped neck kangaroo 3rd Wmk, 5/- Grey and Yellow Small Mult Wmk Perf OS CTO. 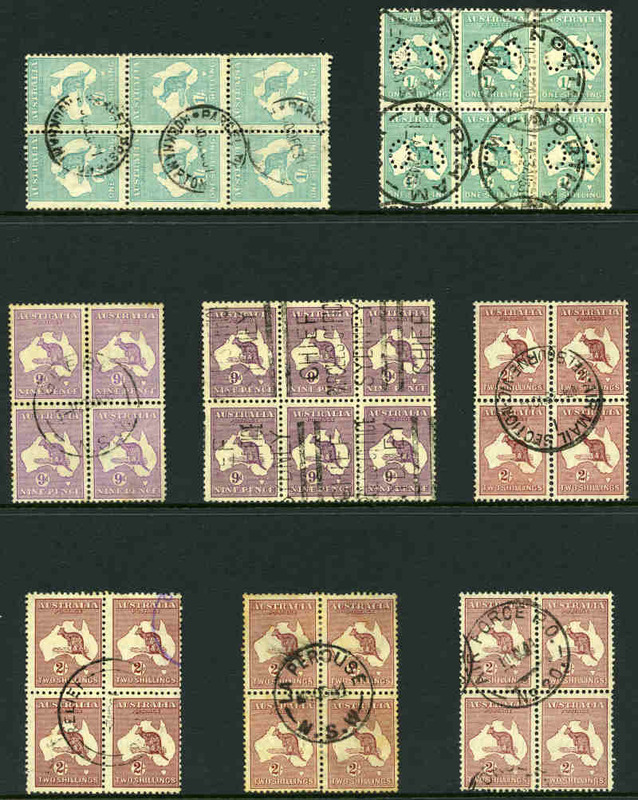 Odd mint copy and usual variable condition. 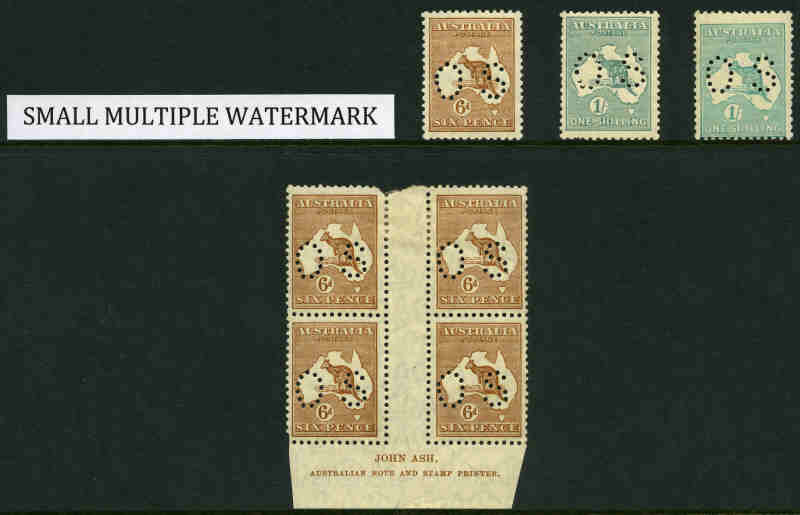 Selection of 189 used Kangaroo issues with all watermarks represented including a few CTO, some perforated OS and odd variety with varying duplication. 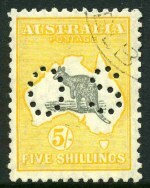 Noted 2/- Brown (3) and 5/- Grey and Yellow (3, one with telegraph puncture) 2nd Wmk and 3rd Wmk set to 10/- value perforated OS. 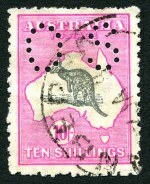 Usual variable condition. 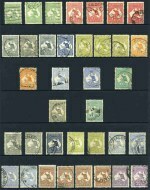 Collection of 46 different used Kangaroo issues perforated OS. 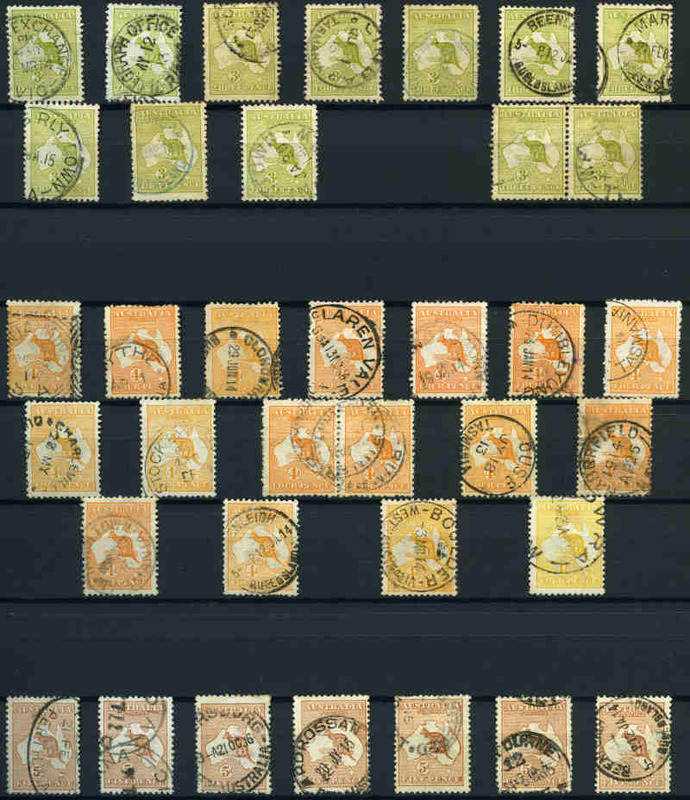 Noted 1913 1st Wmk Large OS set to 5/- value inc 4d Yellow-Orange and Small OS set to 1/- value, 1915 2nd Wmk set, 1915-24 3rd Wmk set to 10/- value inc 3d Olive Die II and 1929-32 Small Multiple Wmk set to 5/- value. 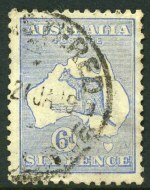 5/- 1st Wmk with heavy cancel and small repaired tear. 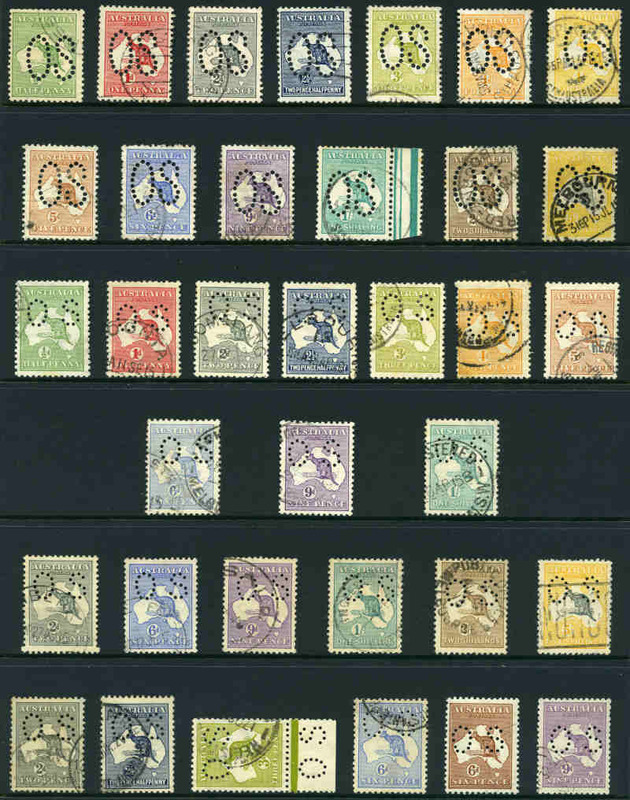 Generally good to fine used condition including several CTO. 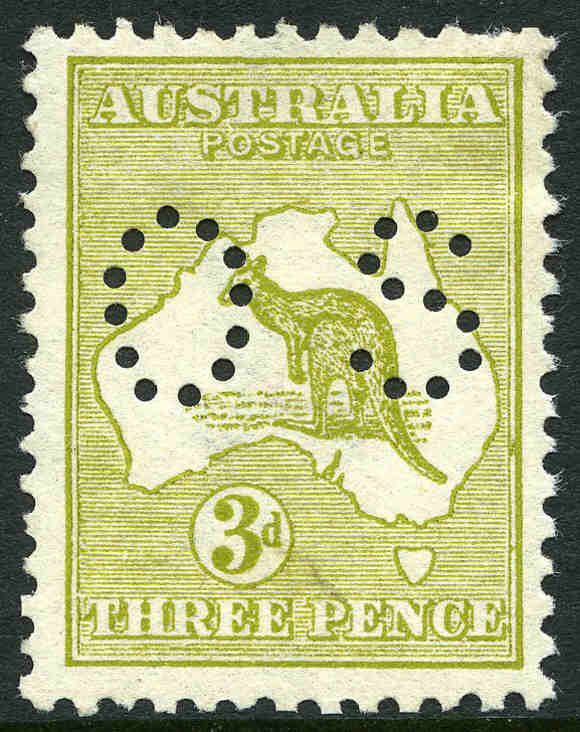 Odd minor fault. 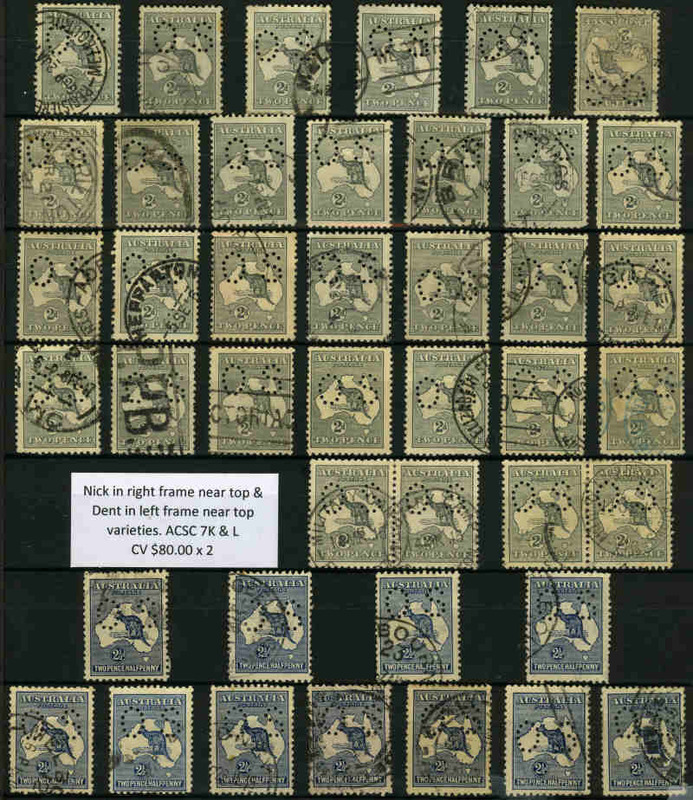 High retail value. 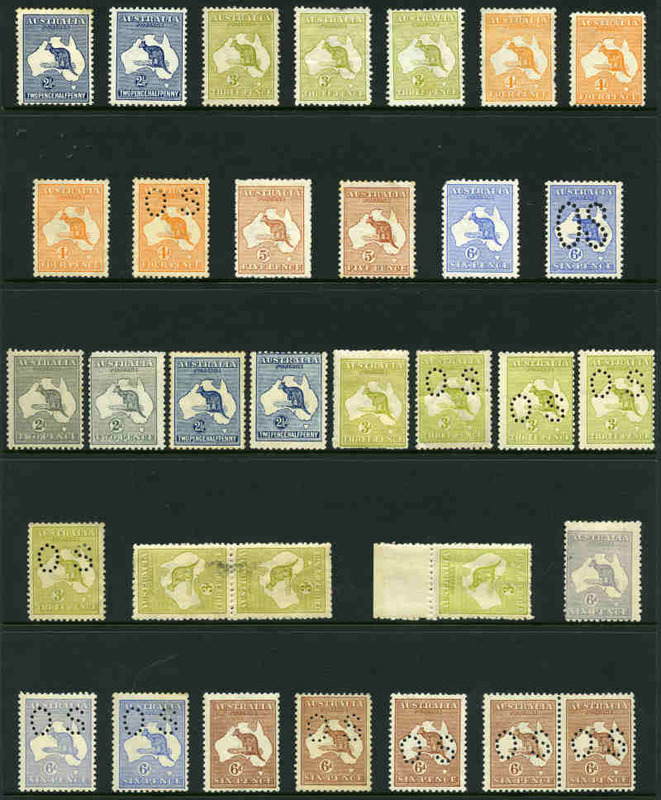 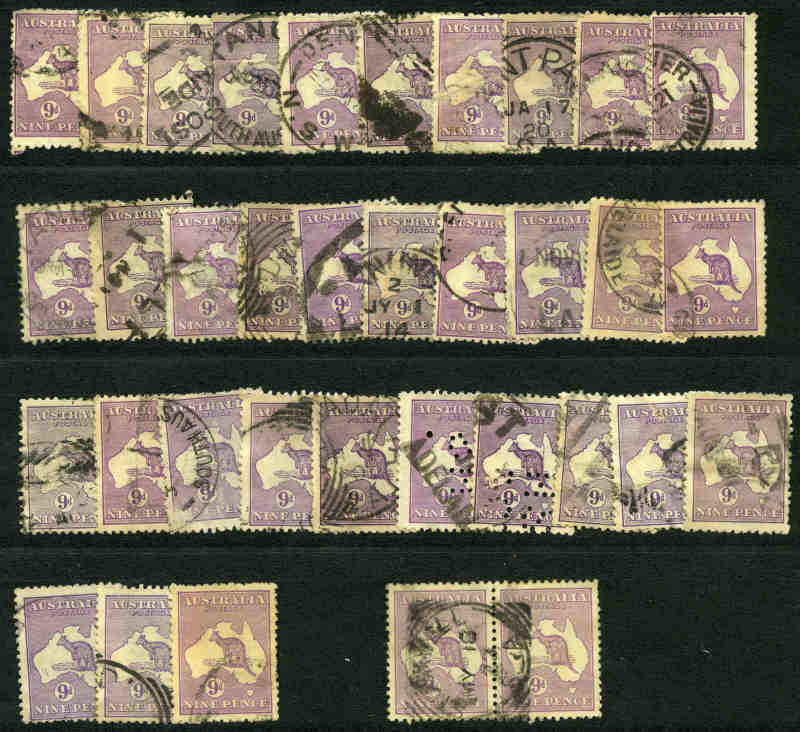 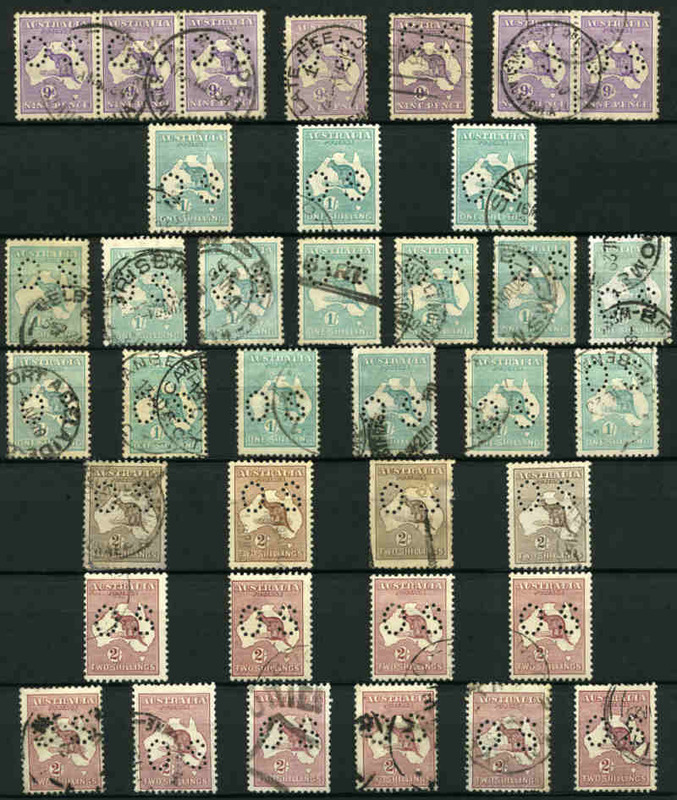 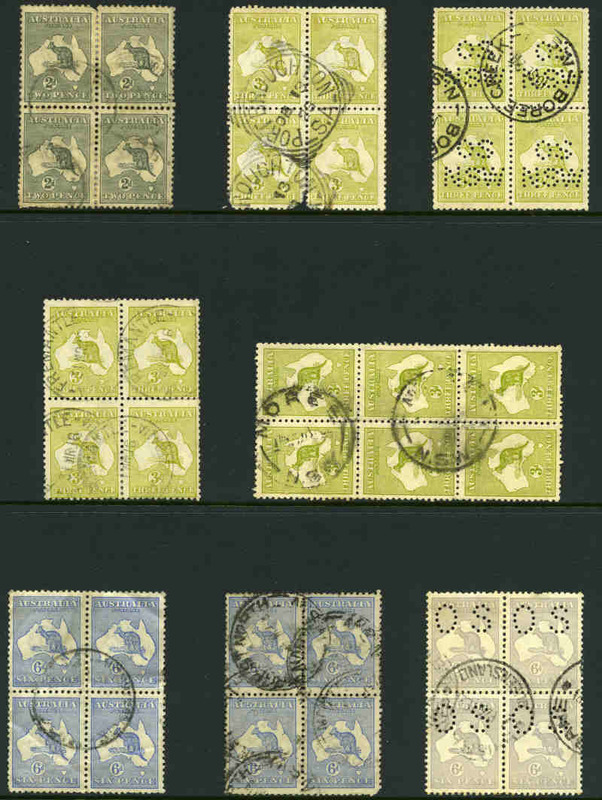 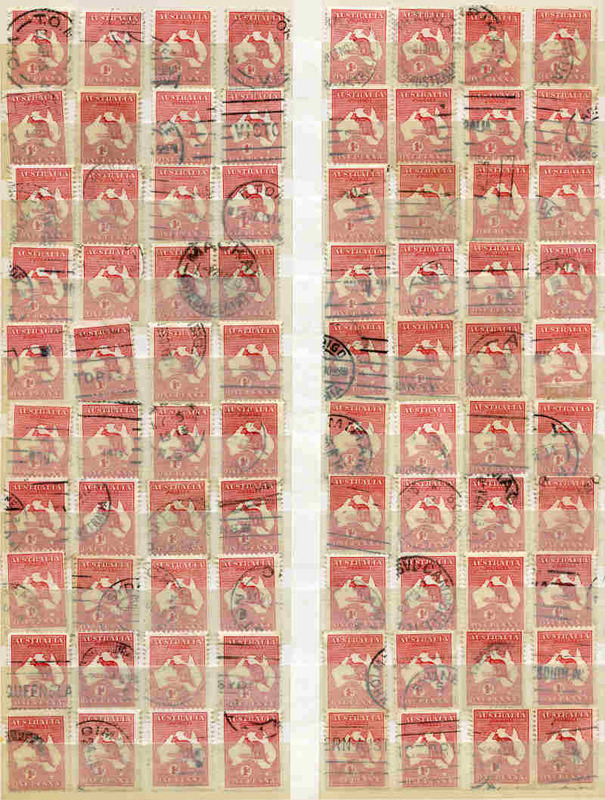 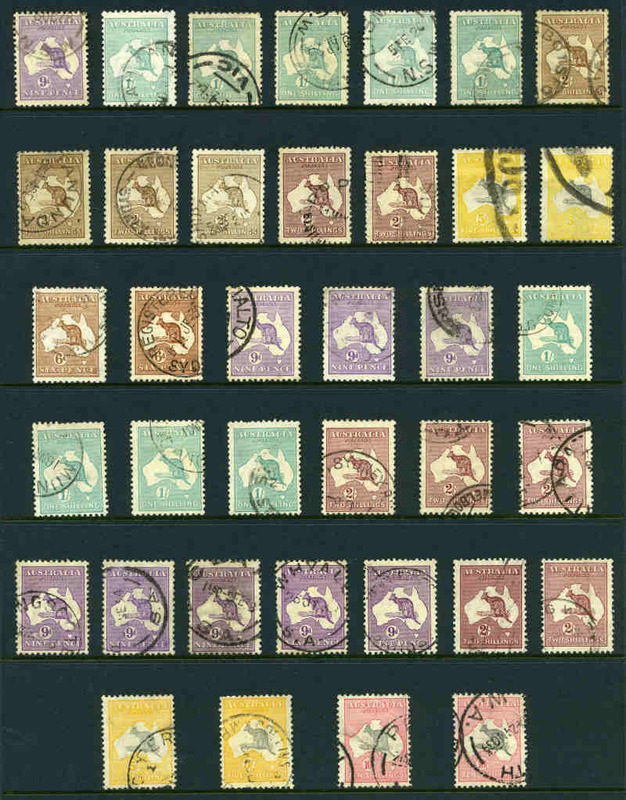 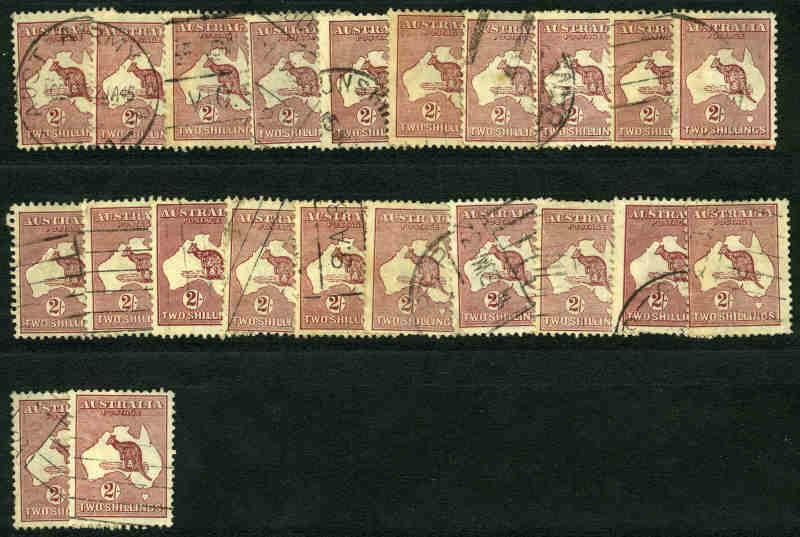 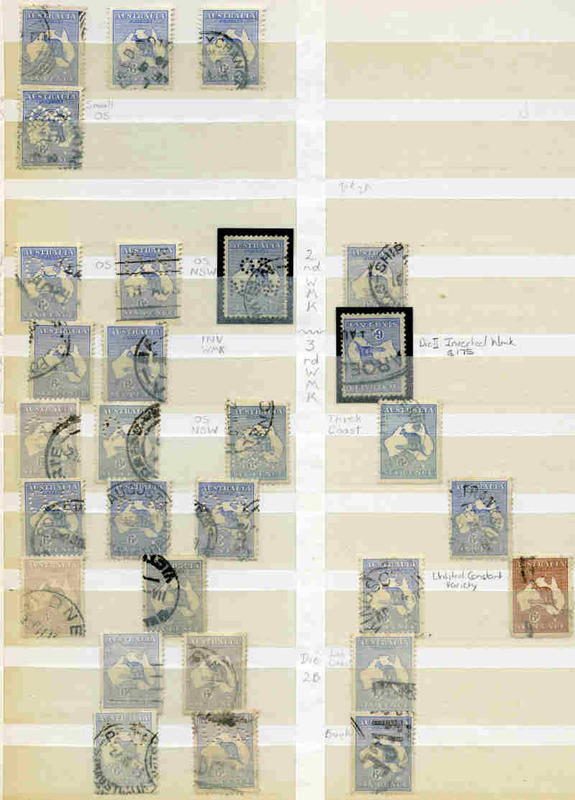 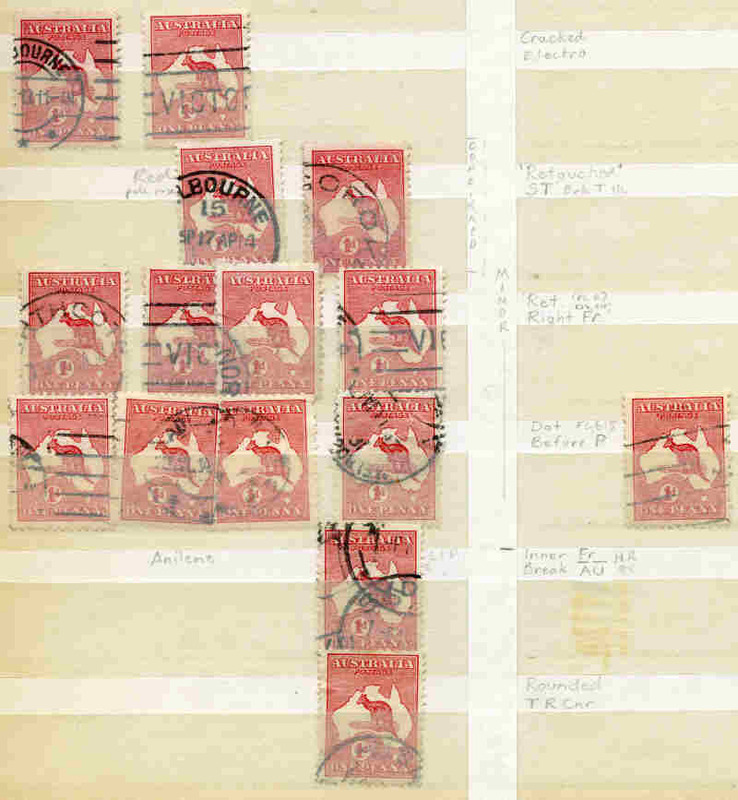 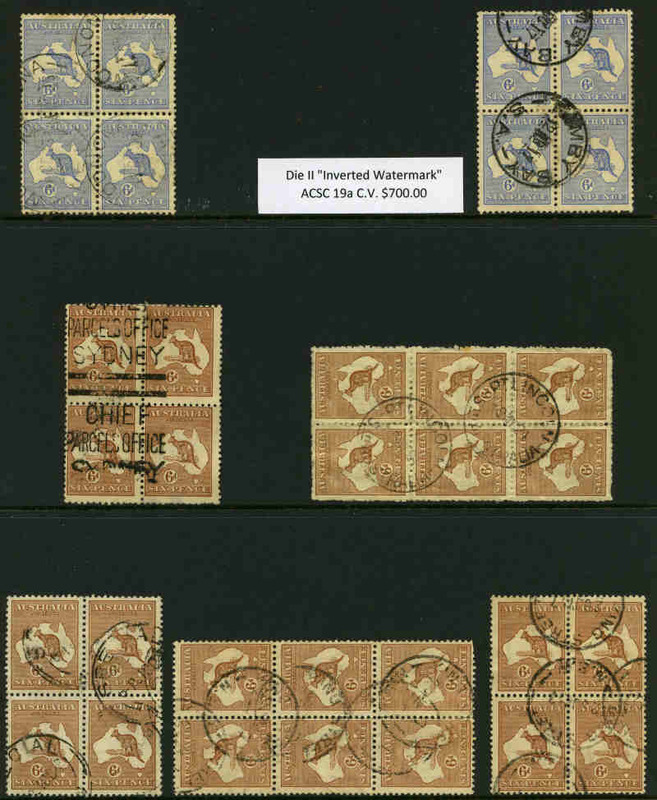 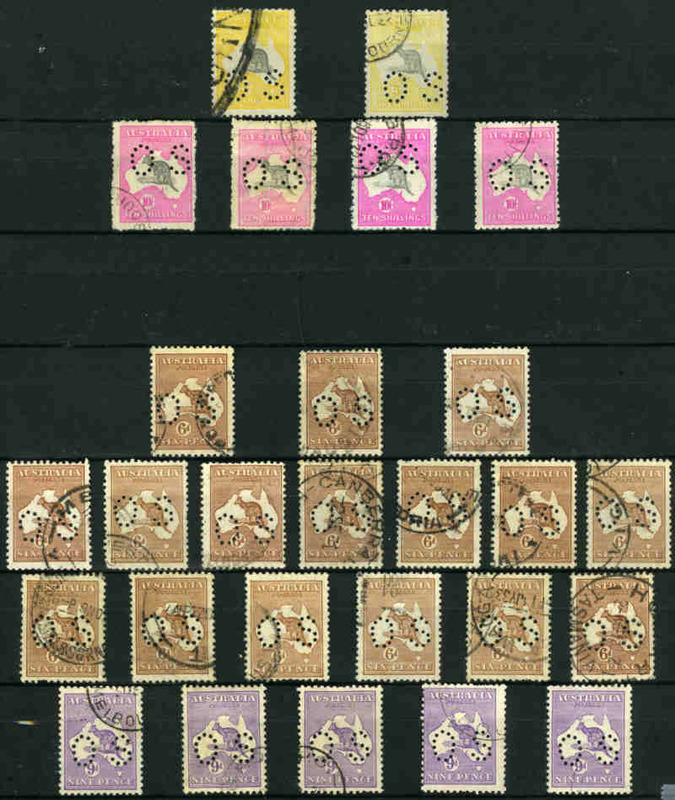 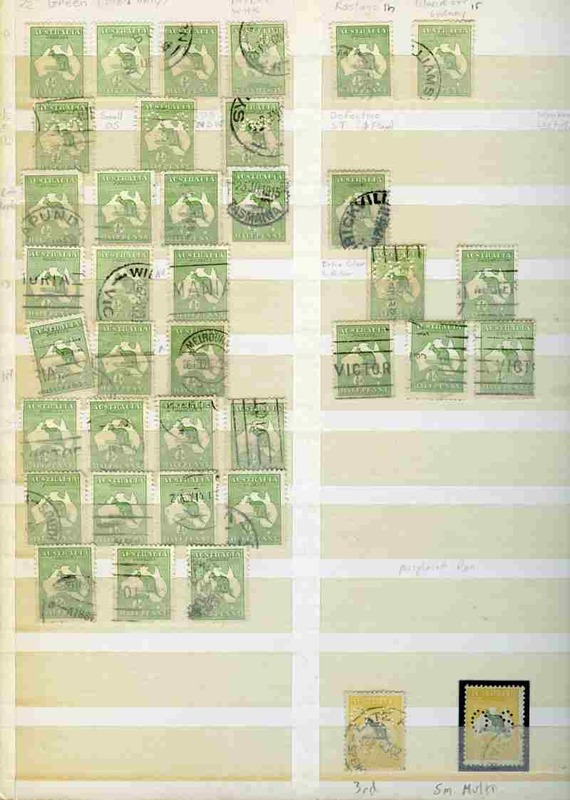 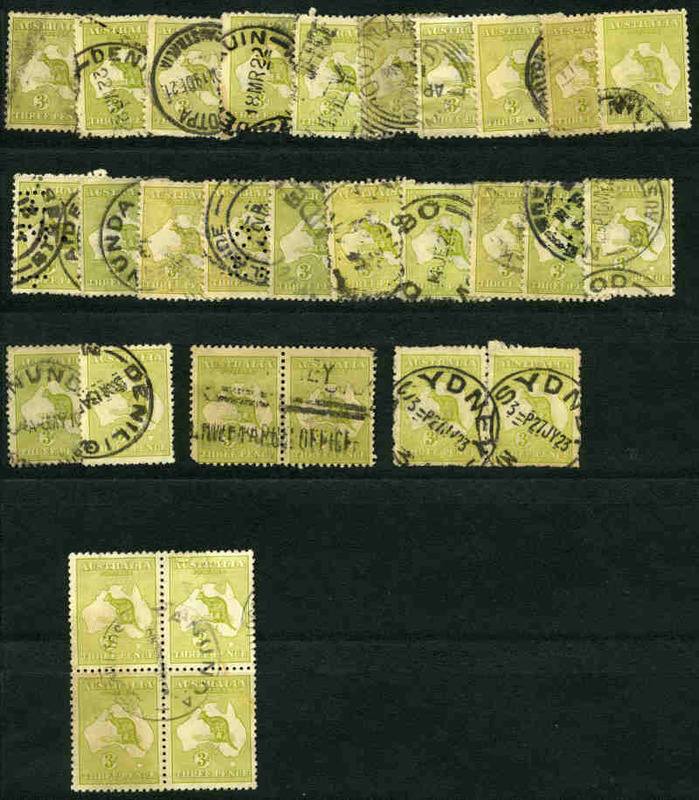 Selection of 364 used Kangaroo issues perforated OS including 1913 2½d, 4d (12), 5d (7), 6d (5), 9d (4), 1/- (6) and 2/- Large OS and 2½d, 4d, 5d (10), 6d (9), 9d (6) and 1/- (5) Small OS 1st Wmk, 1915 9d, 1/- (2), 2/- (2) and 5/- 2nd Wmk, 1915-24 6d Blue (33), 9d (14), 1/- (16), 2/- Brown (4), 2/- Maroon (10), 5/- (2) and 10/- (4) 3rd Wmk and 1929-32 2/- (13) and 5/- (5) Small Multiple Wmk. 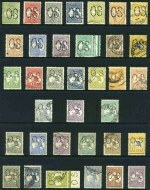 Generally good used including several CTO and few varieties. 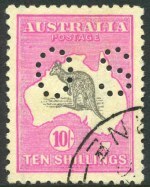 Usual variable condition. 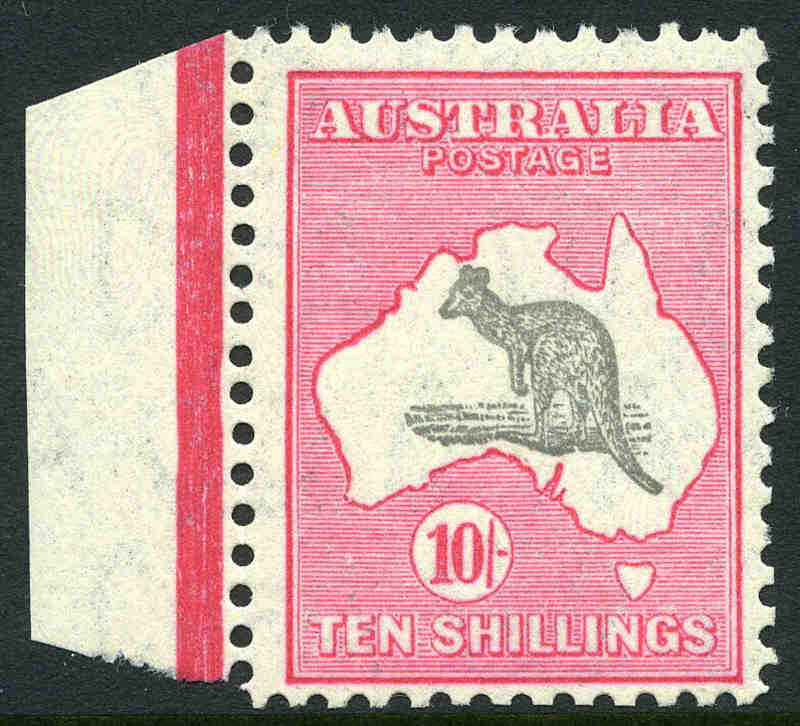 Accumulation of many hundreds of used Kangaroo issues mostly, off paper in small box. 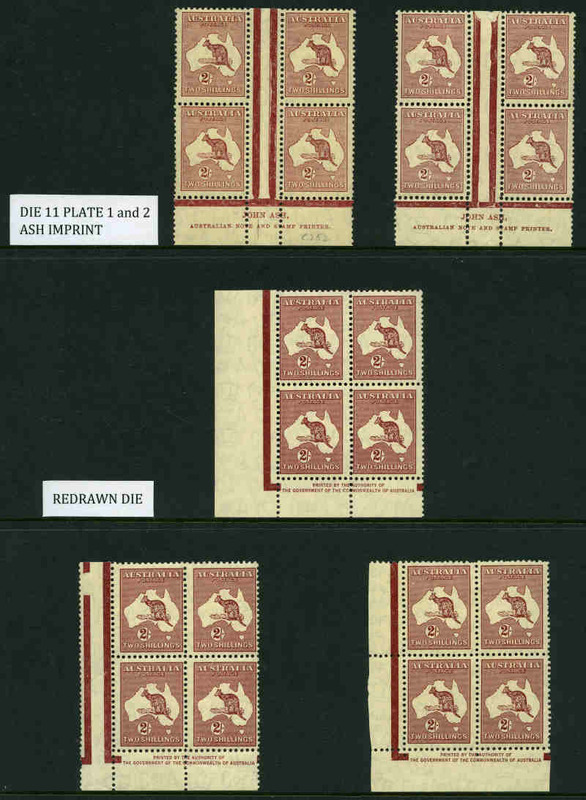 Predominately 1d Reds, but includes a good range of other values to 5/-. 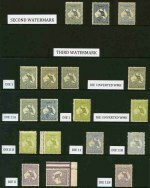 Variable condition.